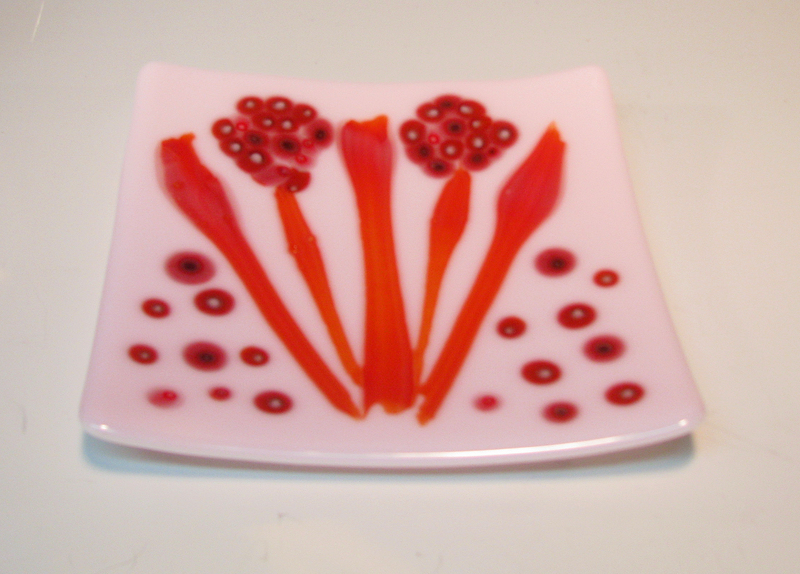 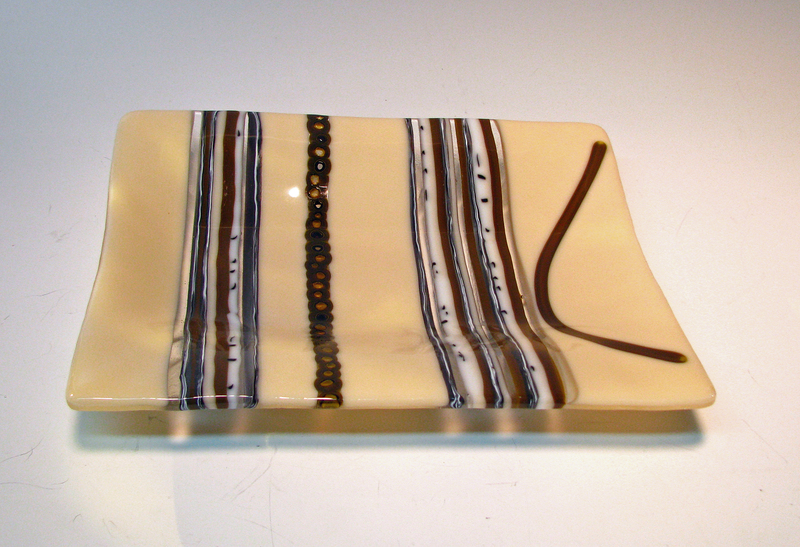 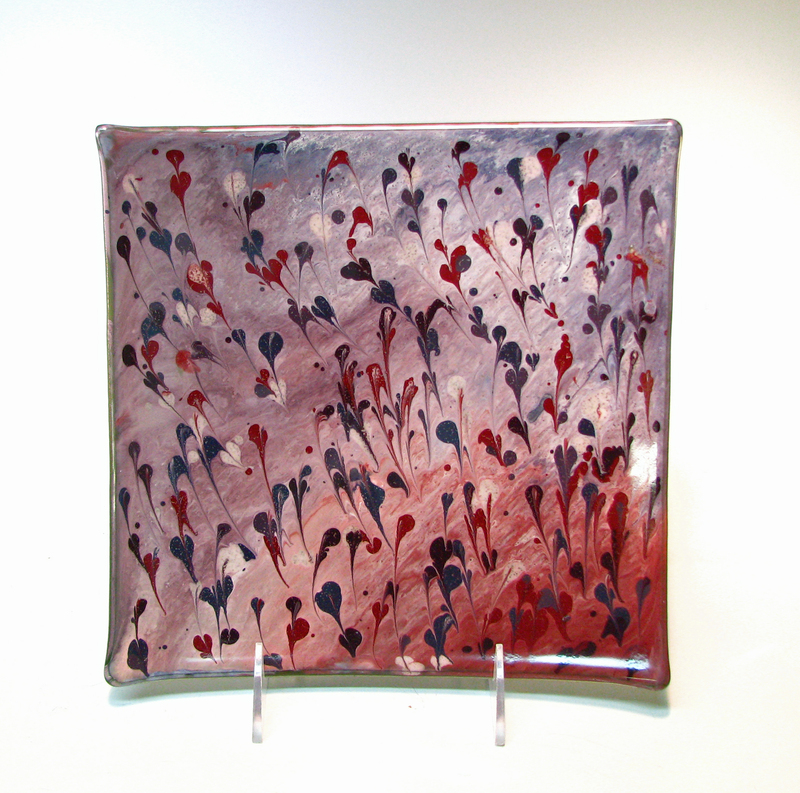 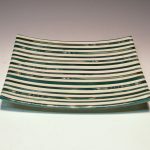 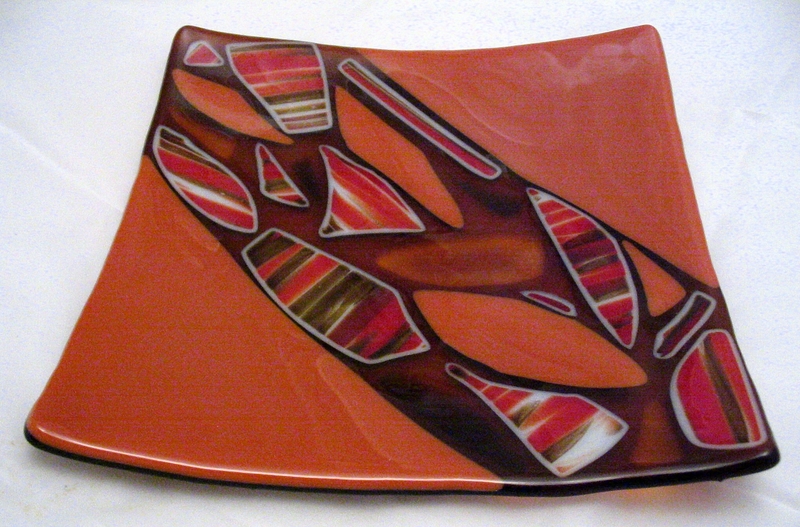 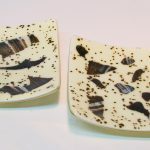 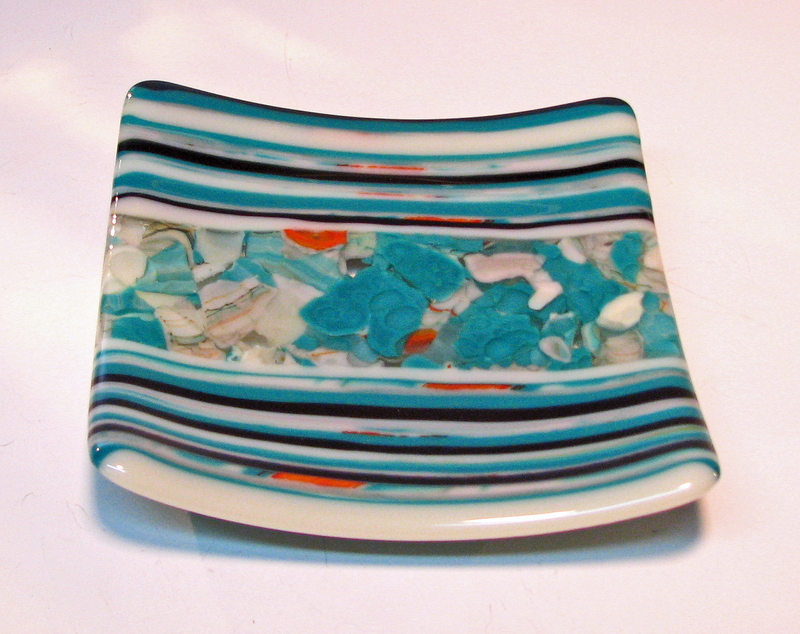 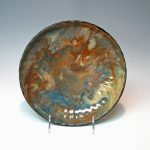 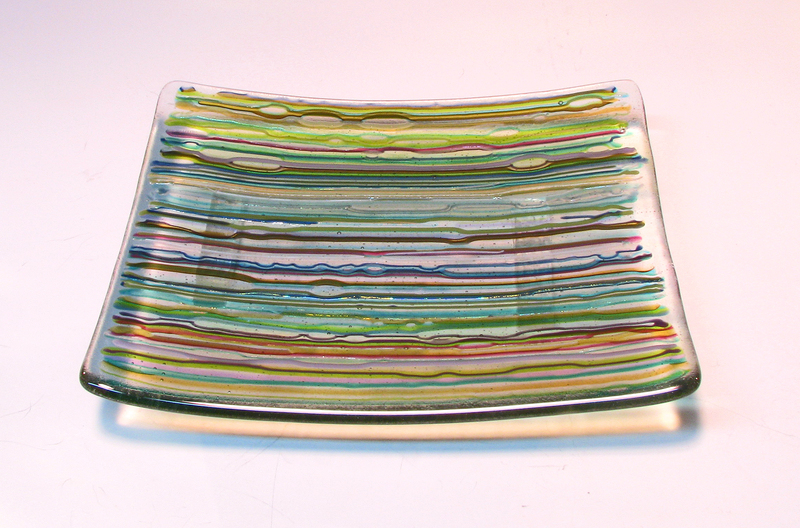 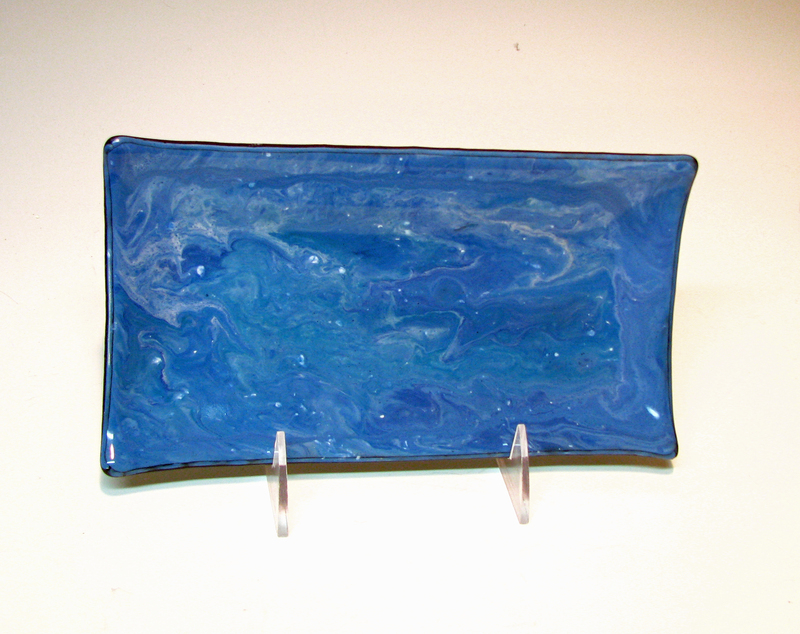 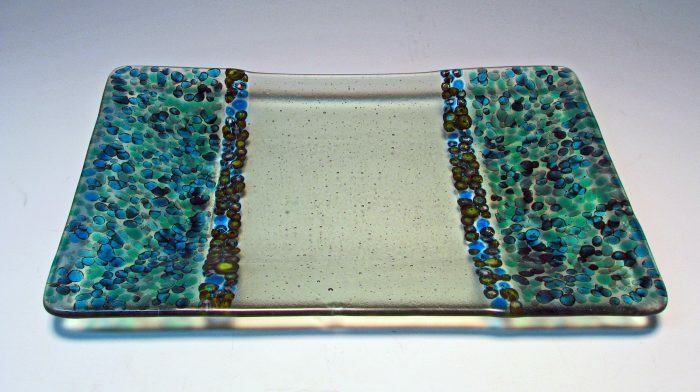 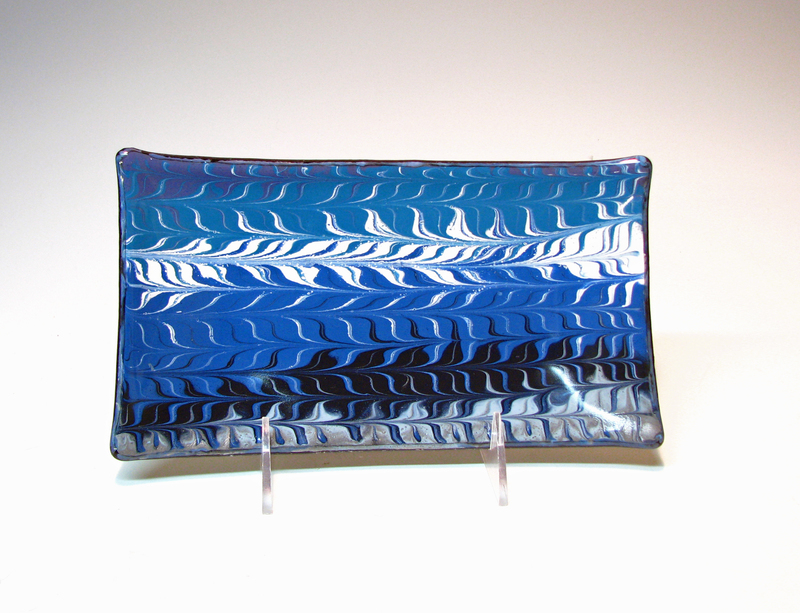 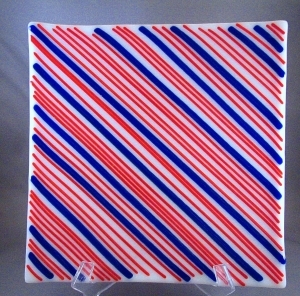 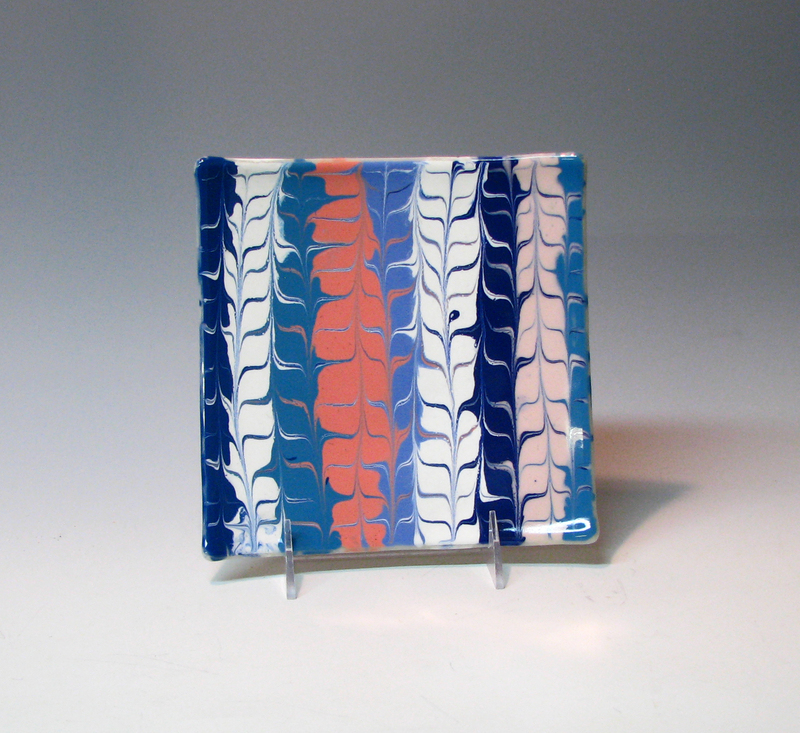 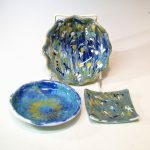 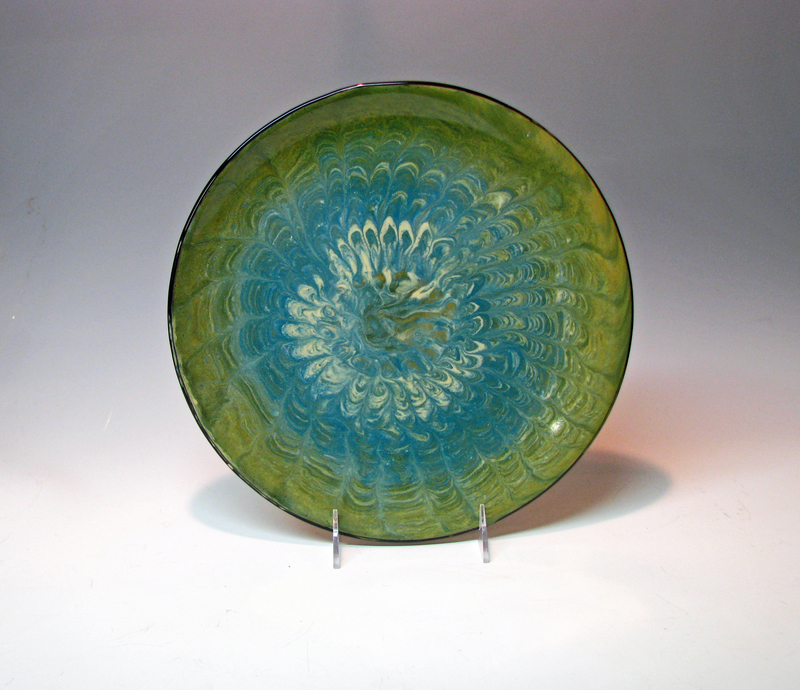 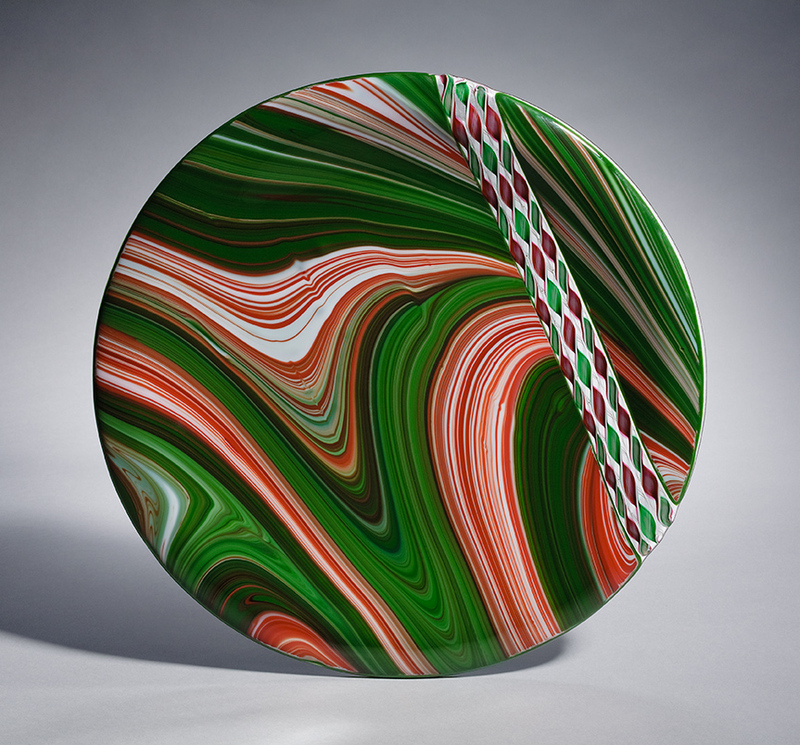 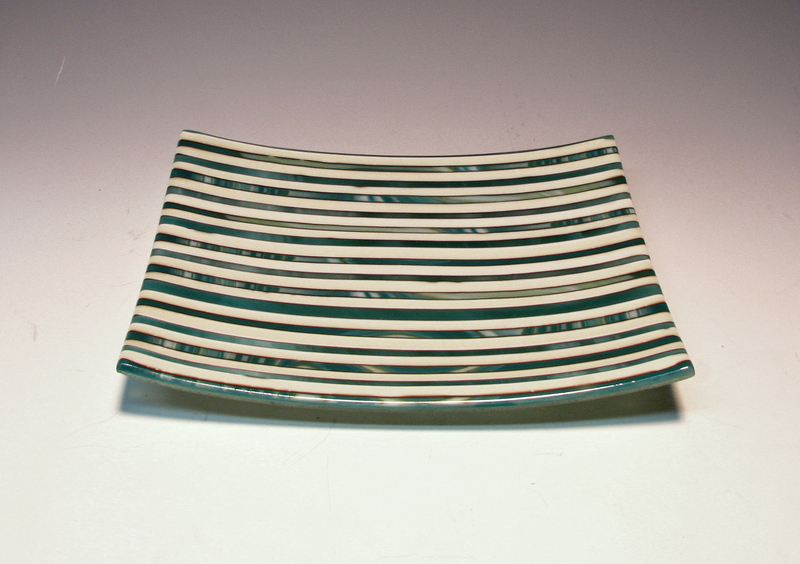 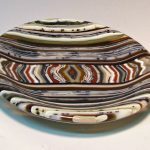 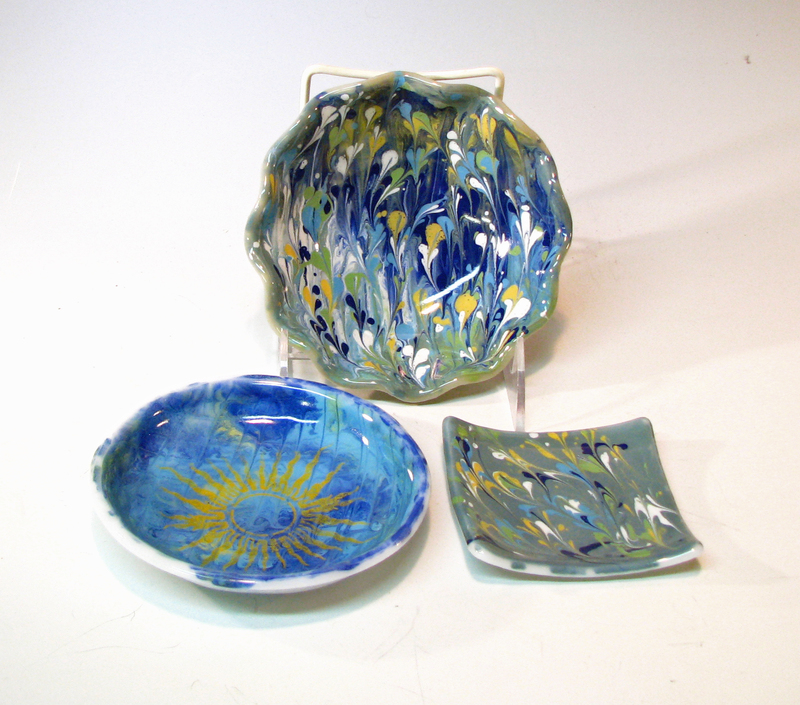 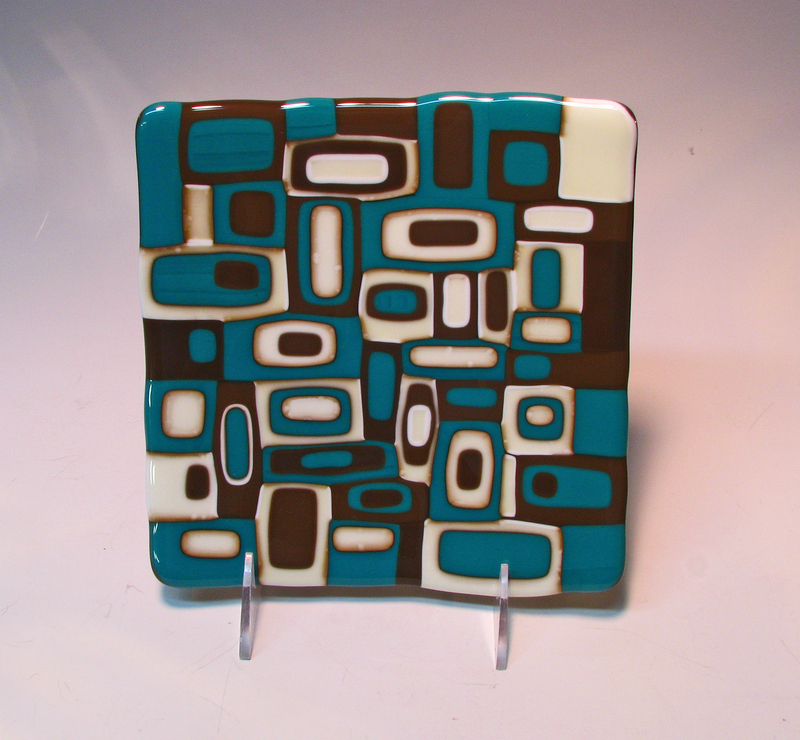 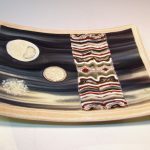 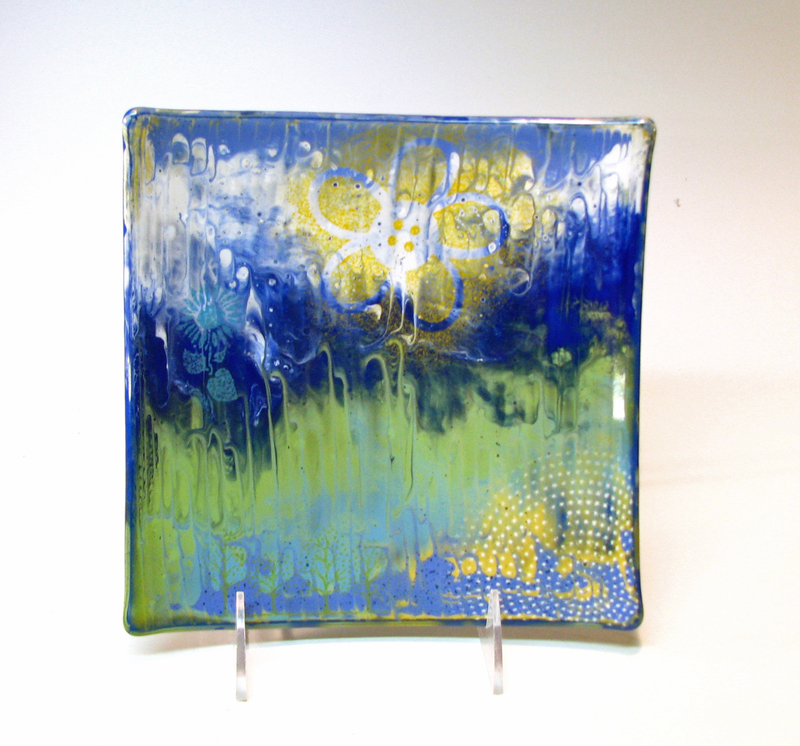 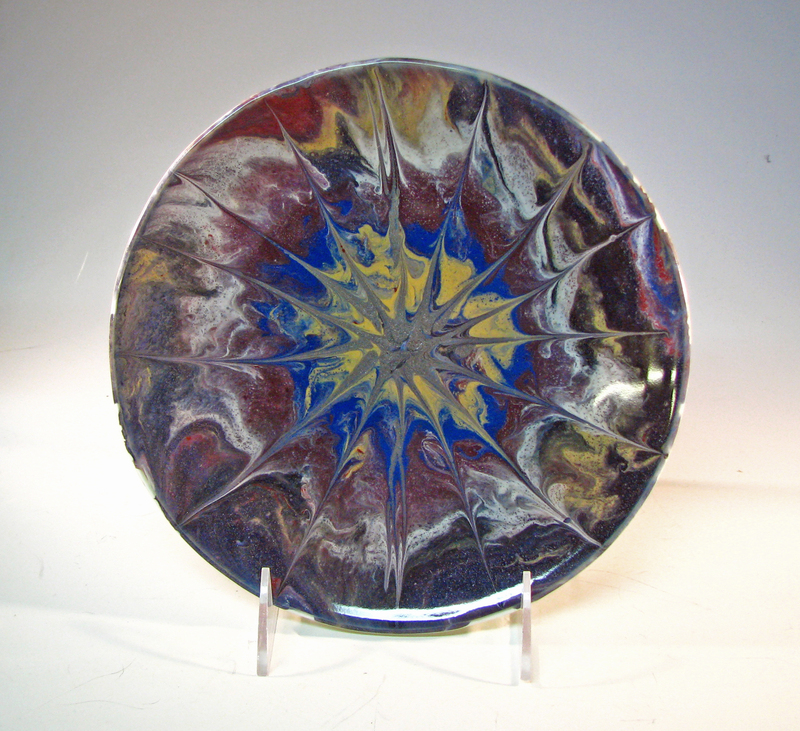 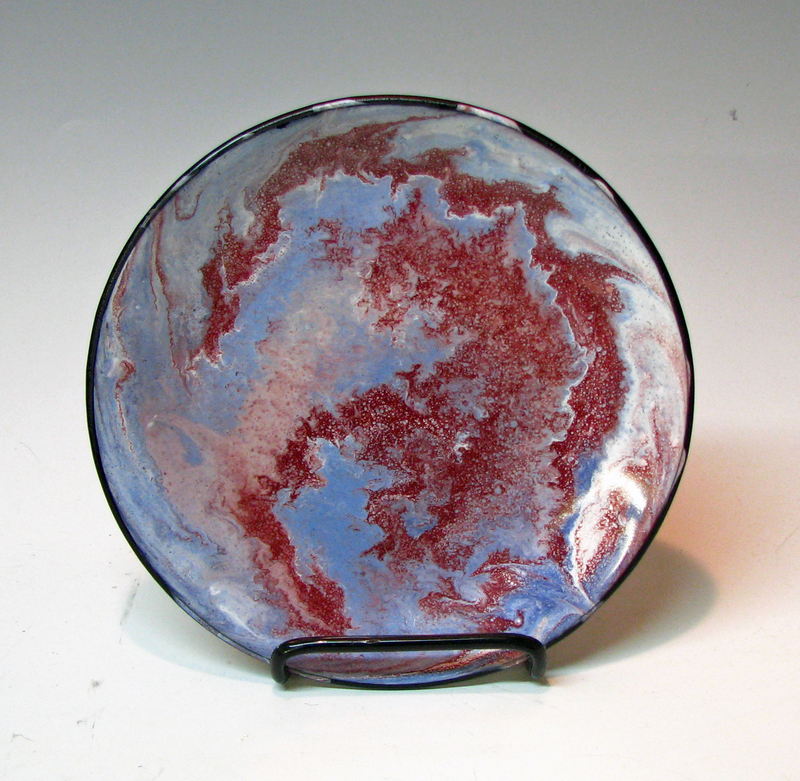 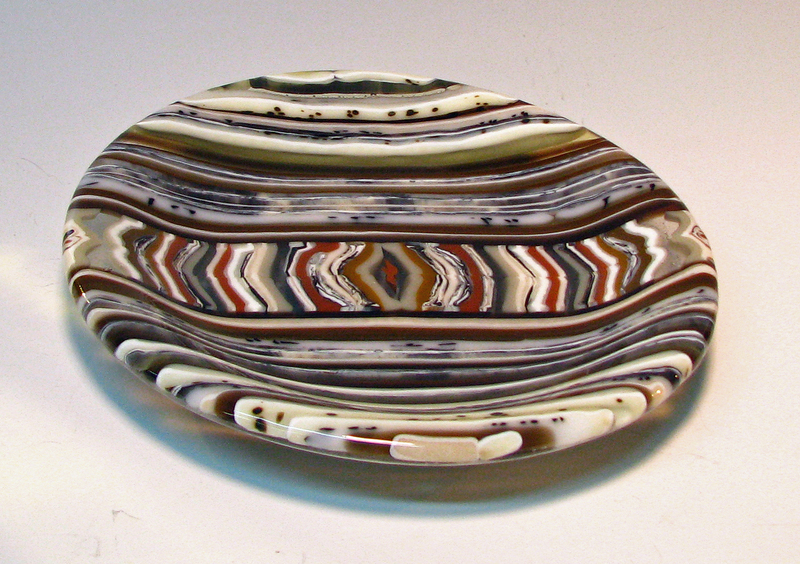 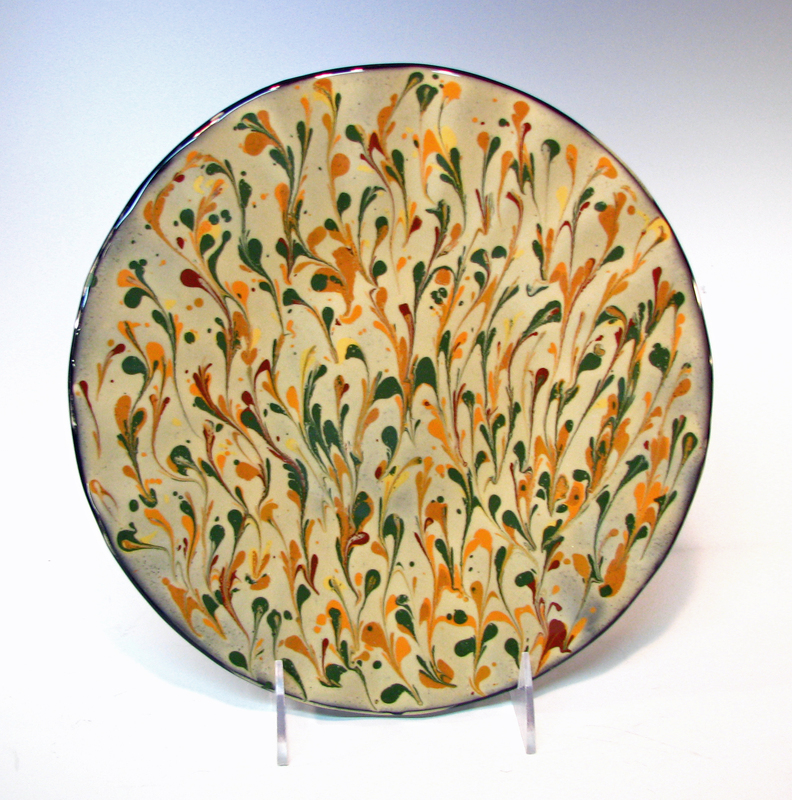 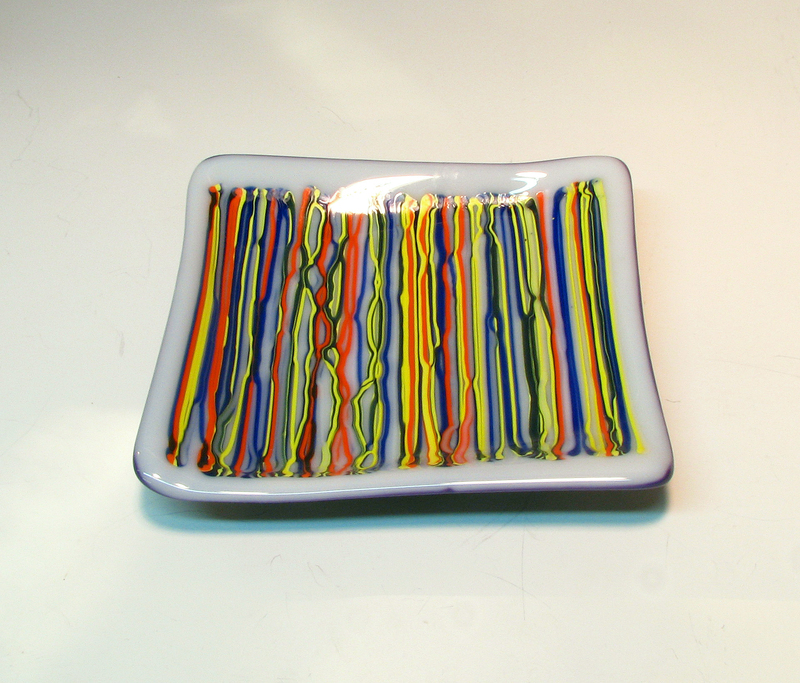 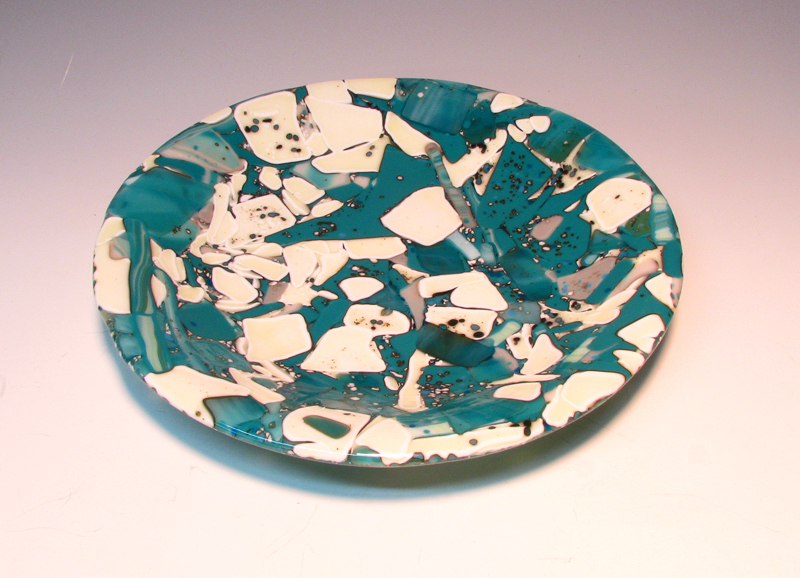 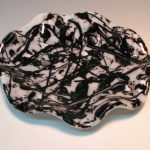 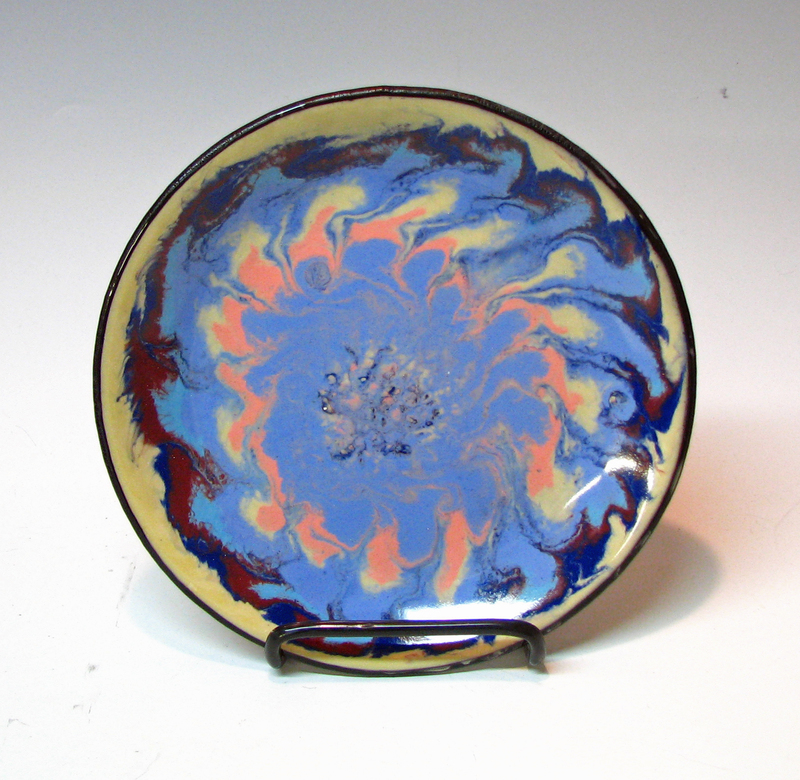 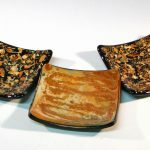 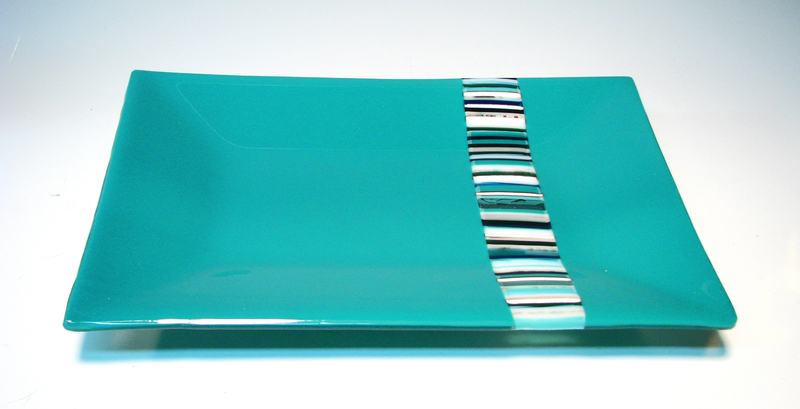 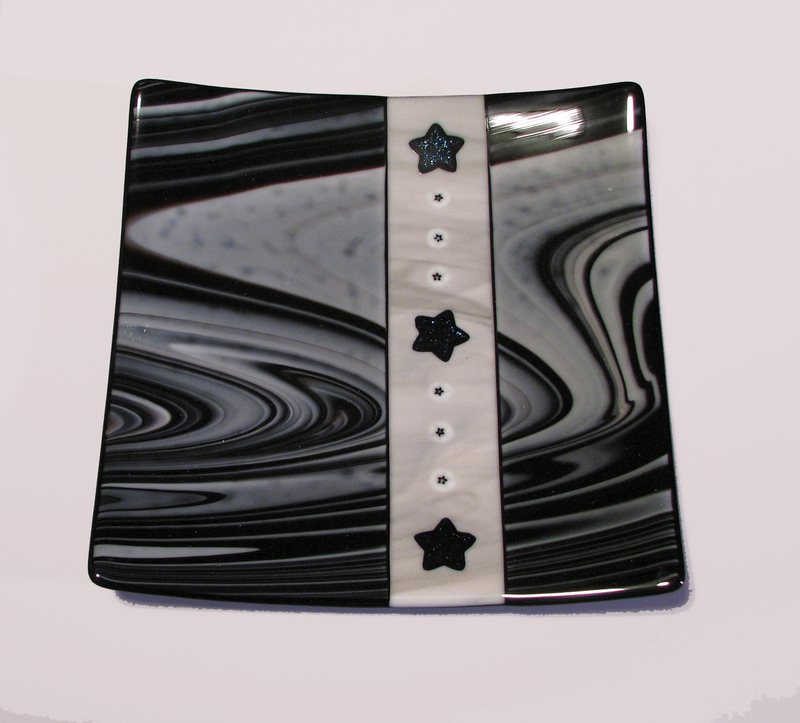 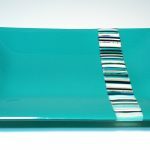 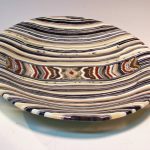 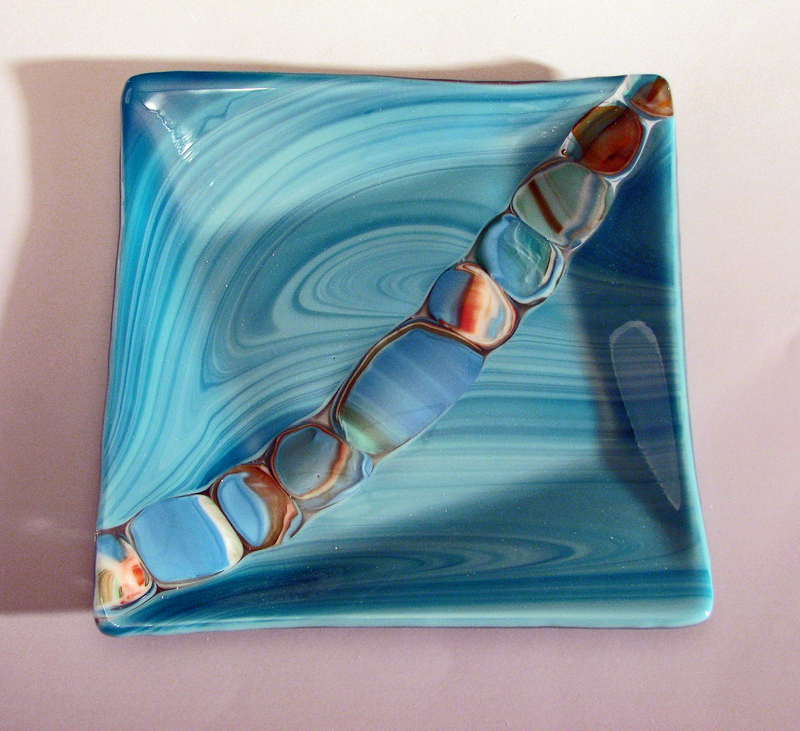 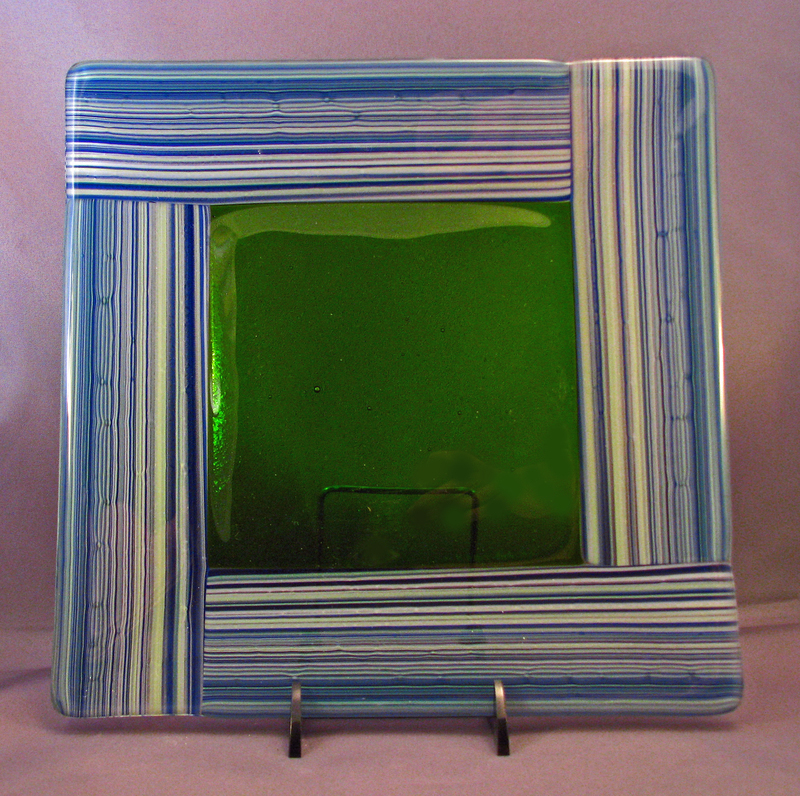 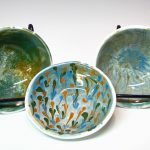 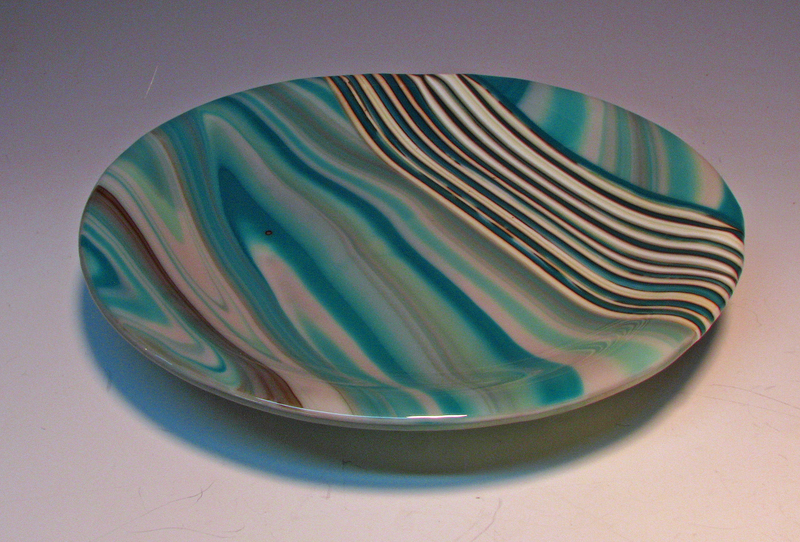 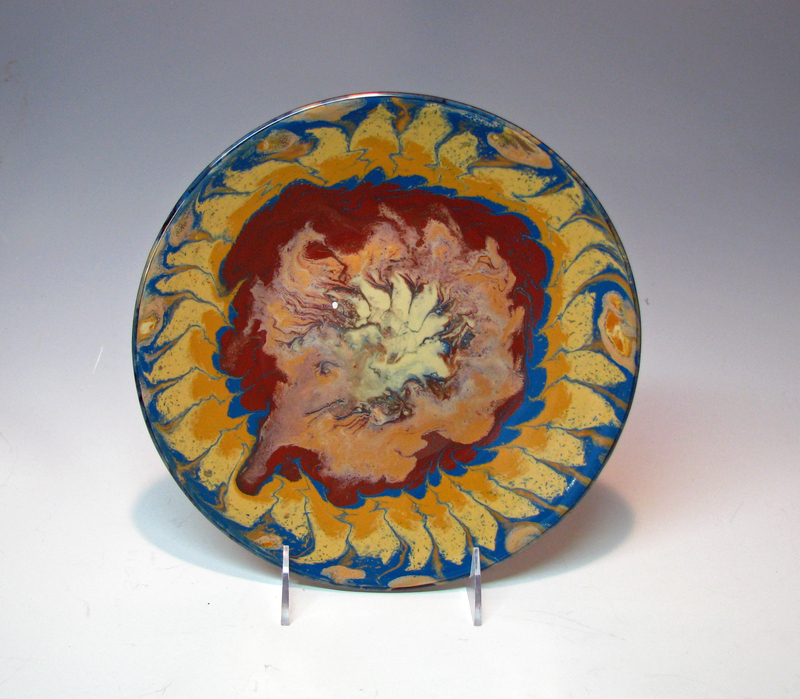 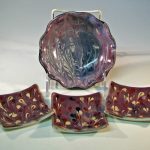 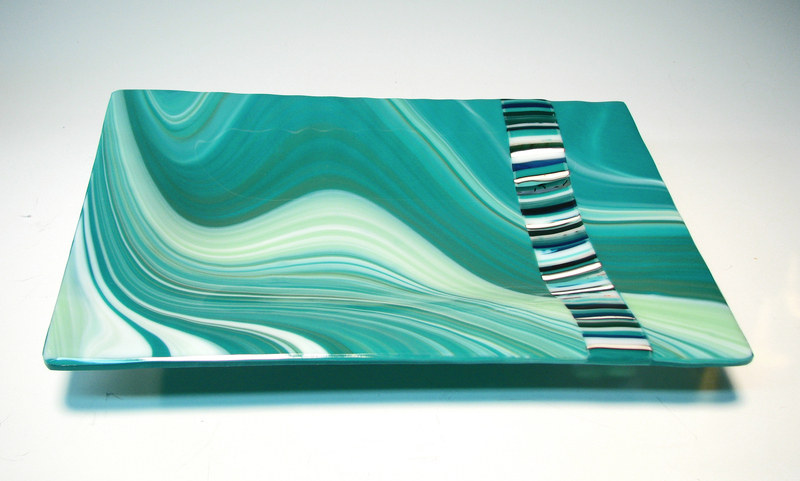 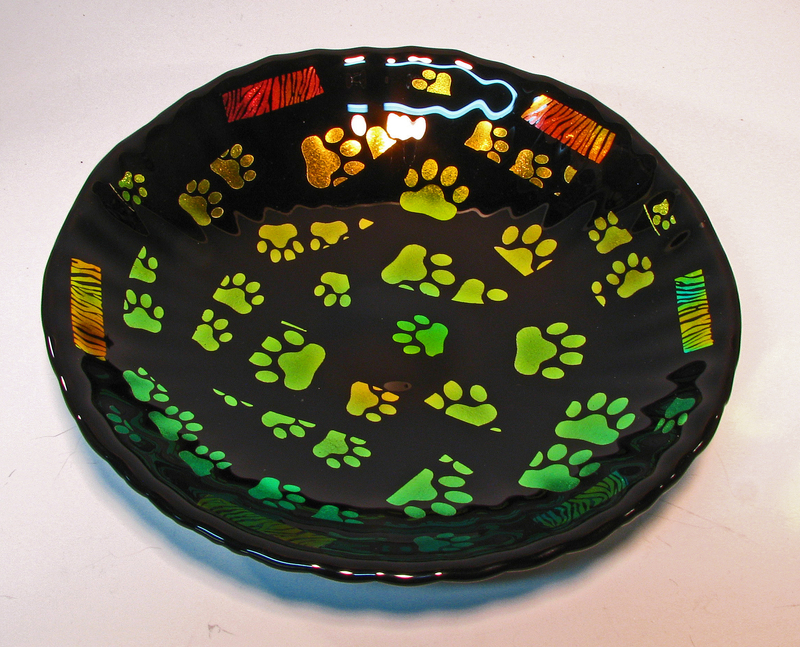 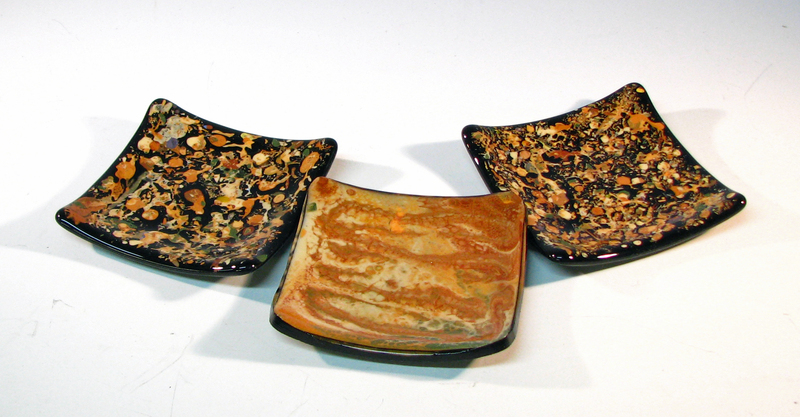 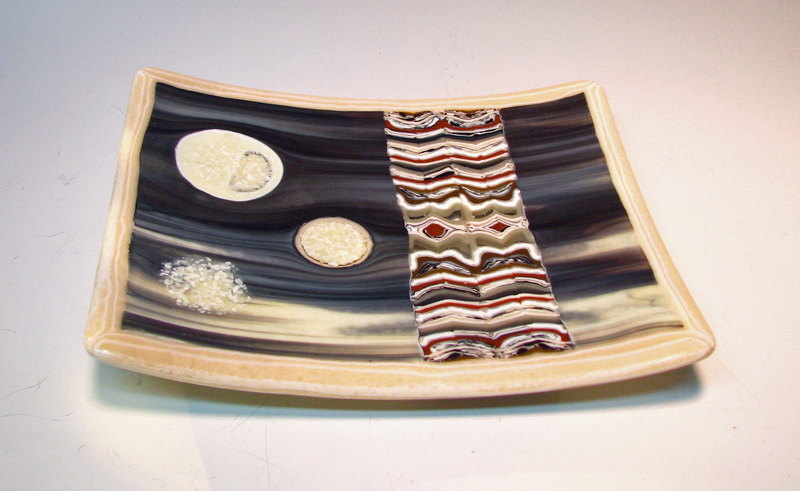 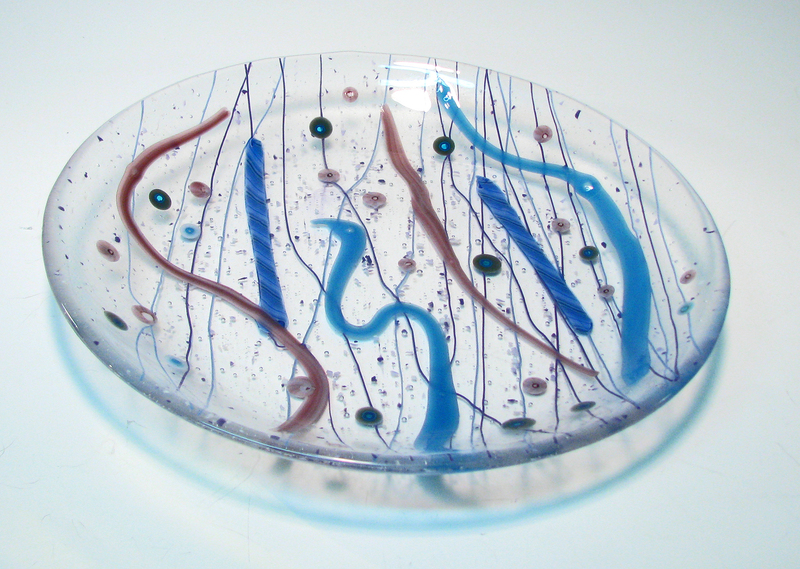 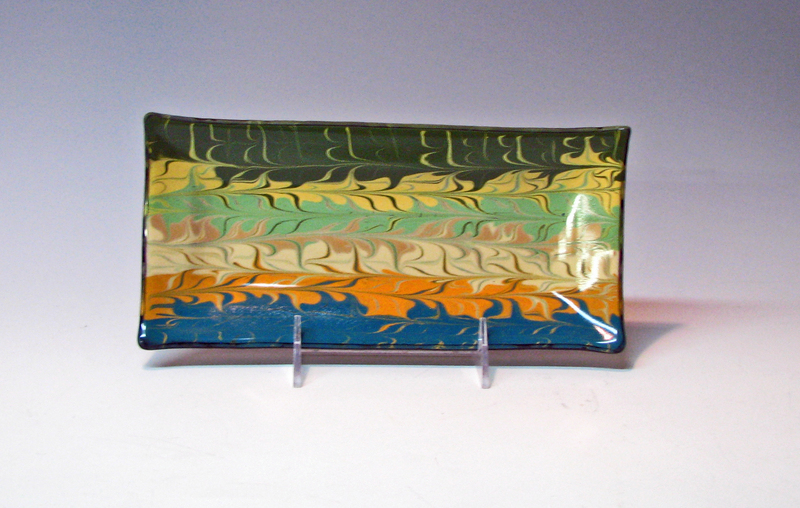 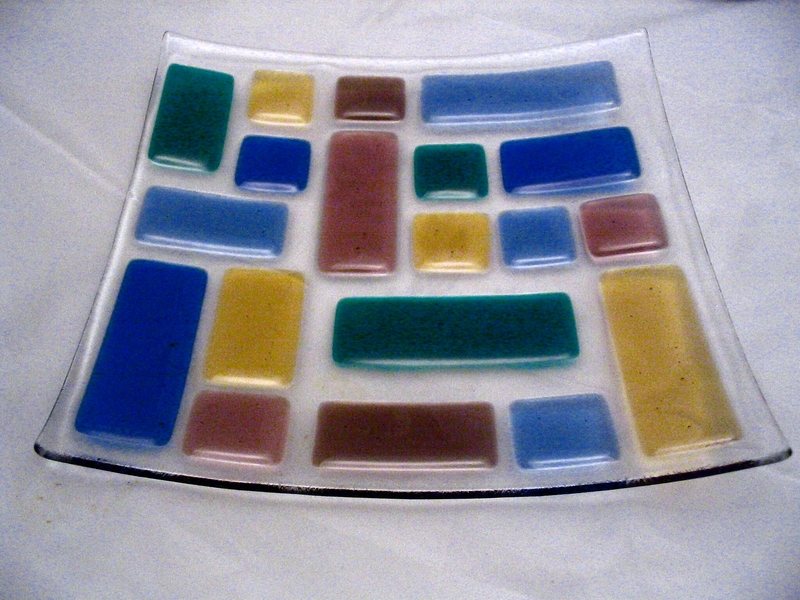 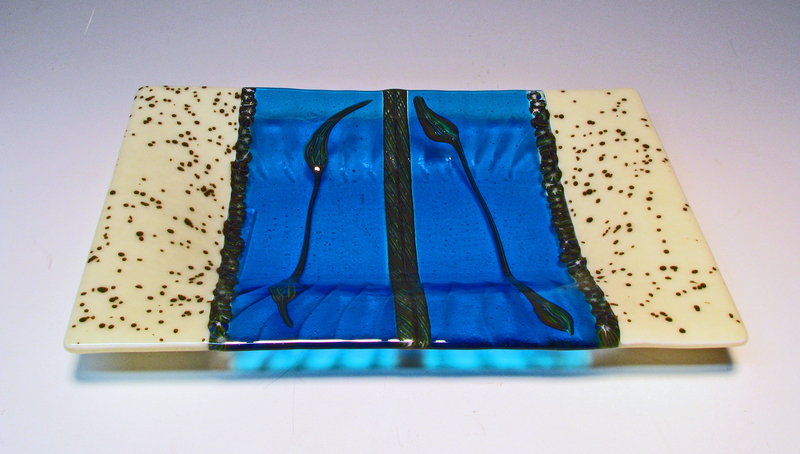 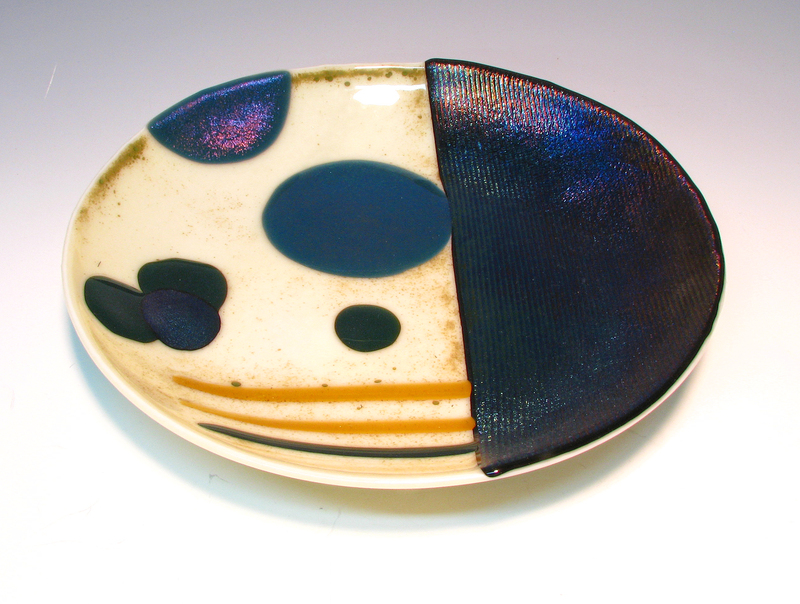 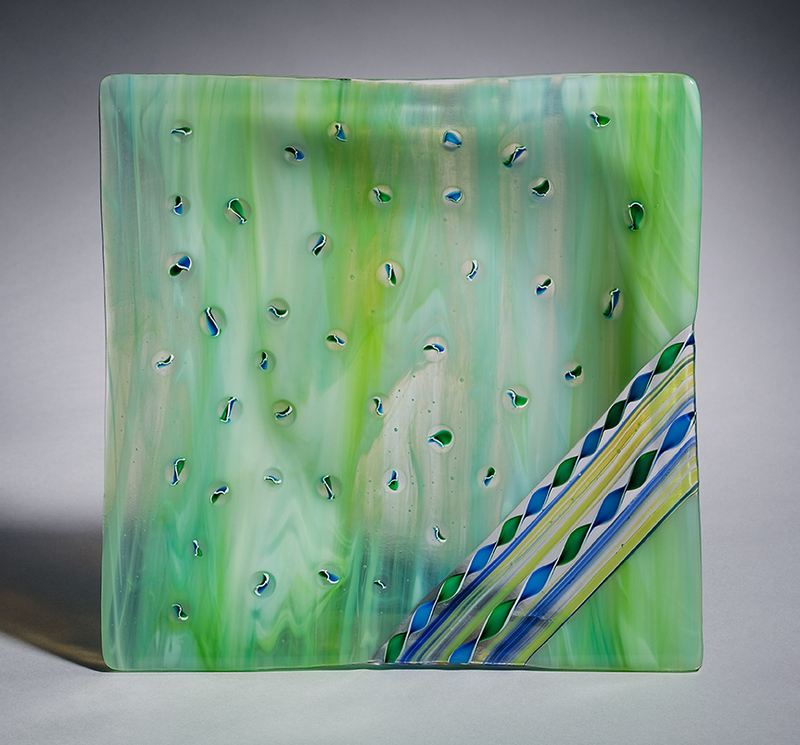 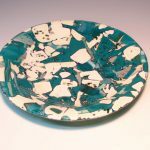 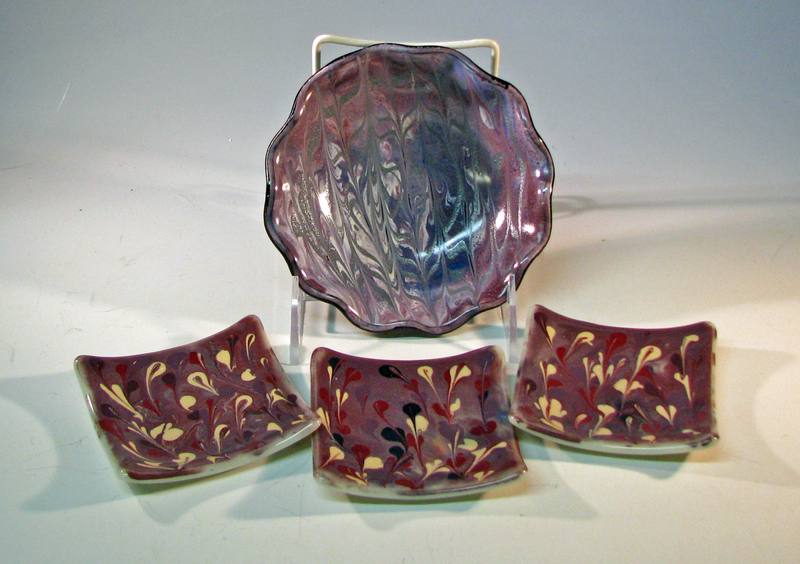 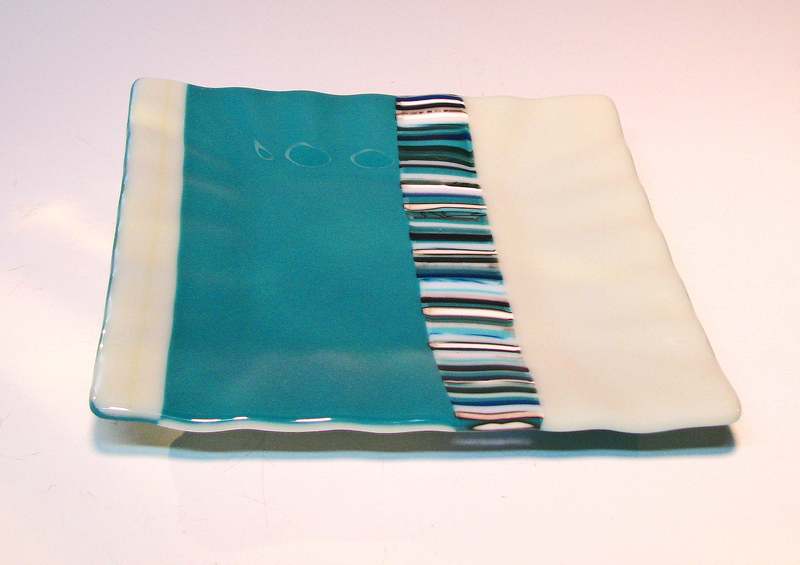 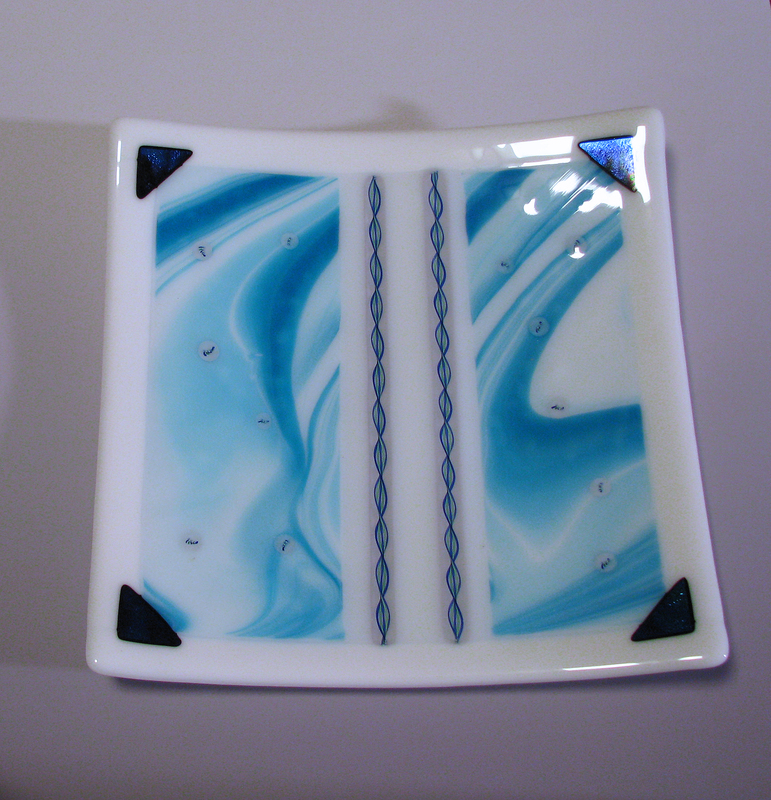 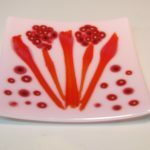 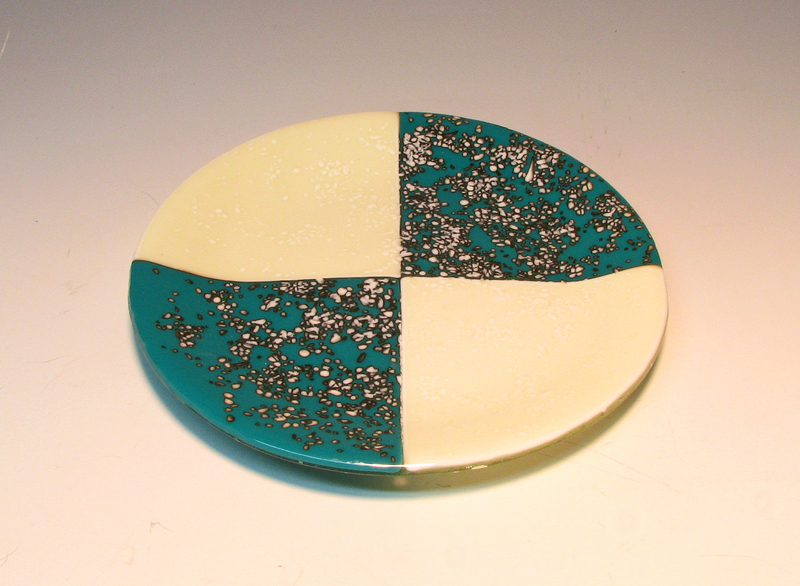 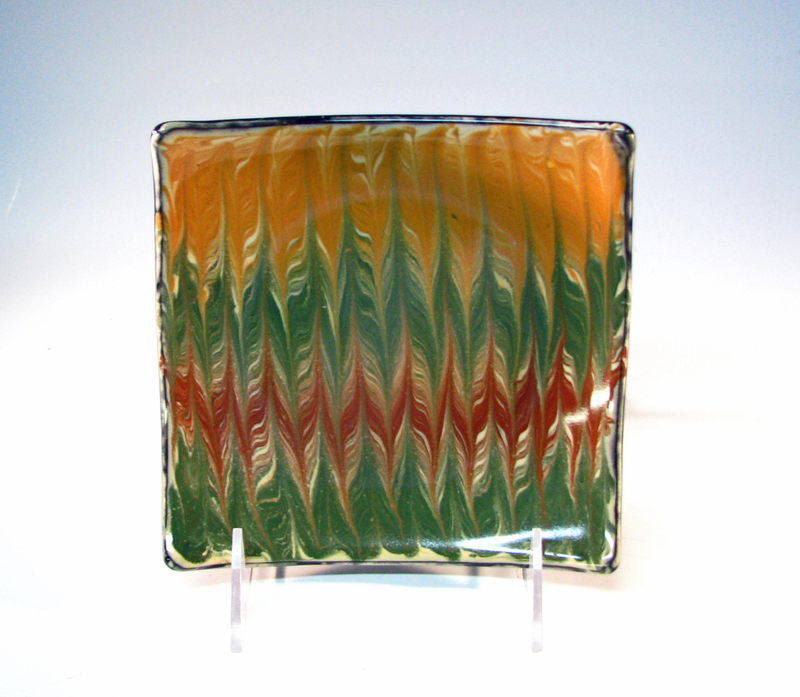 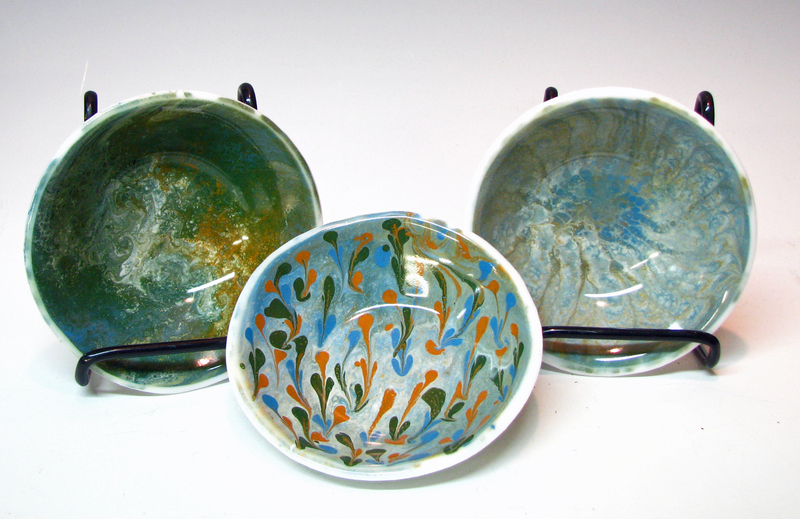 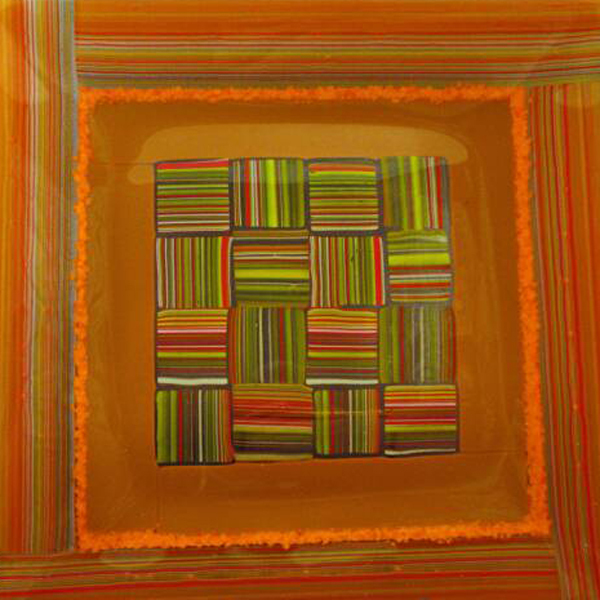 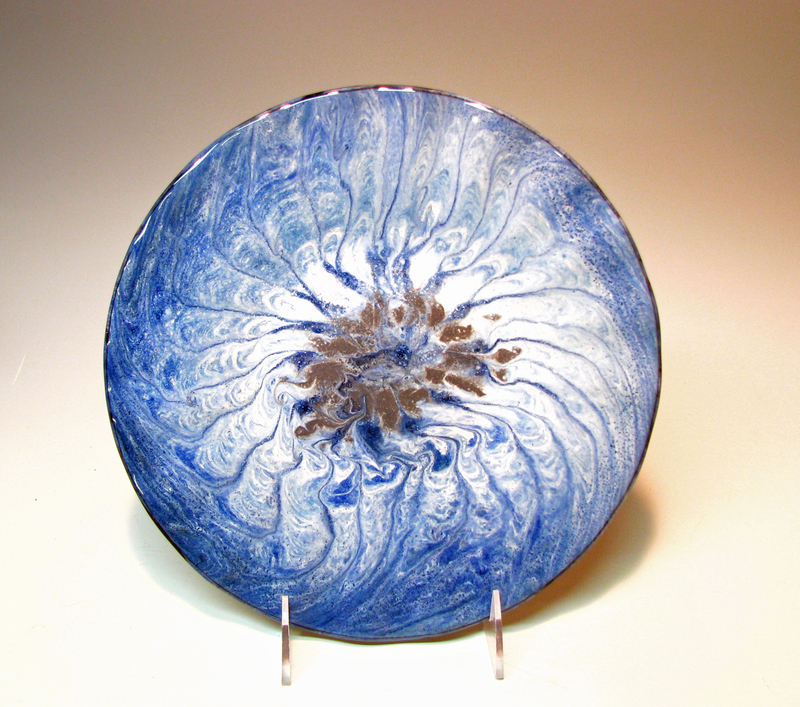 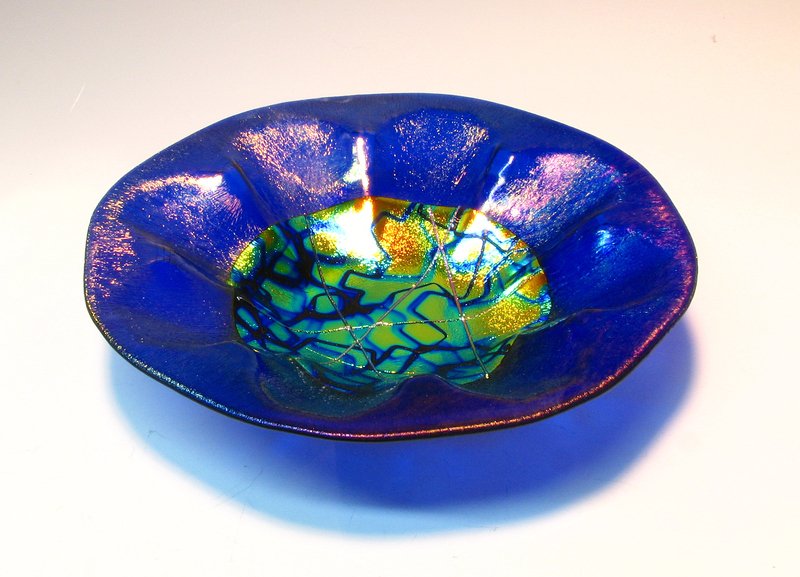 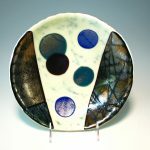 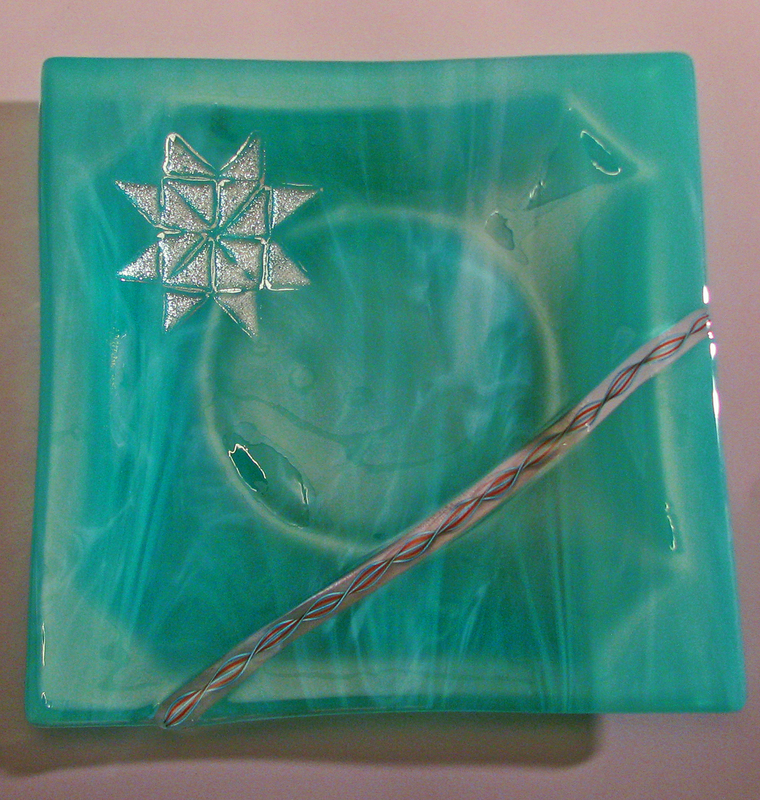 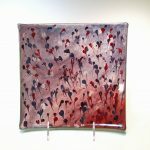 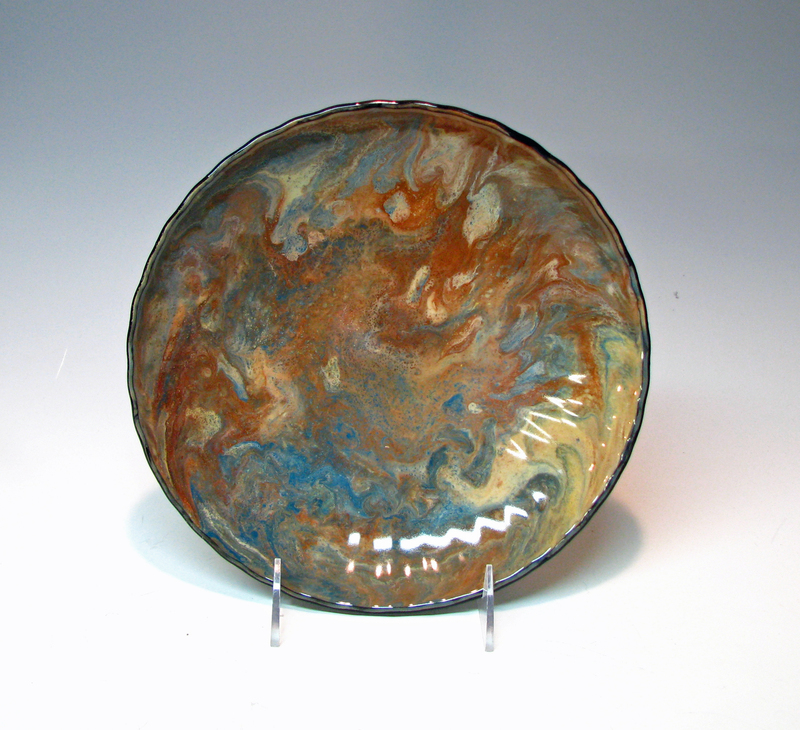 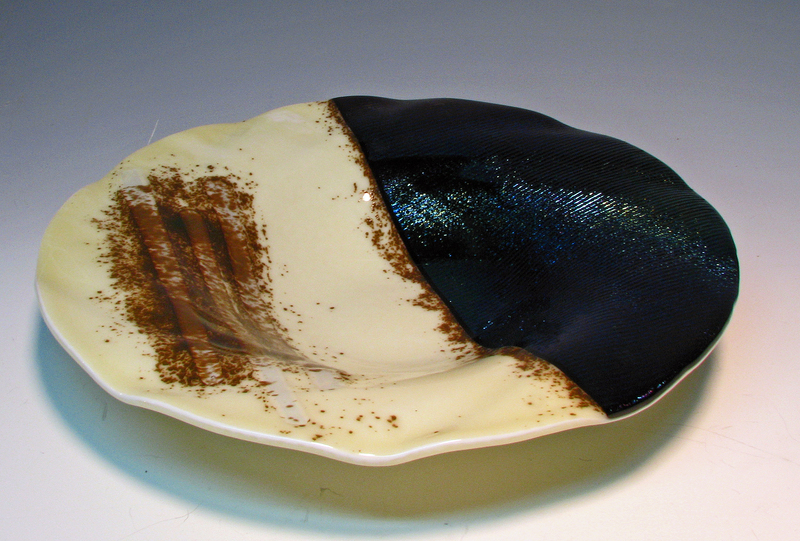 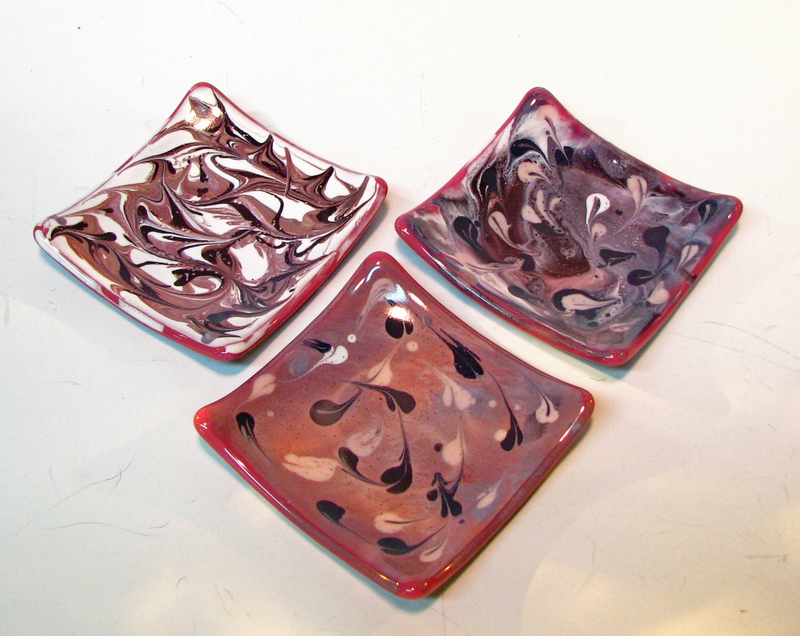 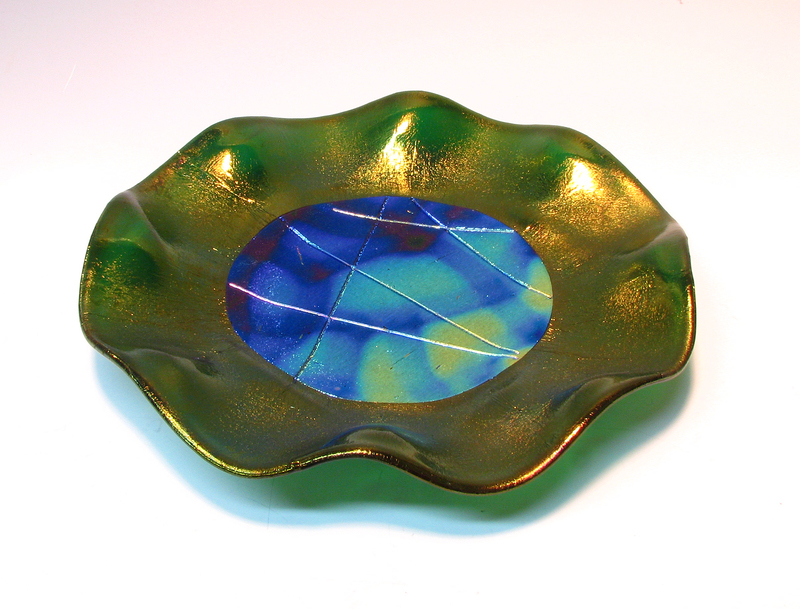 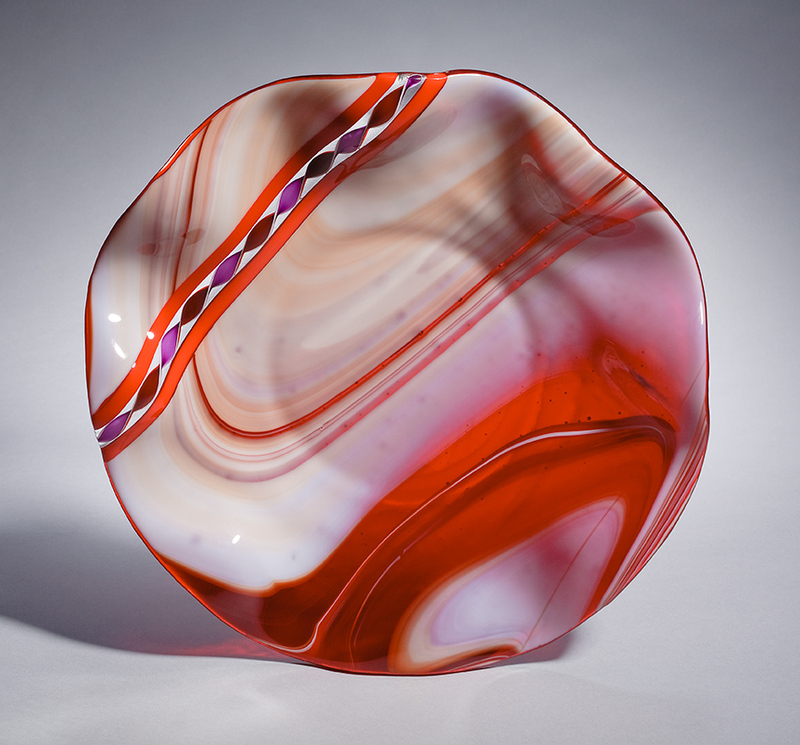 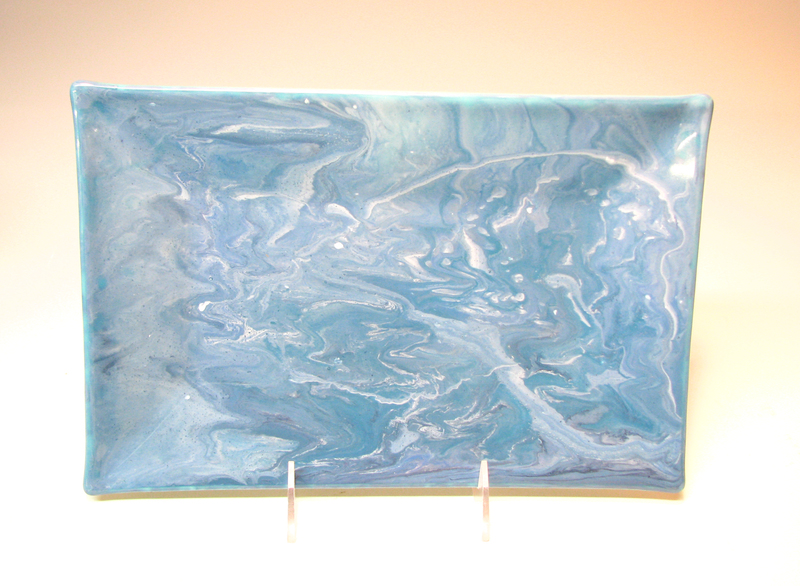 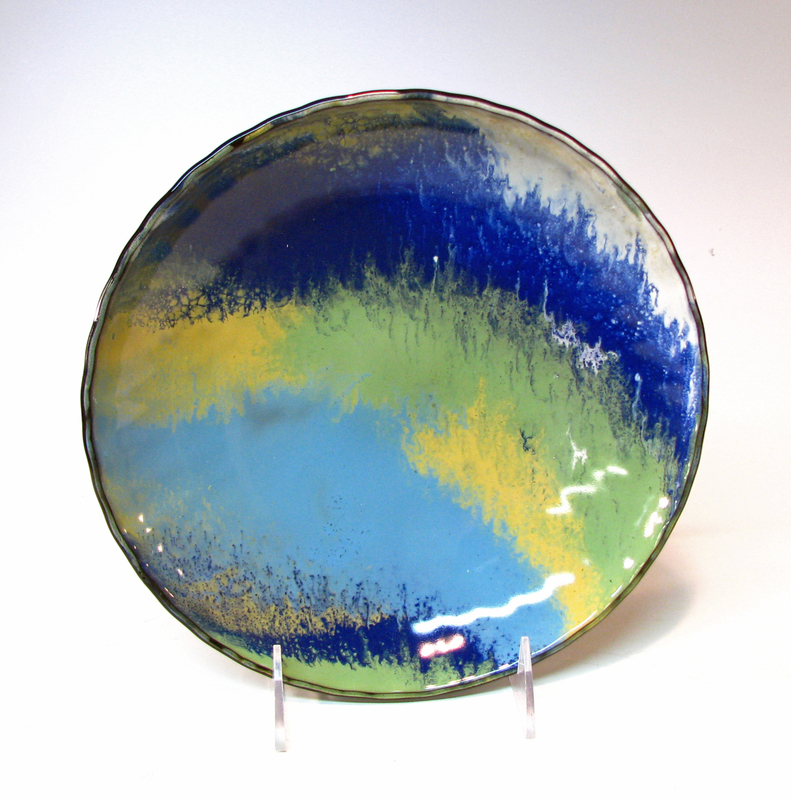 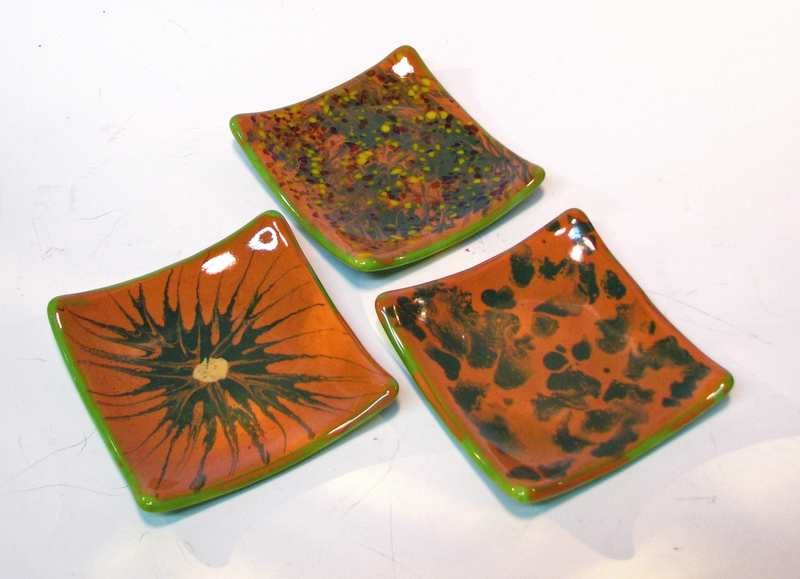 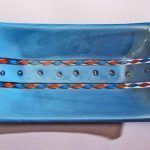 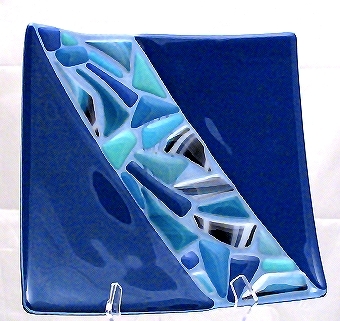 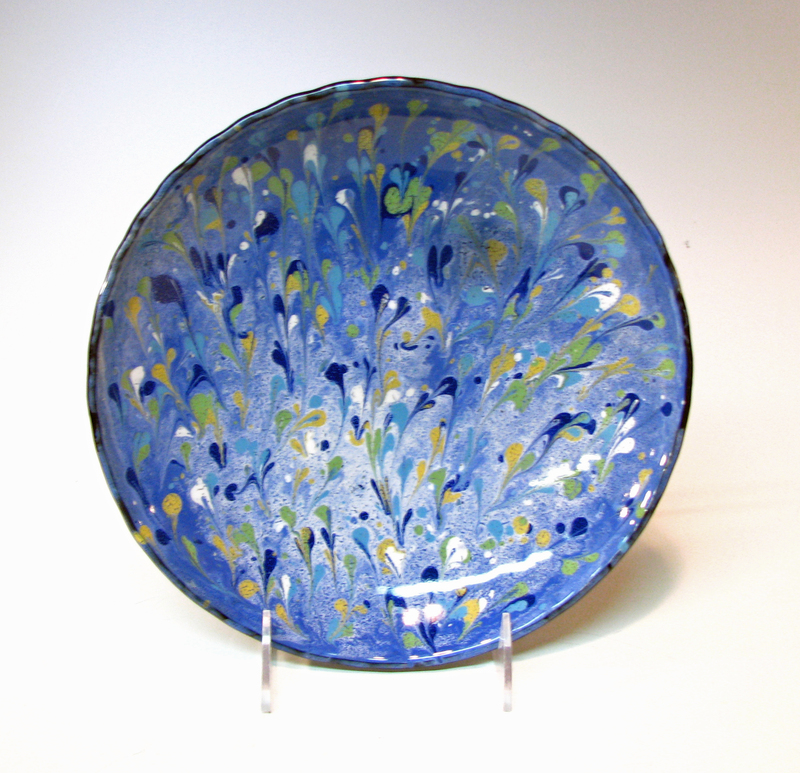 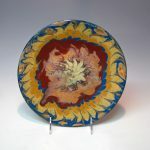 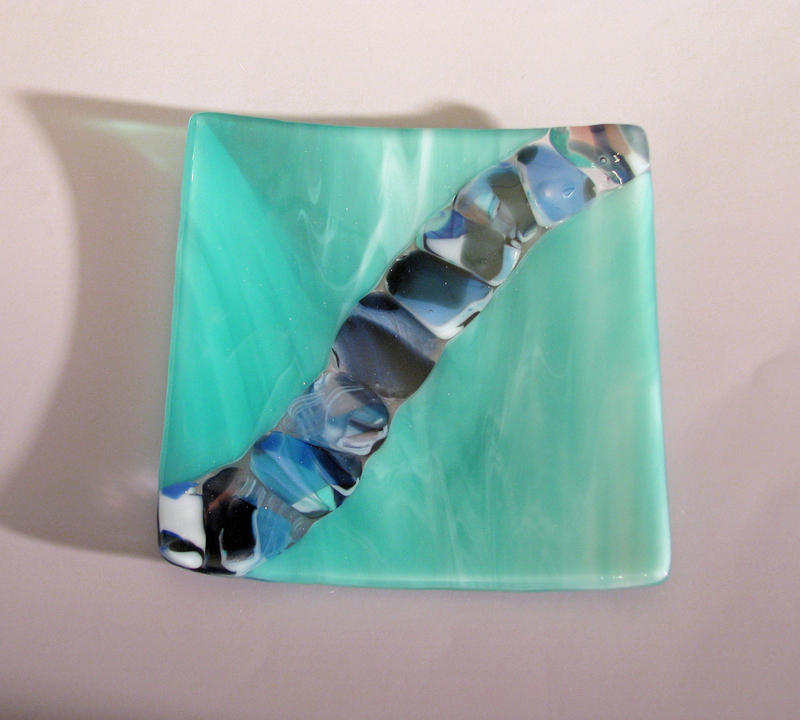 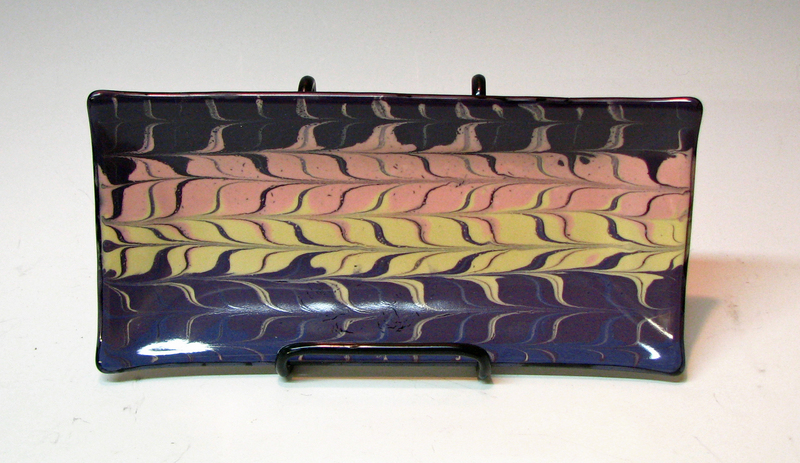 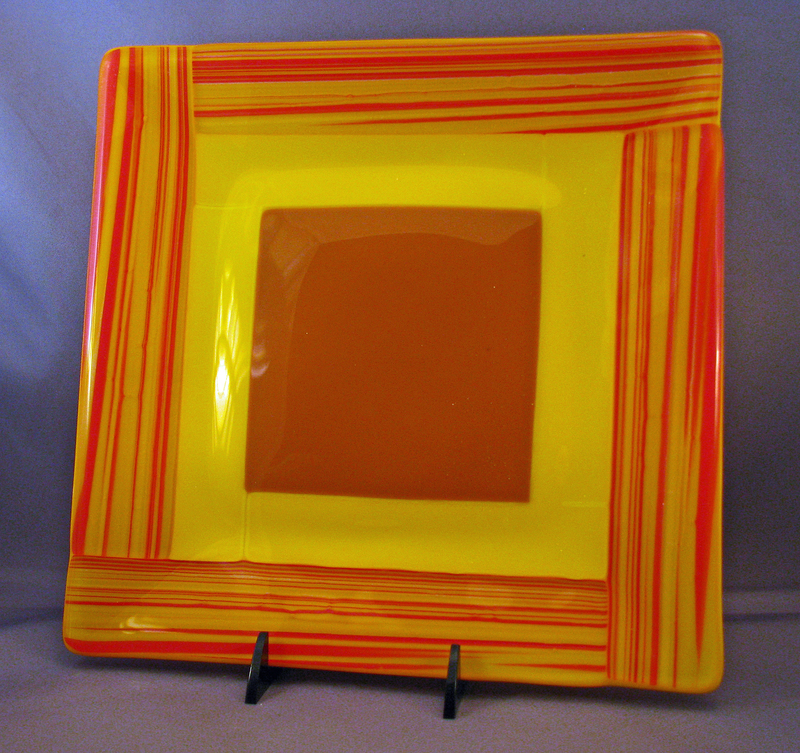 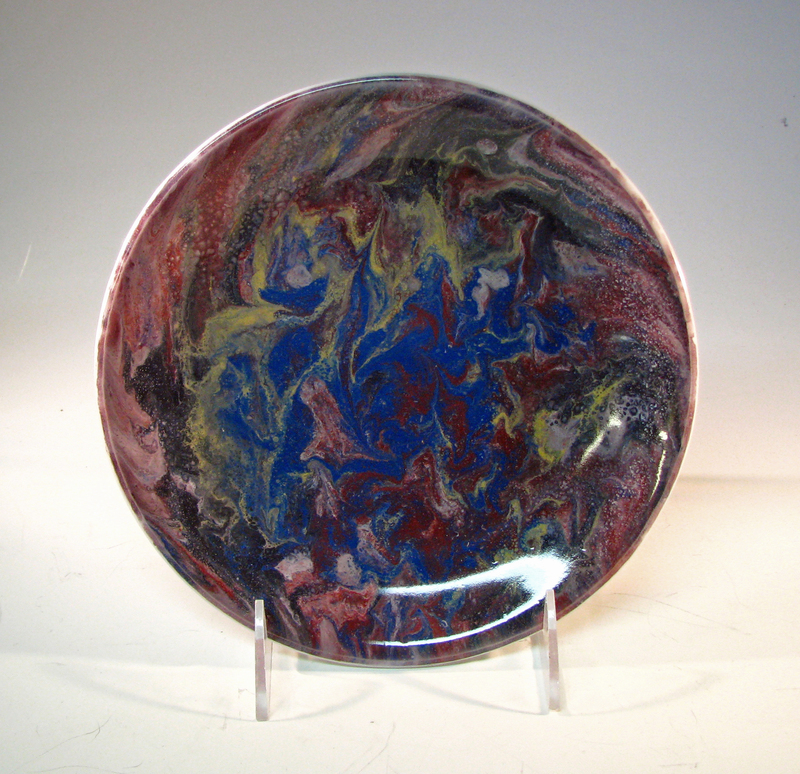 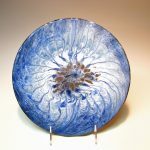 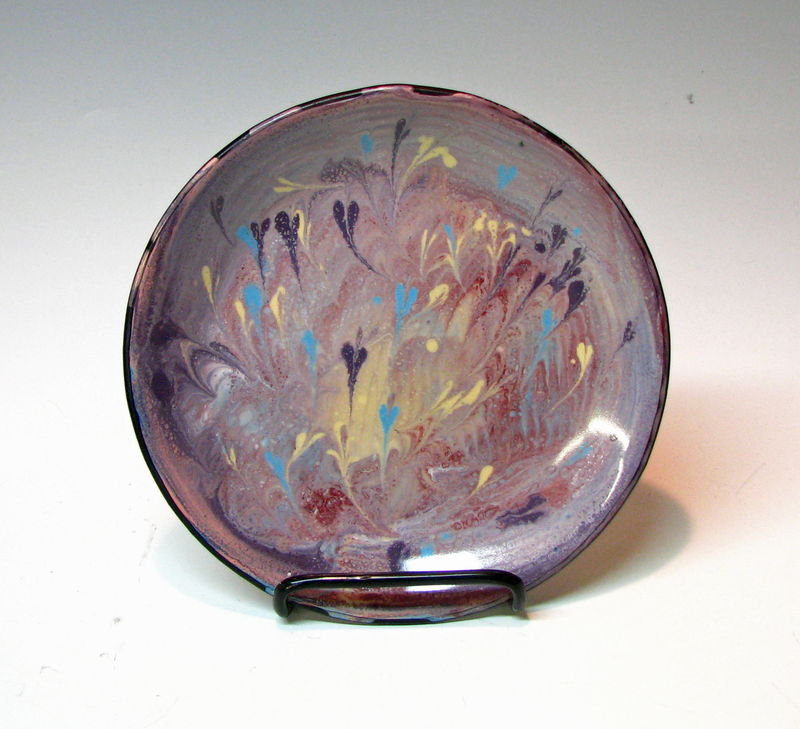 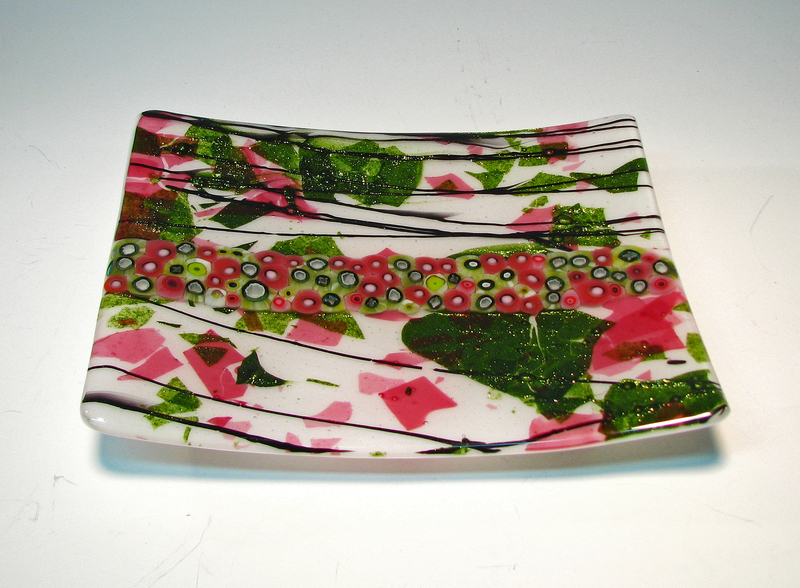 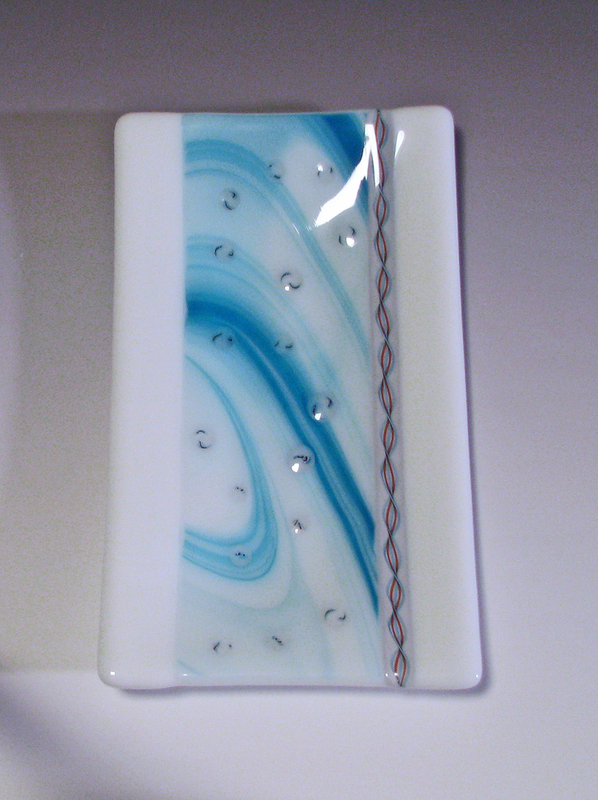 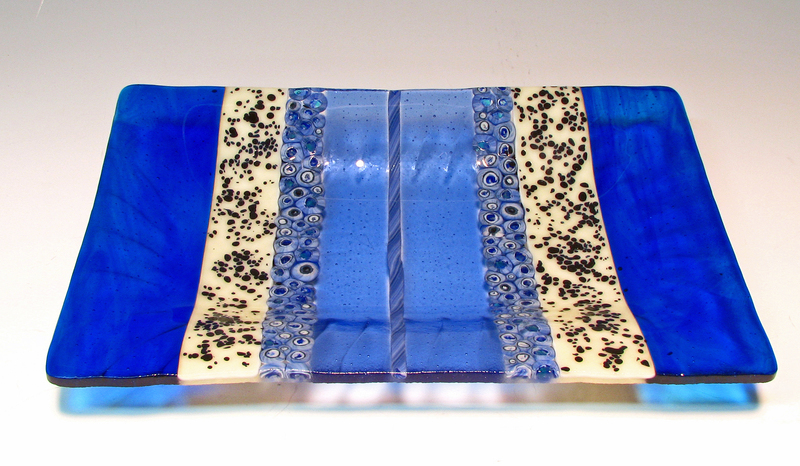 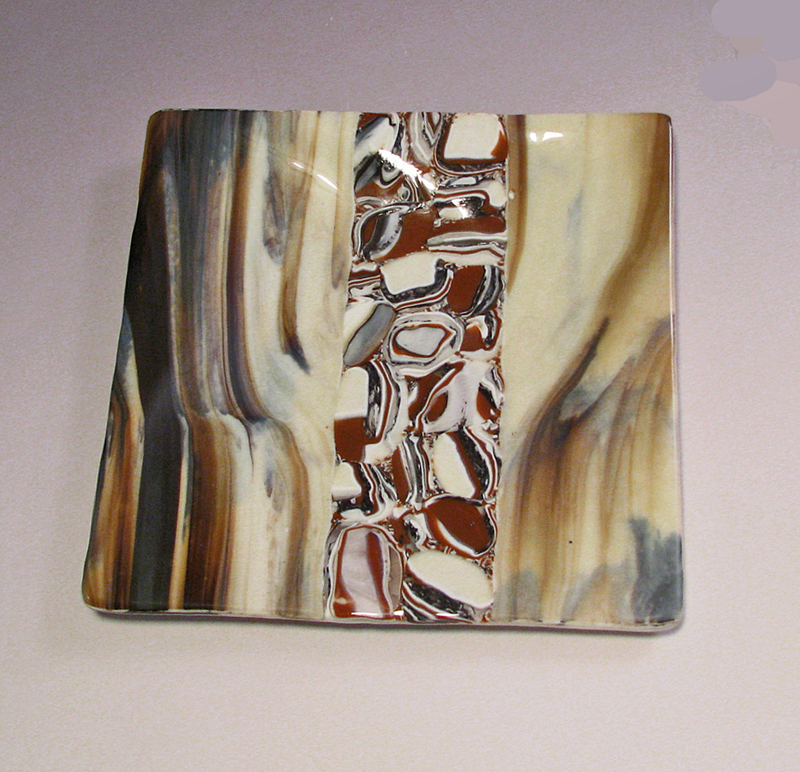 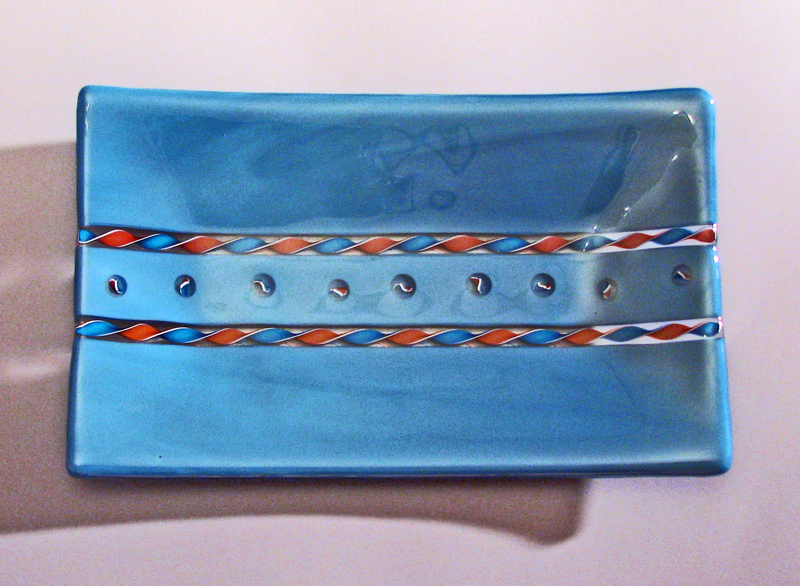 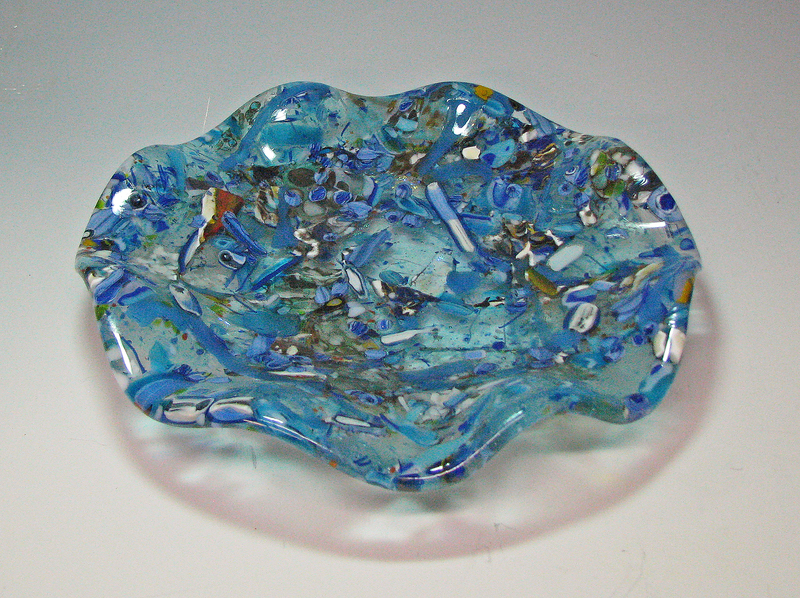 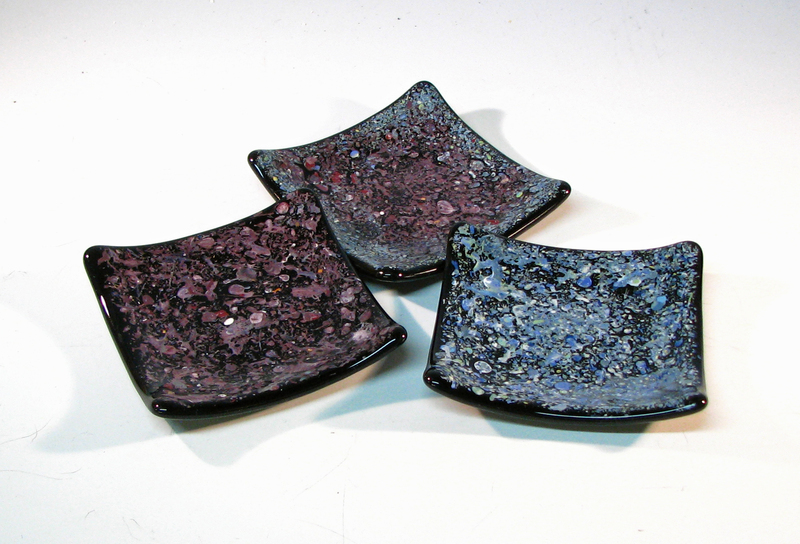 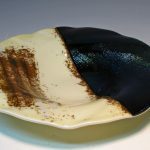 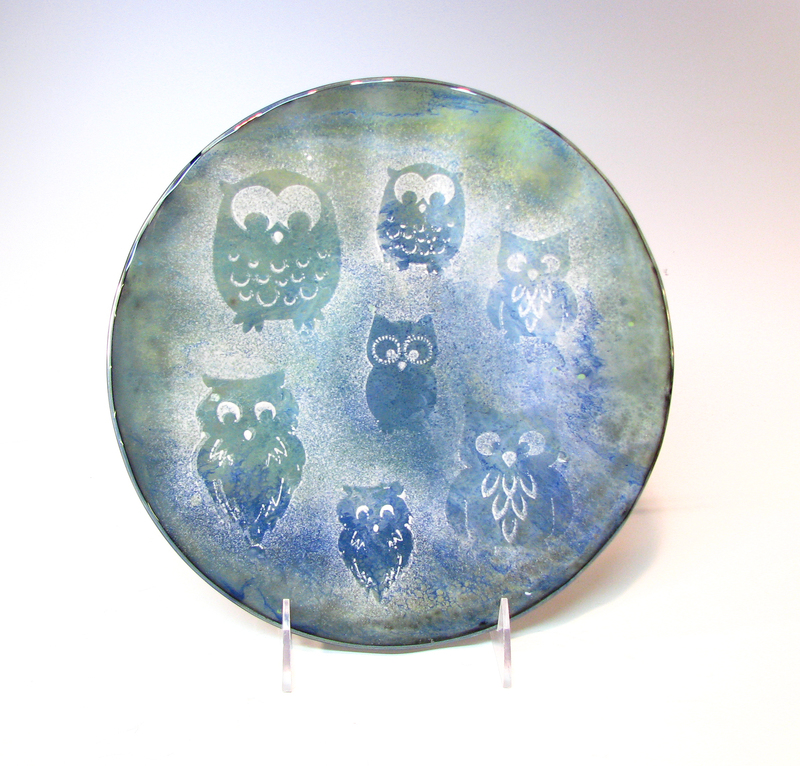 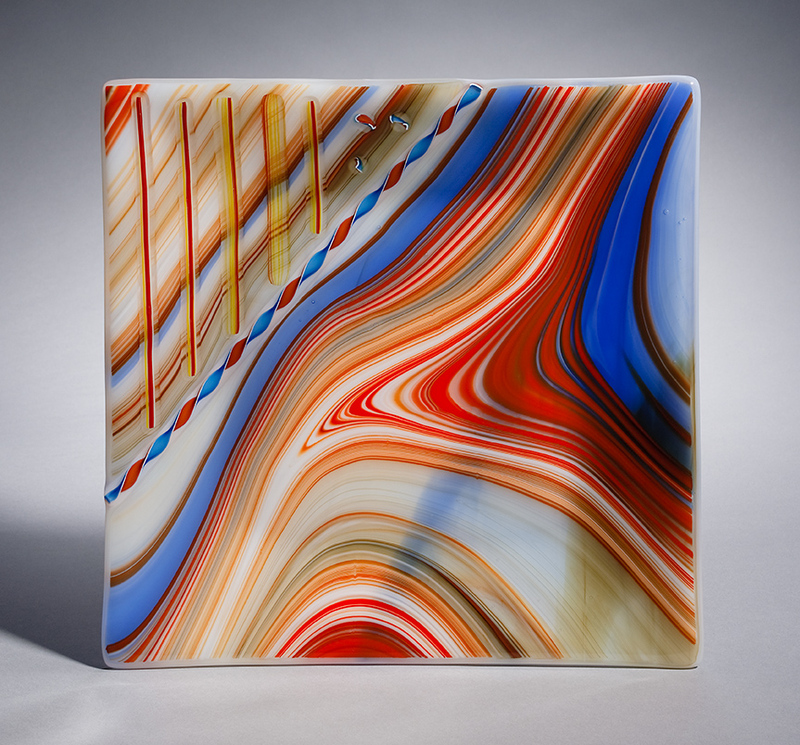 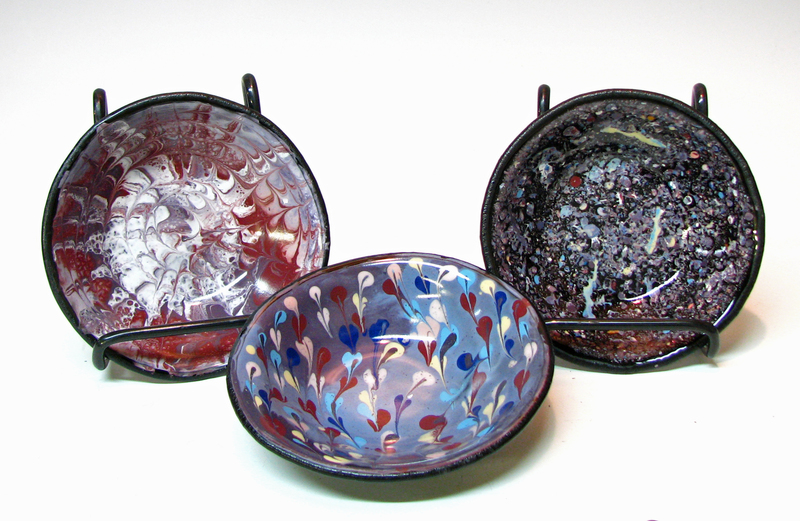 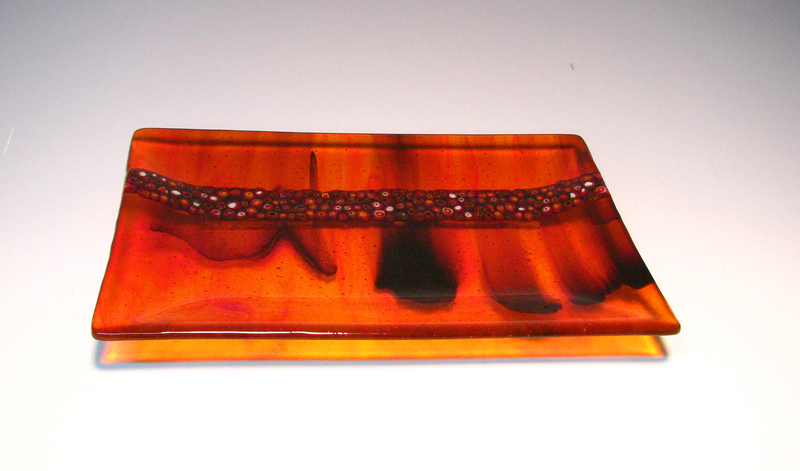 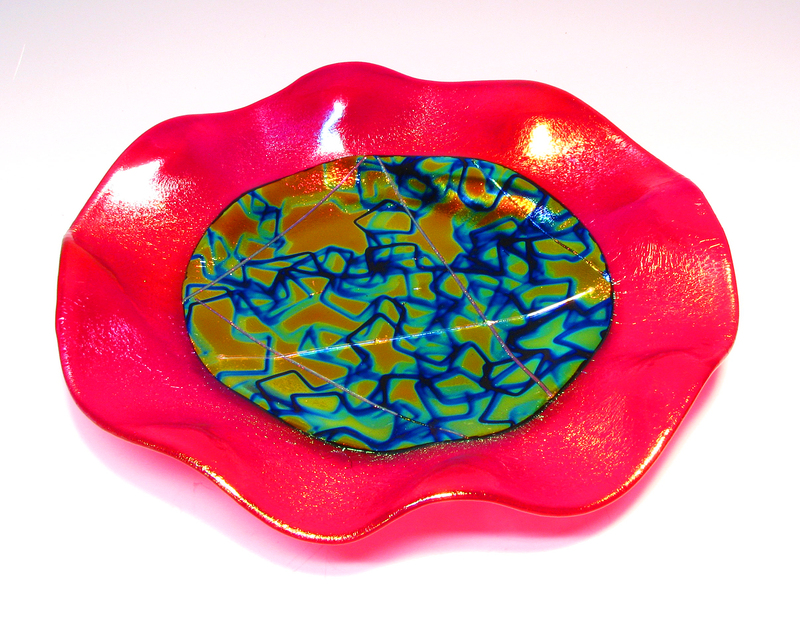 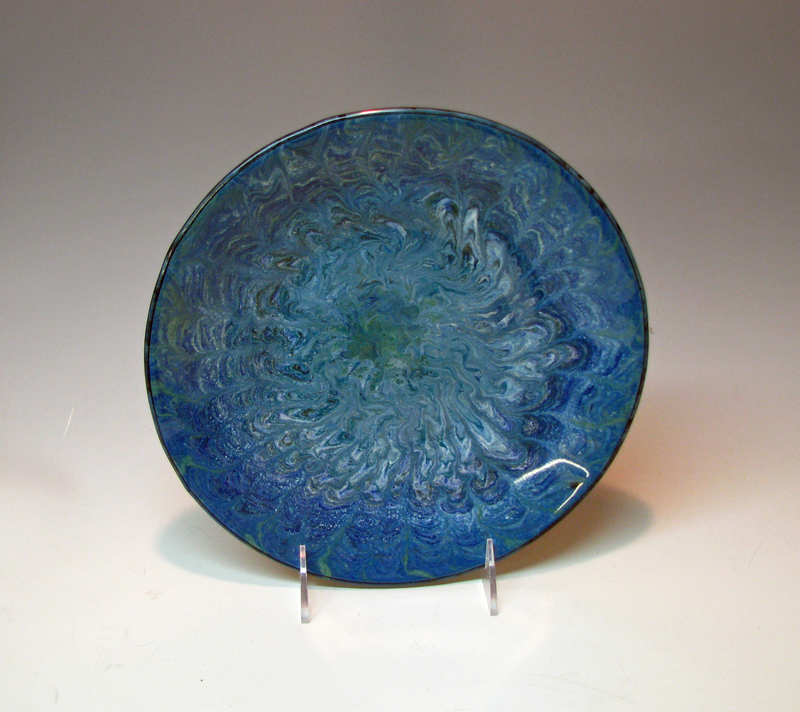 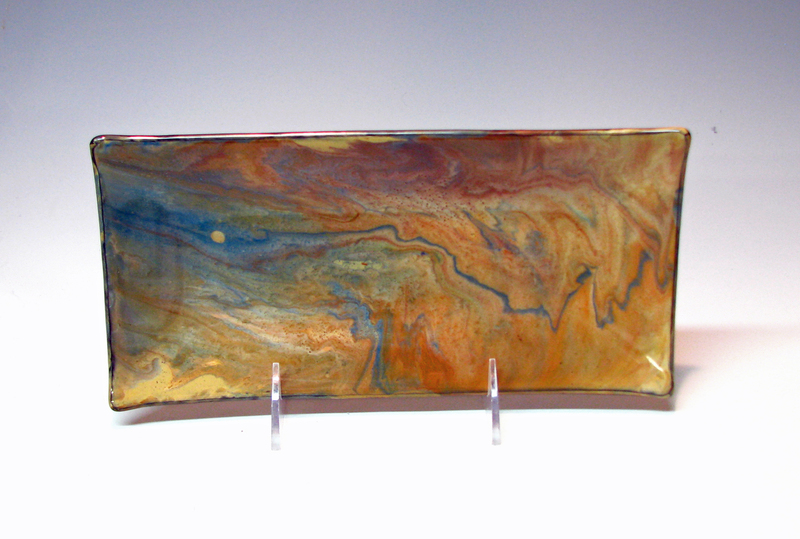 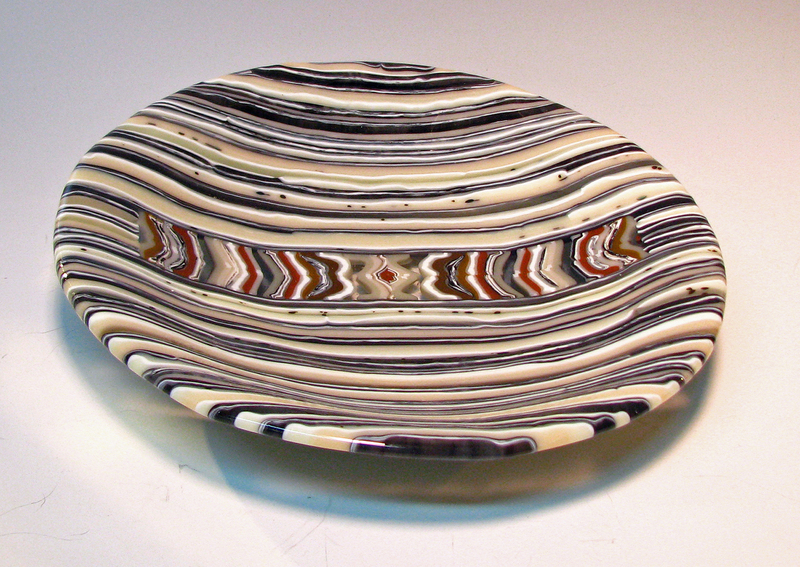 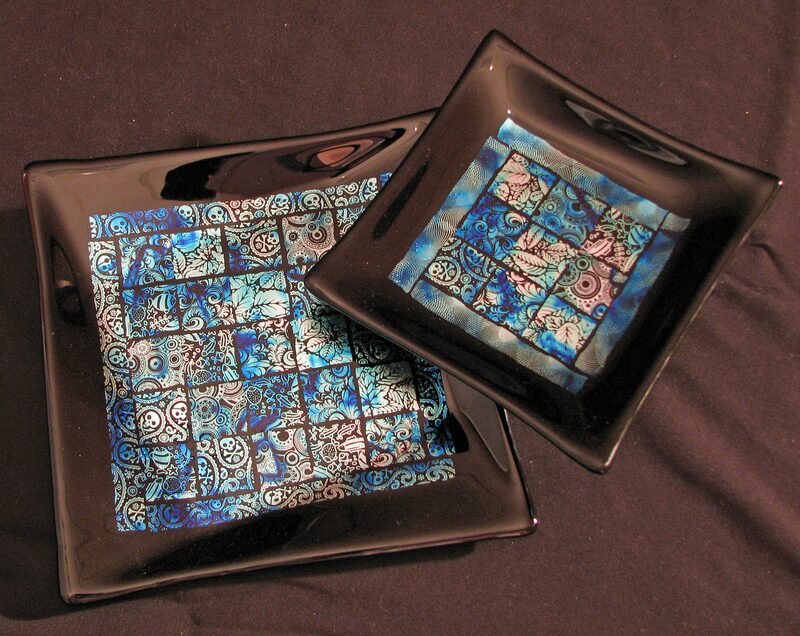 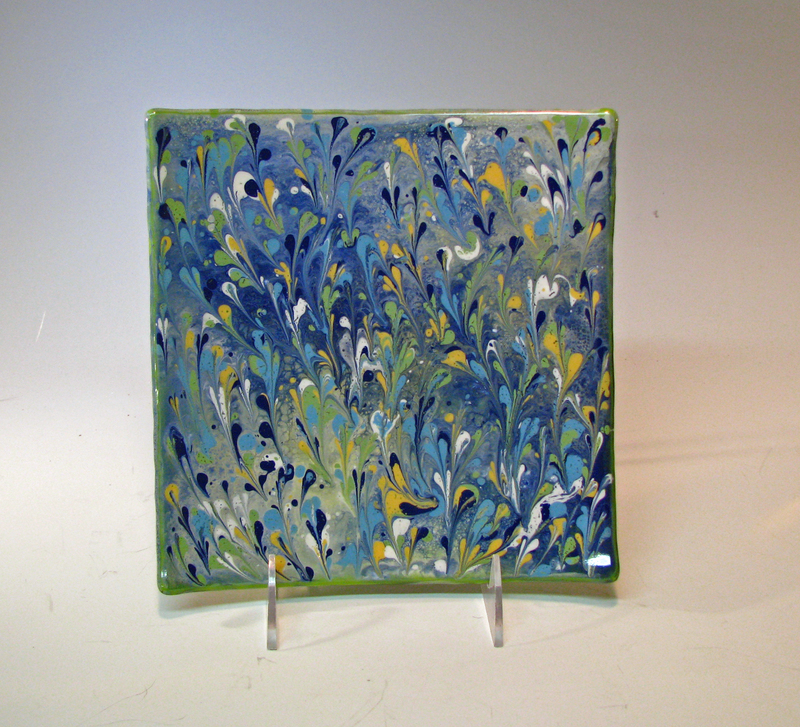 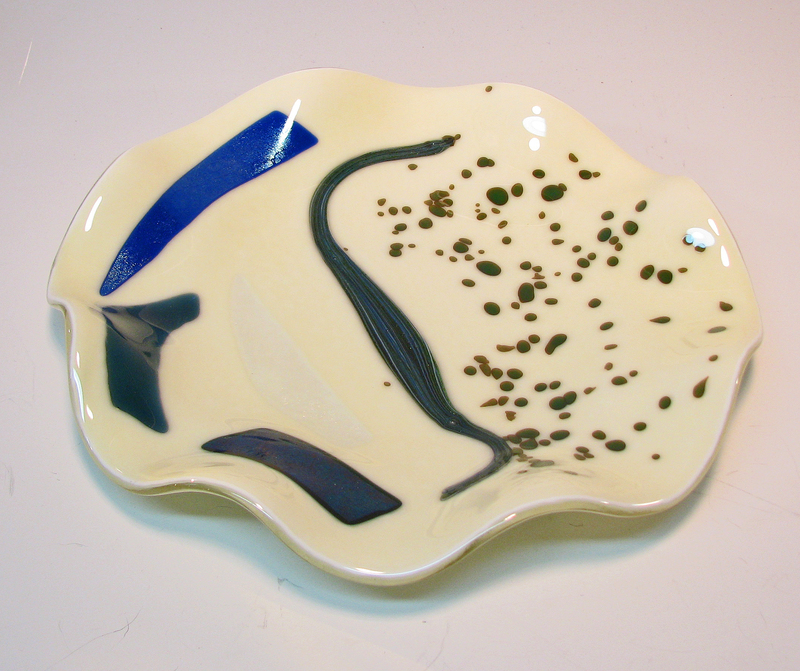 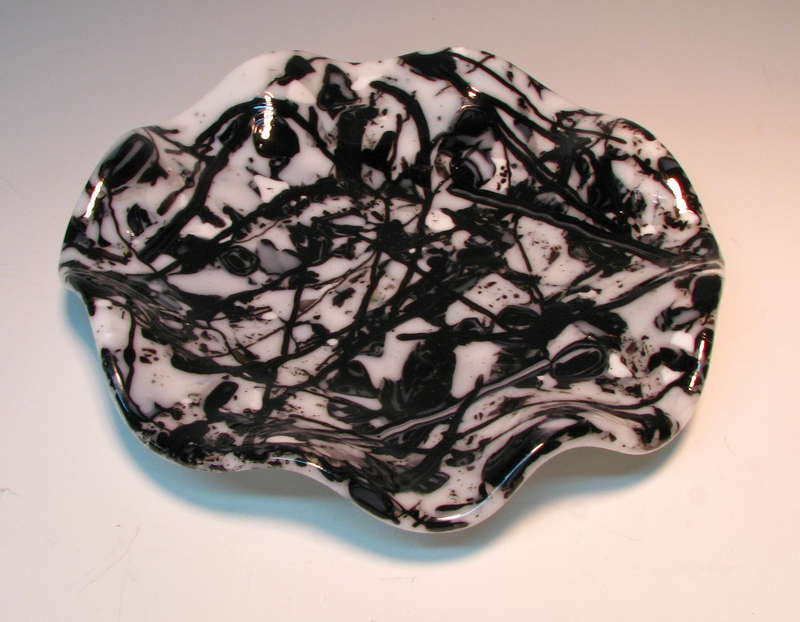 Glass plates and bowls are created using at least 2 trips to the kiln. 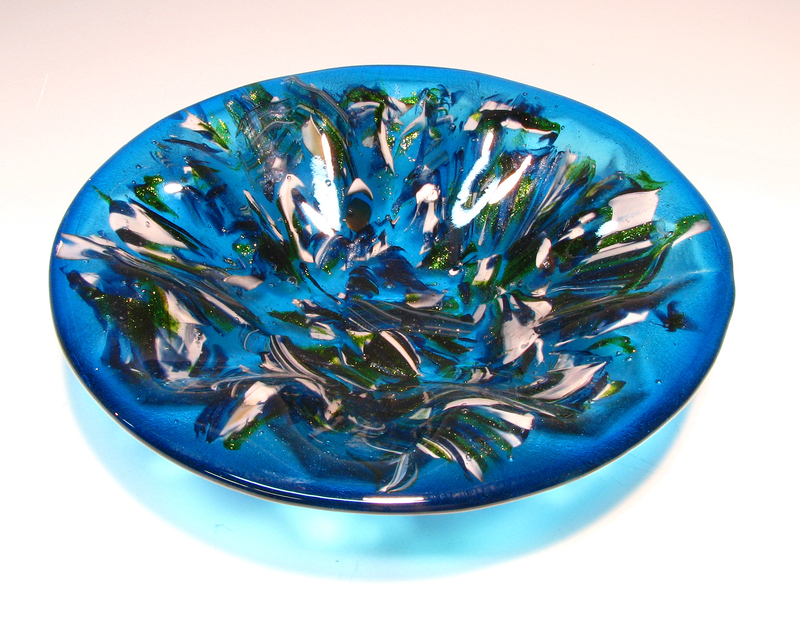 The first trip is to fuse all the pieces together into one solid mass of glass. 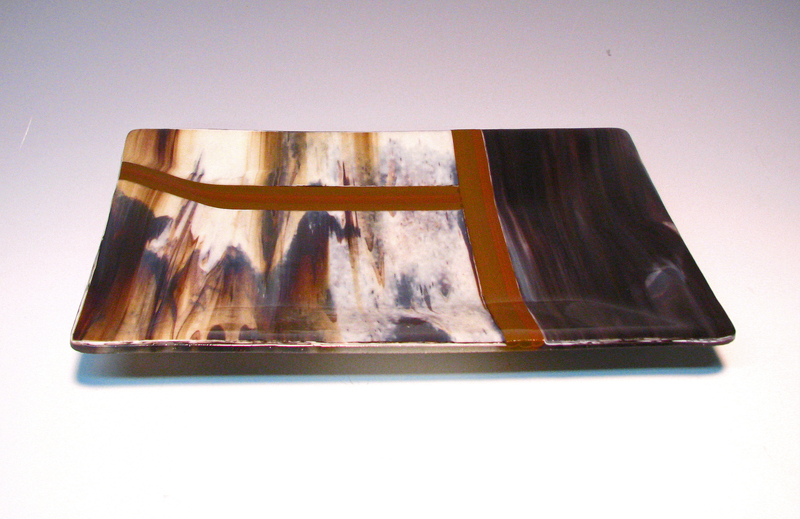 A full fuse for this is at around 1480F. 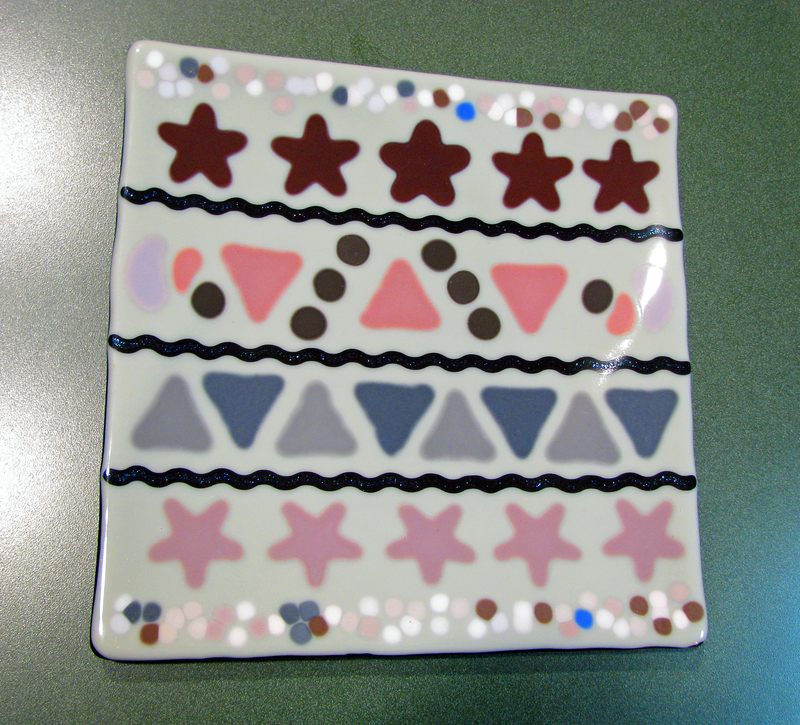 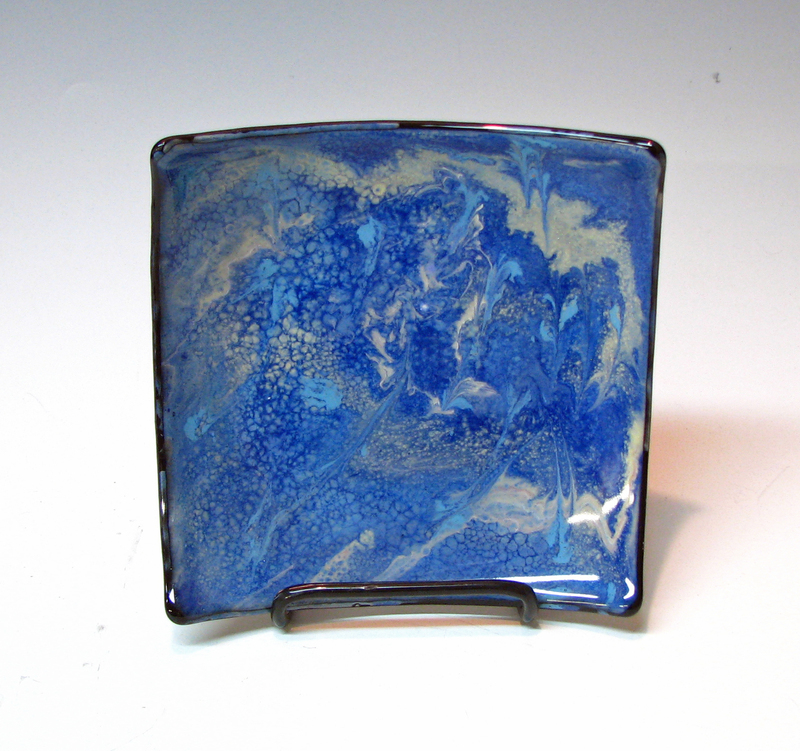 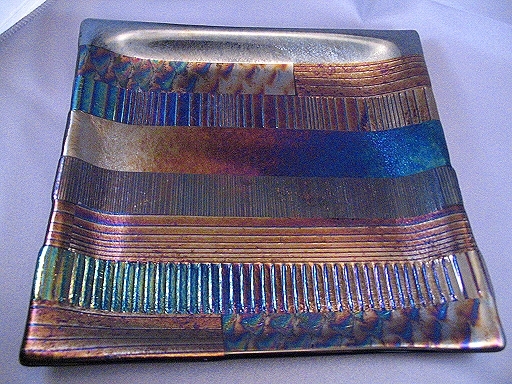 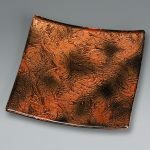 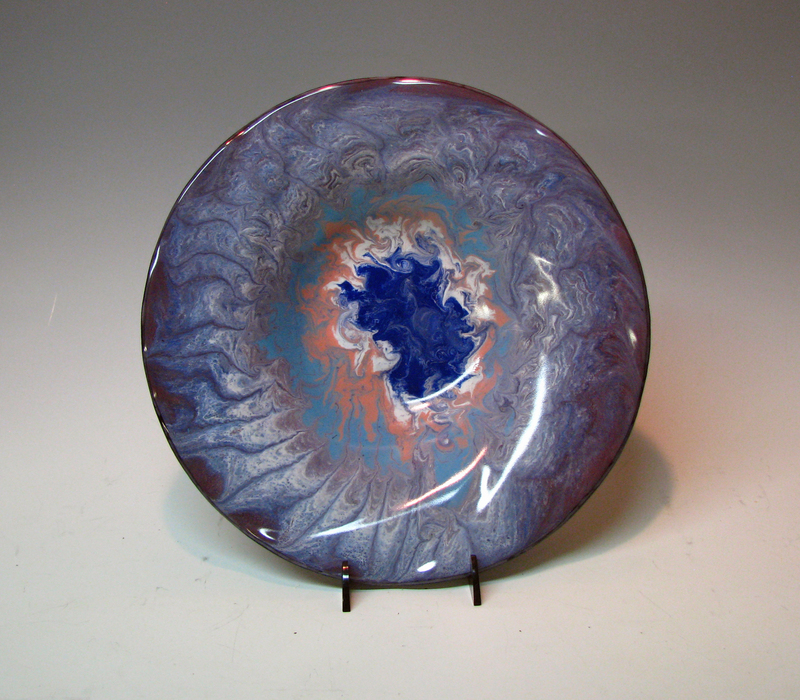 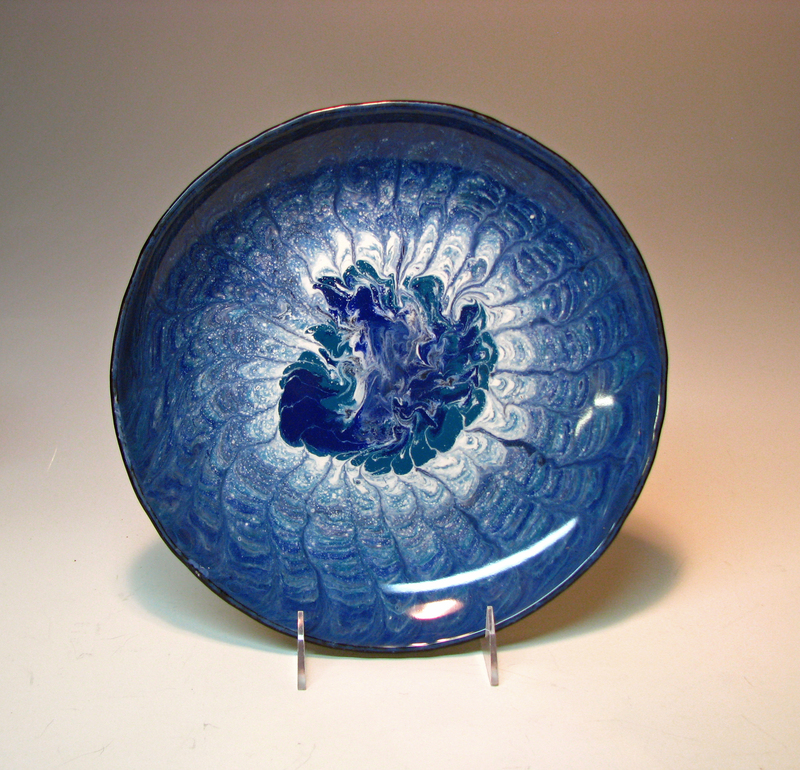 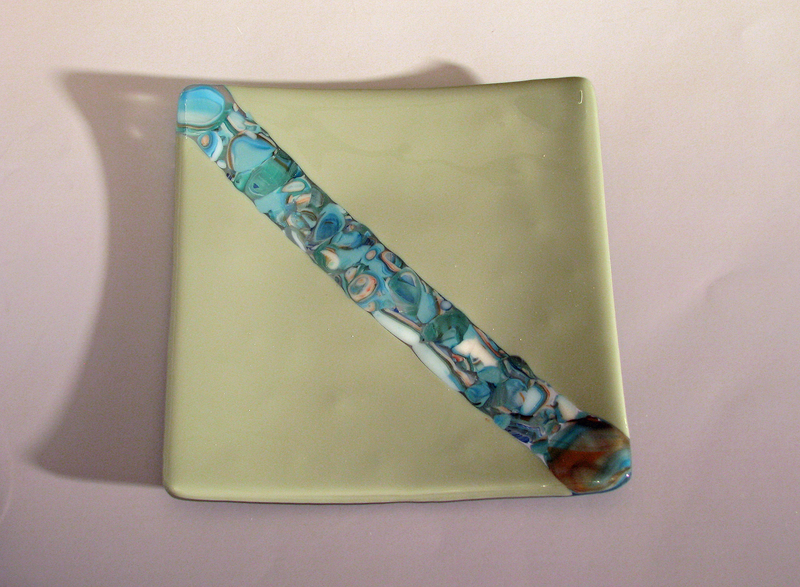 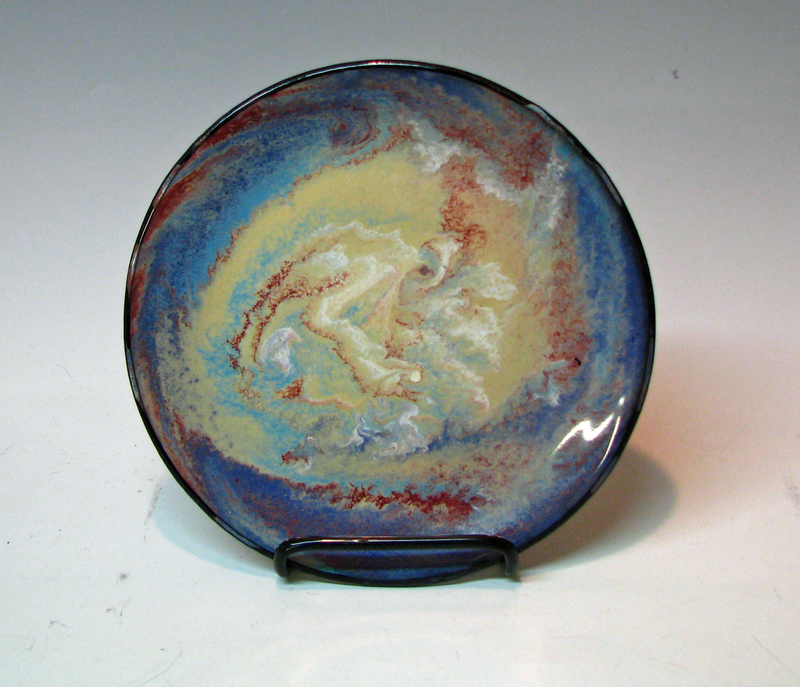 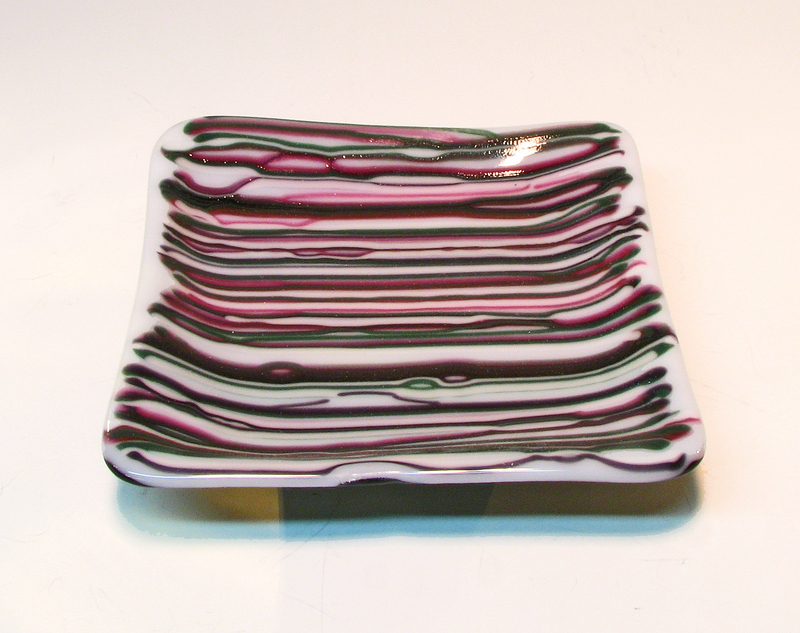 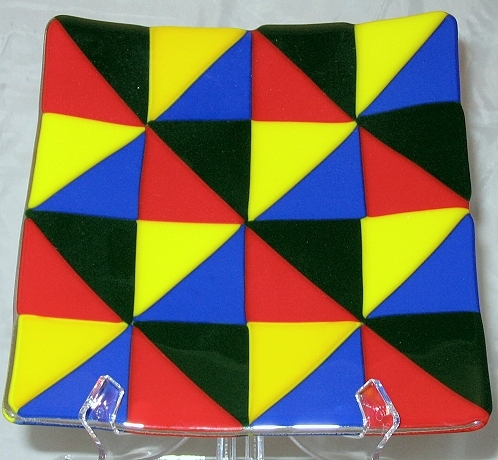 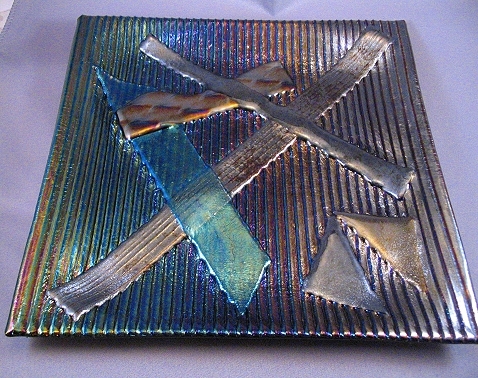 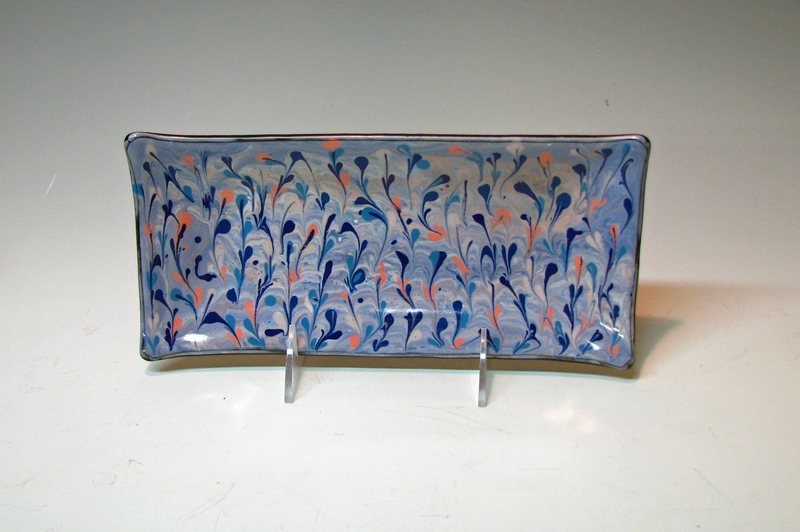 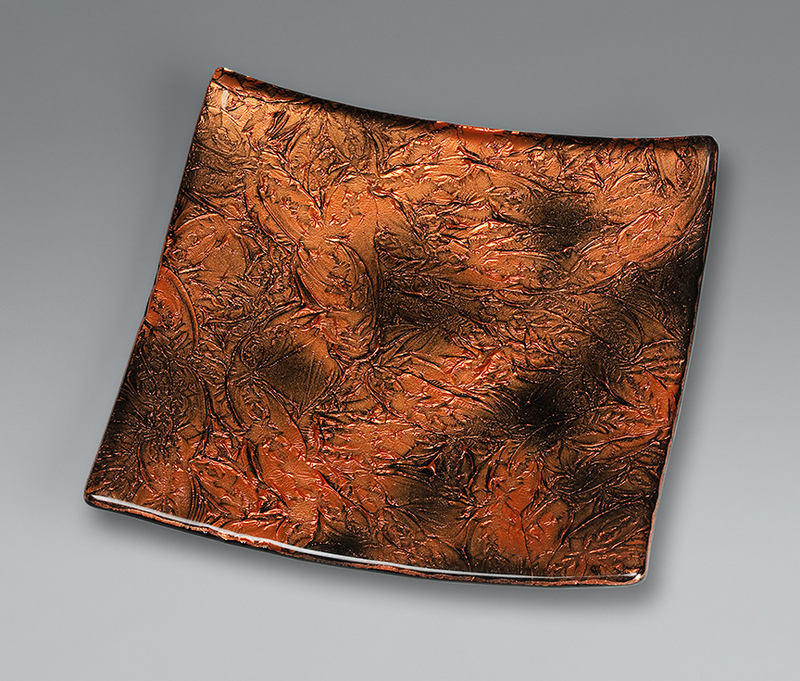 After fusing, there may be cold work necessary to clean up the edges of the plate. 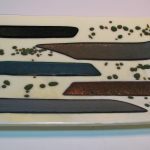 That involves either grinding or sanding with machines that use water to keep things cool. 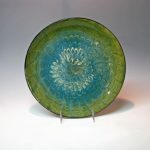 Additional firings may be necessary, depending on the design of the plate and the amount of cold working that was necessary. 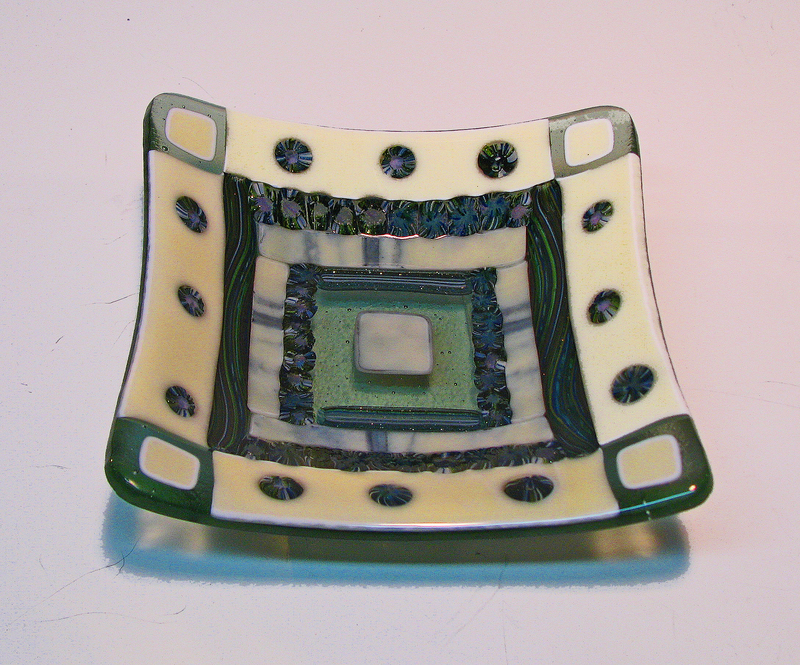 Once the item is ready to shape into the final piece, it is placed back in the kiln on top of a ceramic mold. 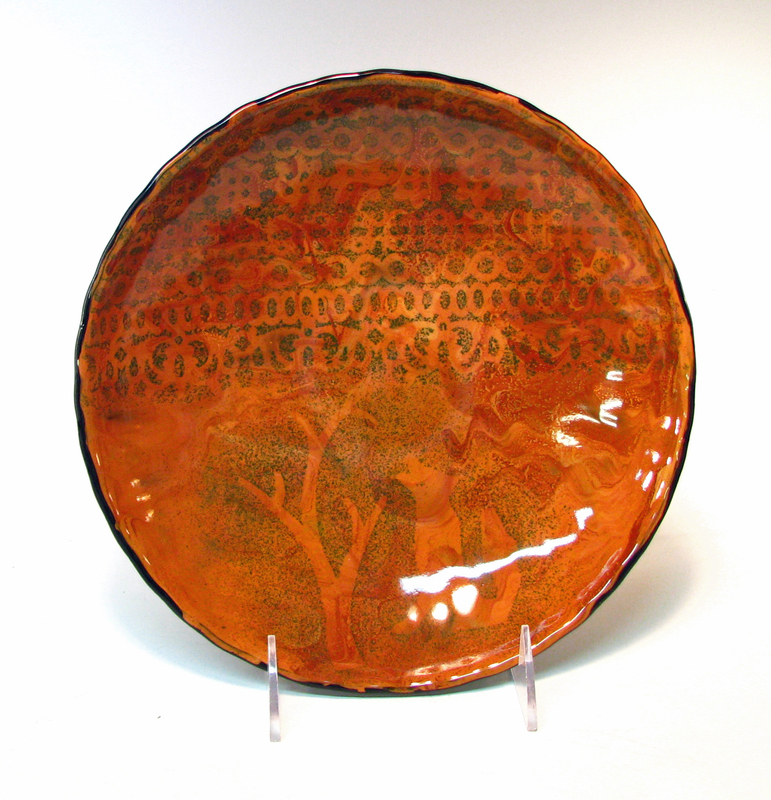 Once again, the kiln is fired, but this time only to the upper 1200s. 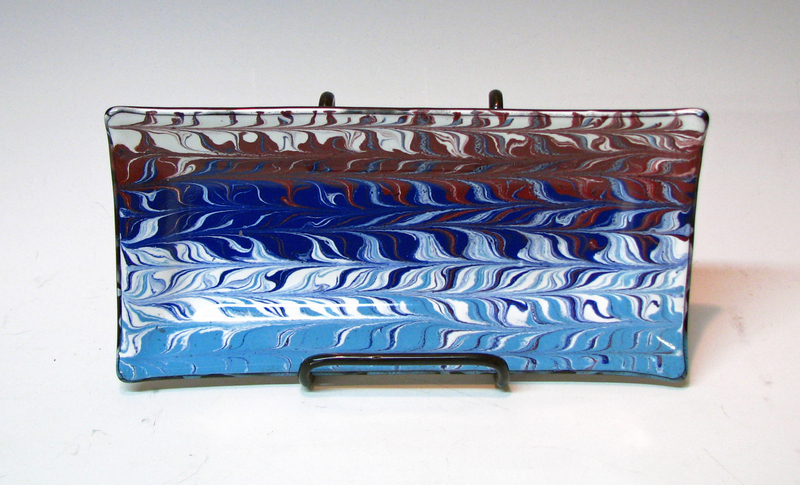 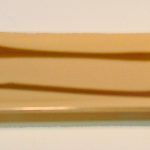 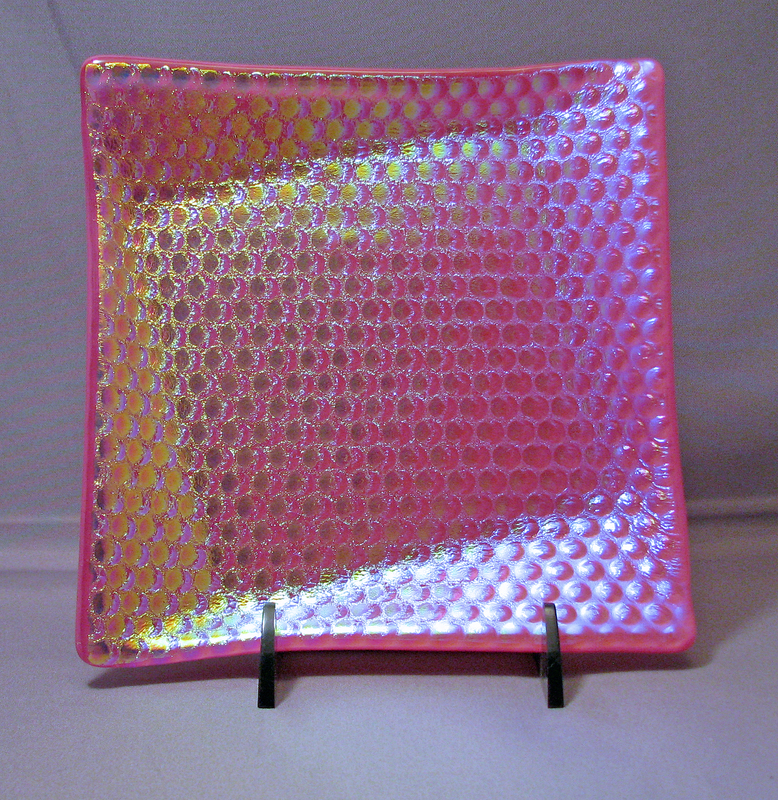 That is enough heat work for the glass to become soft enough to slowly “slump” into the mold and take on its shape. 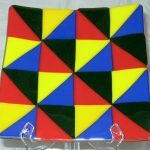 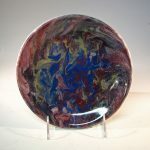 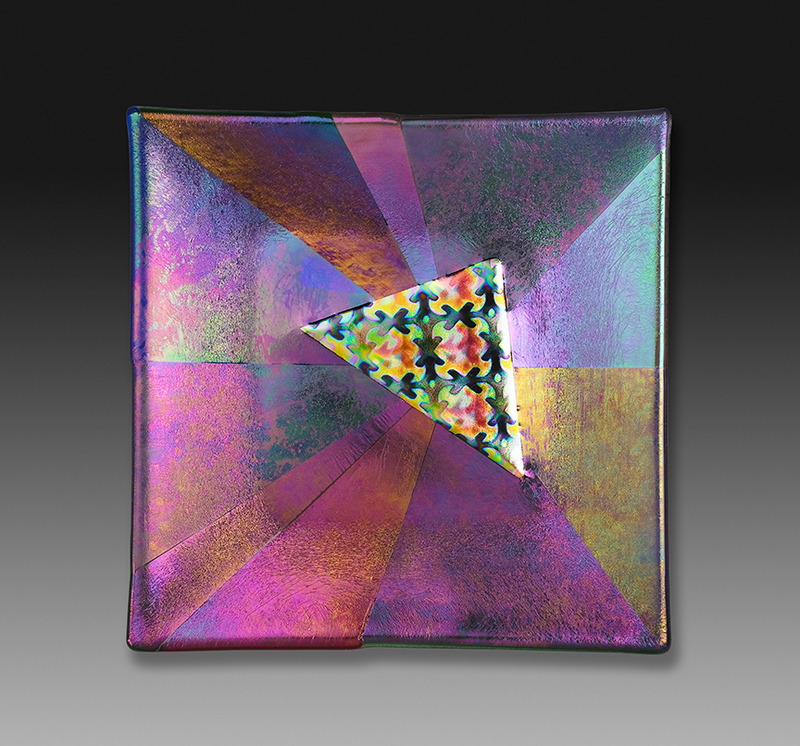 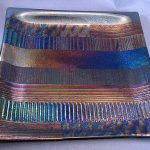 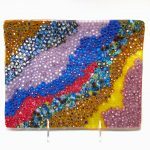 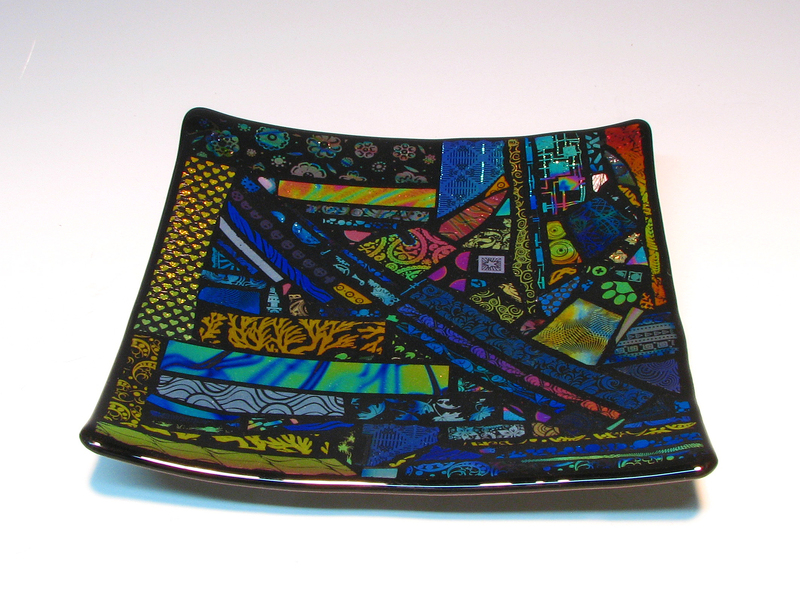 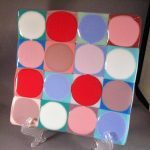 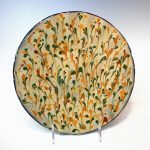 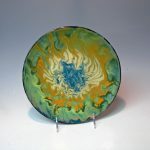 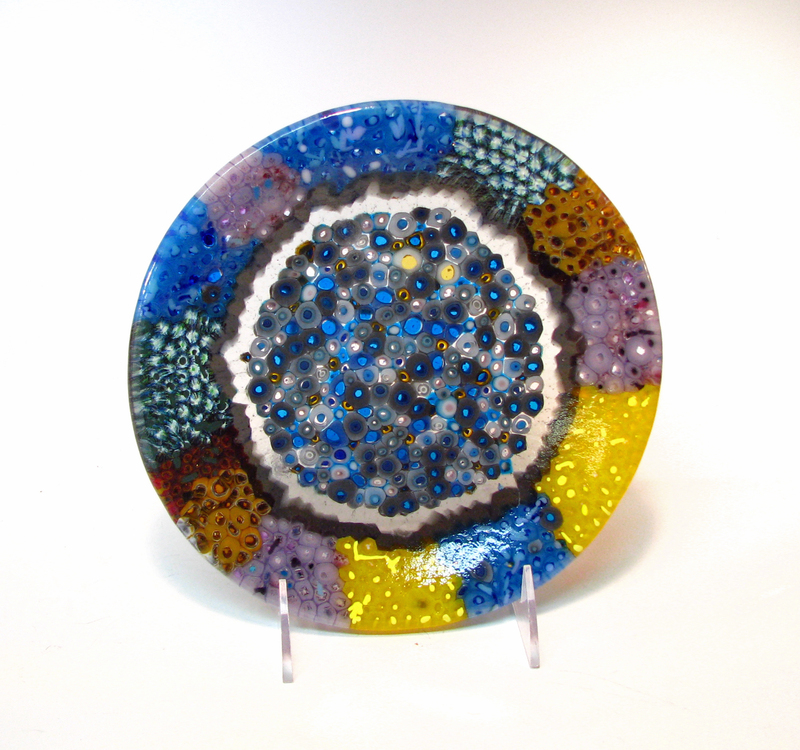 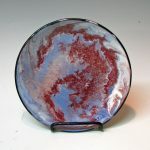 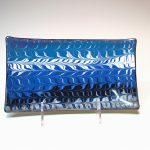 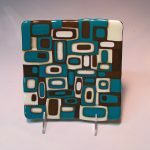 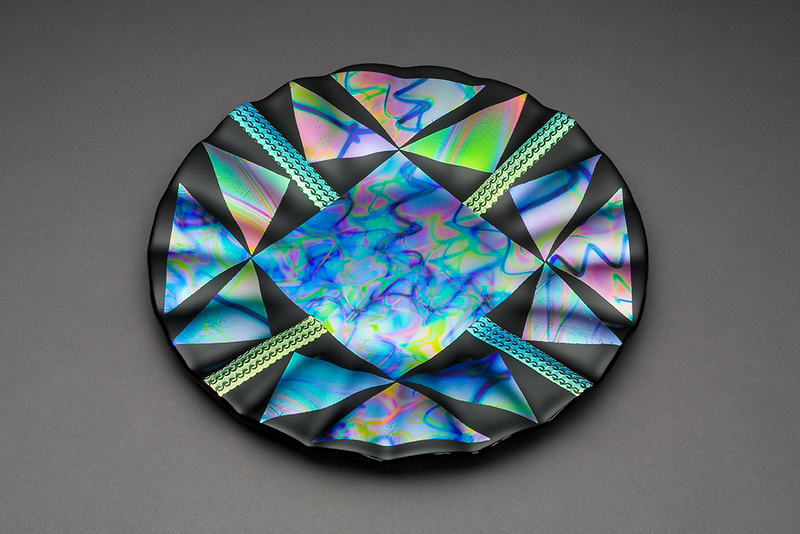 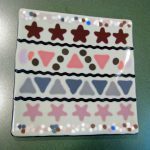 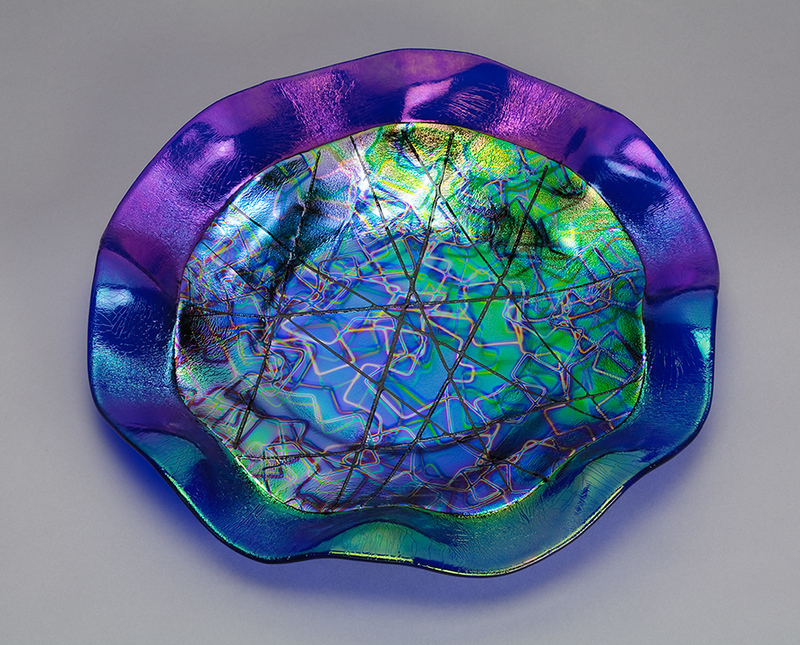 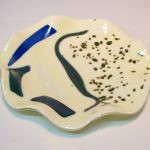 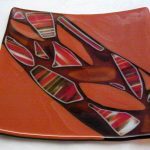 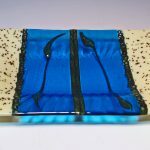 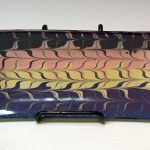 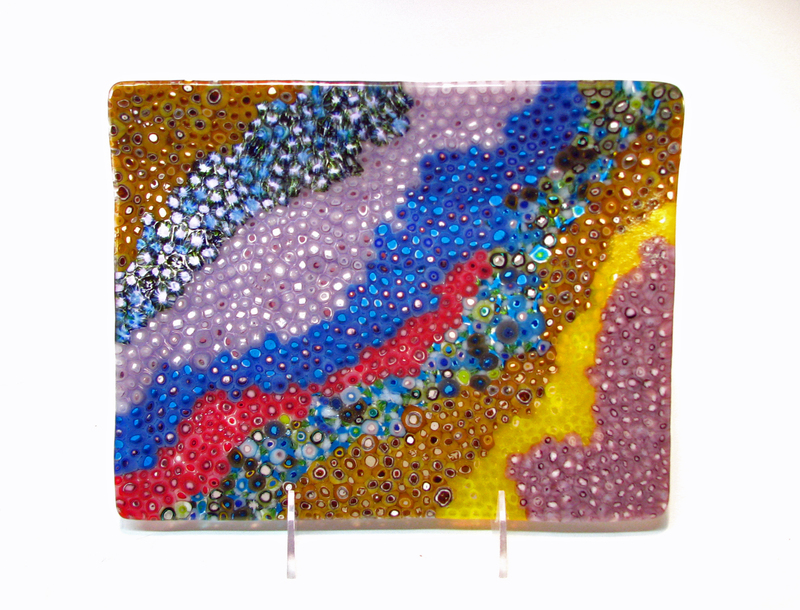 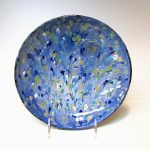 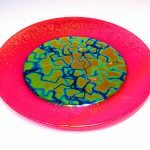 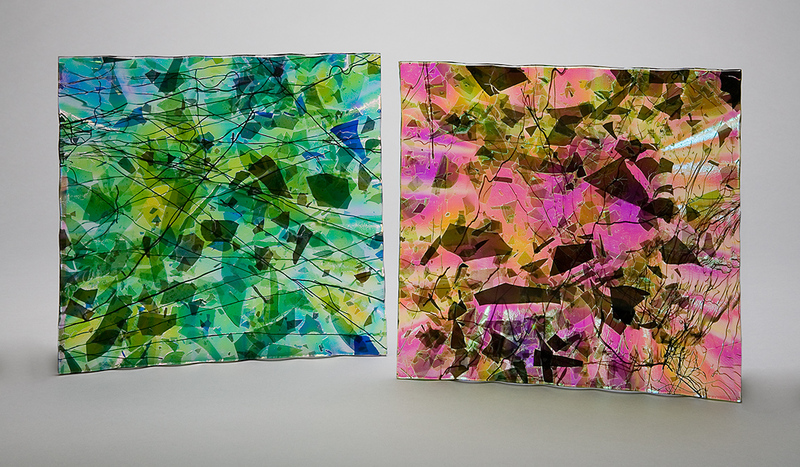 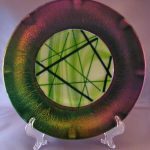 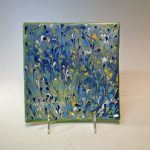 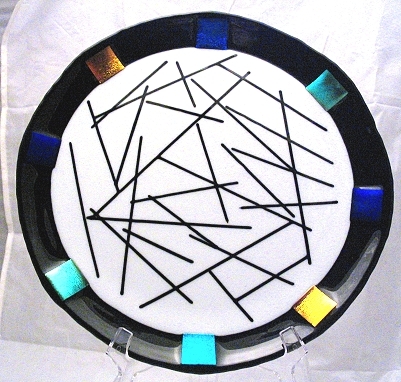 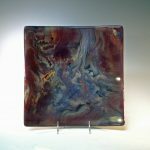 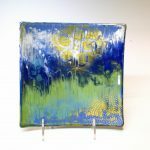 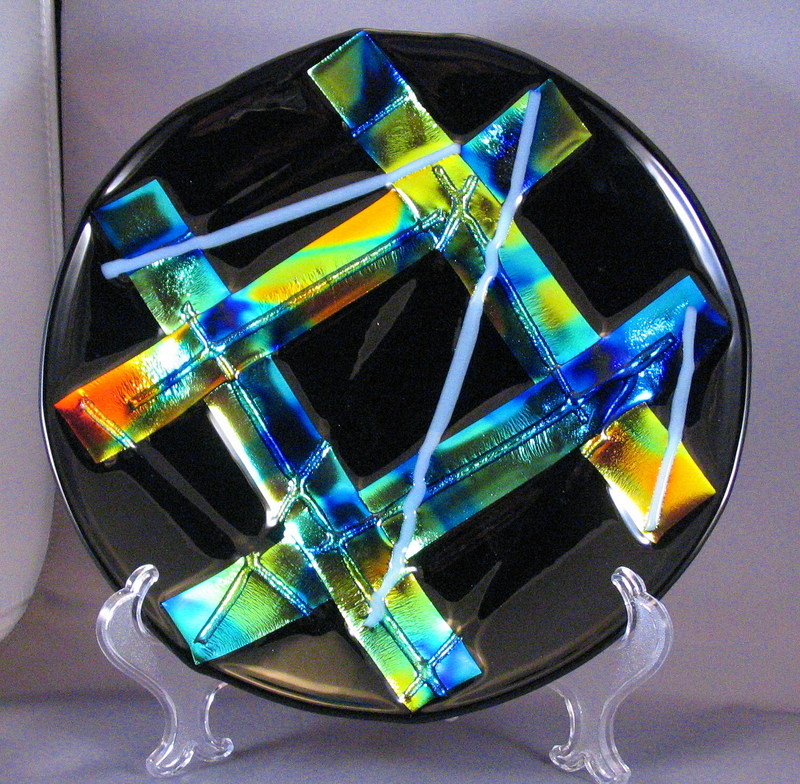 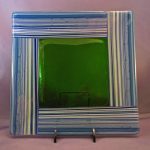 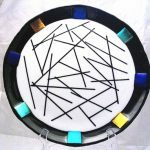 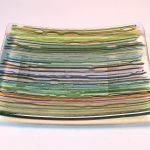 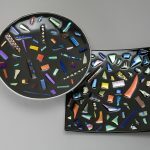 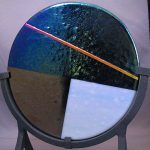 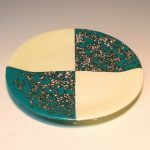 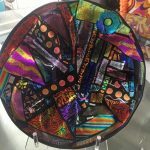 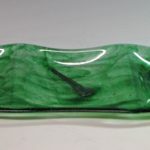 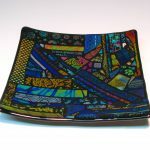 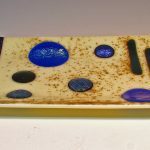 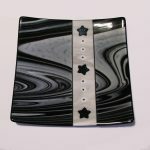 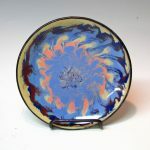 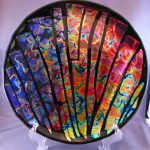 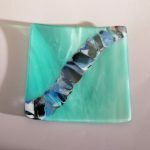 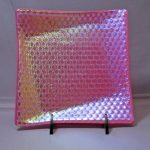 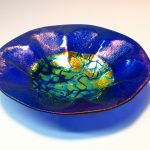 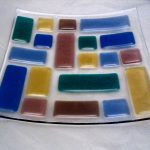 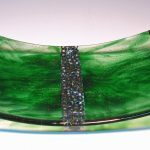 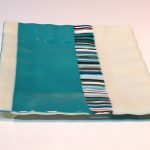 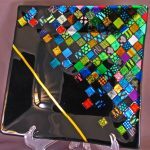 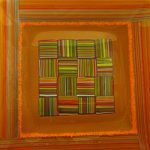 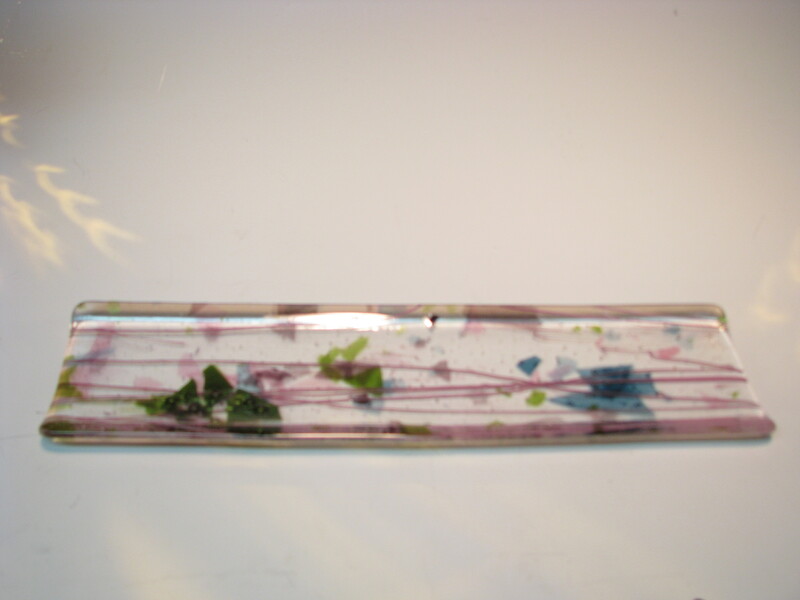 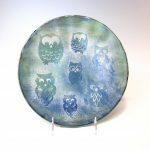 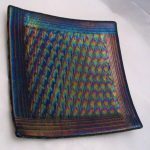 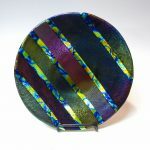 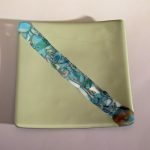 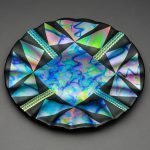 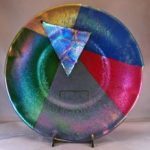 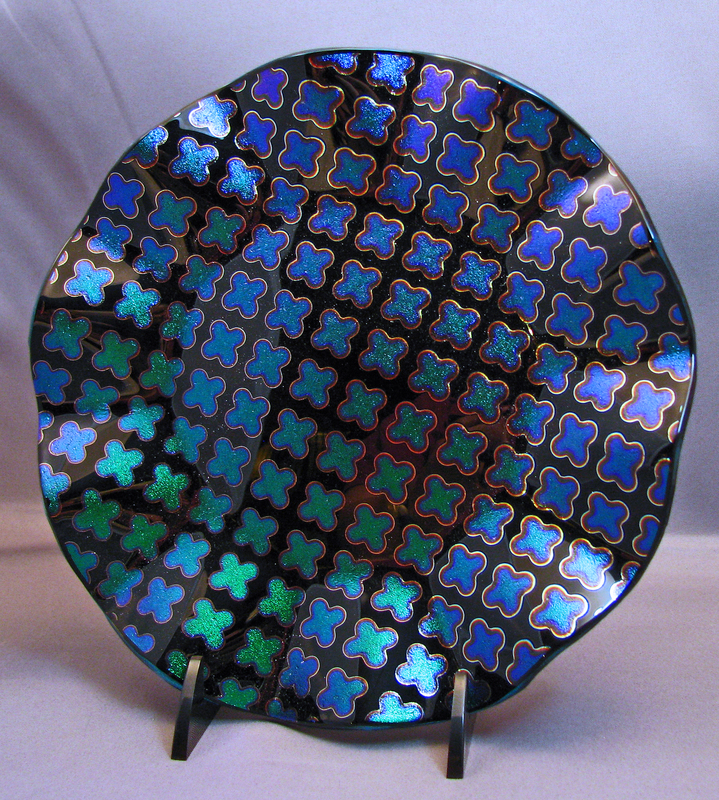 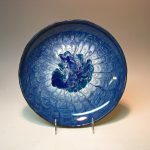 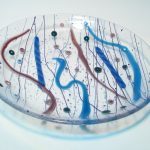 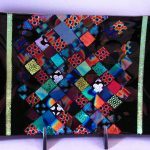 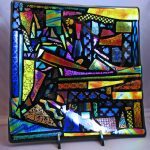 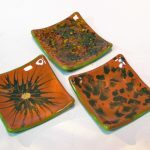 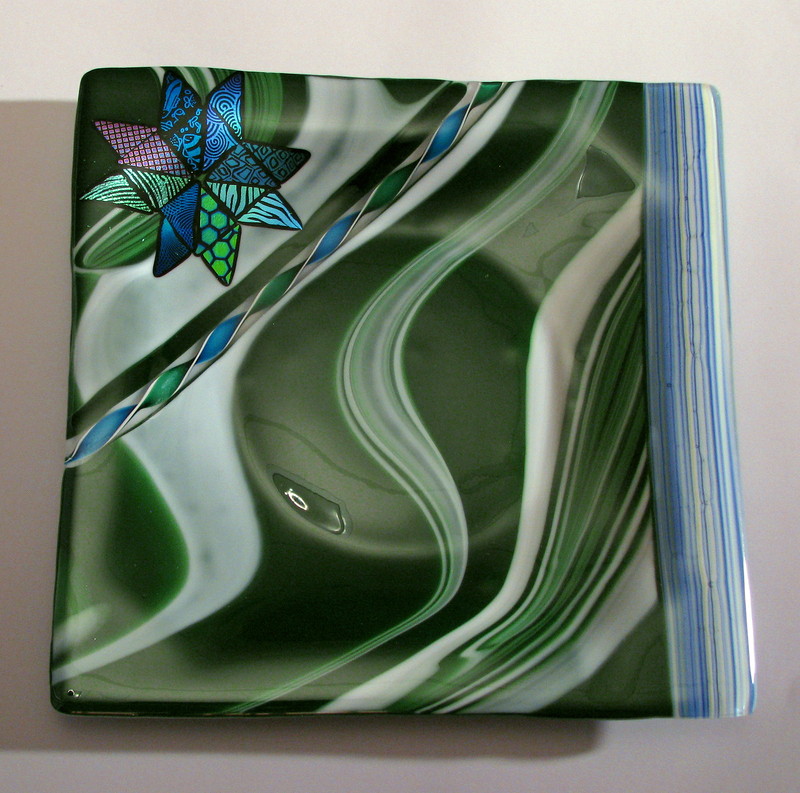 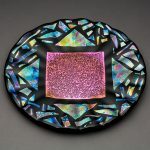 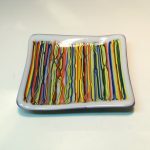 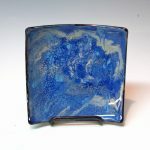 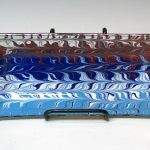 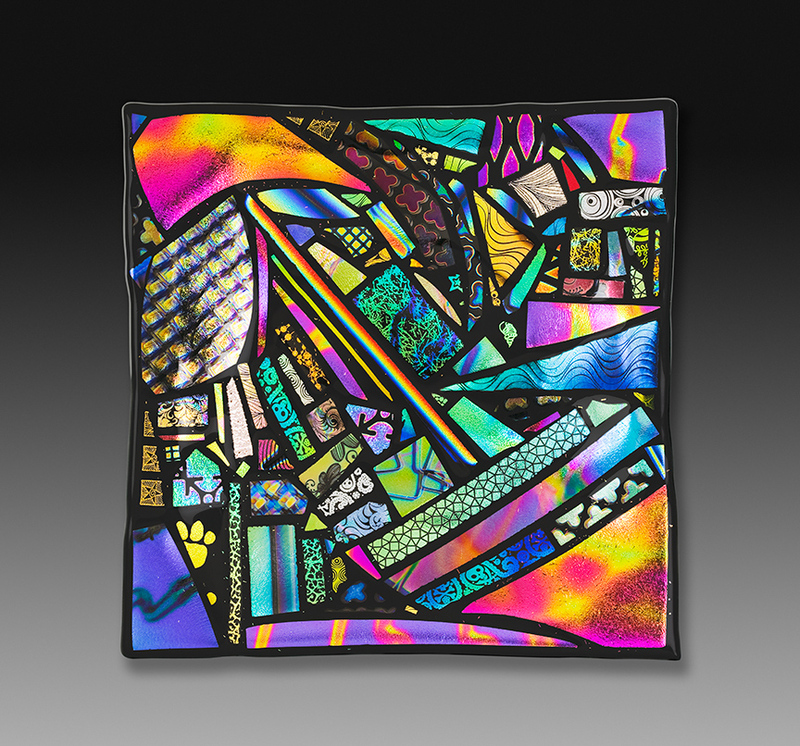 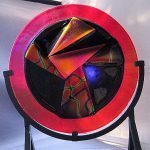 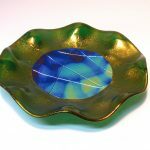 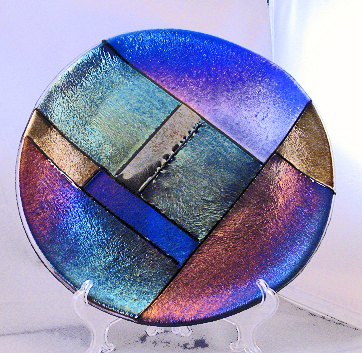 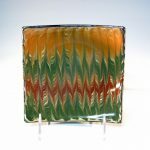 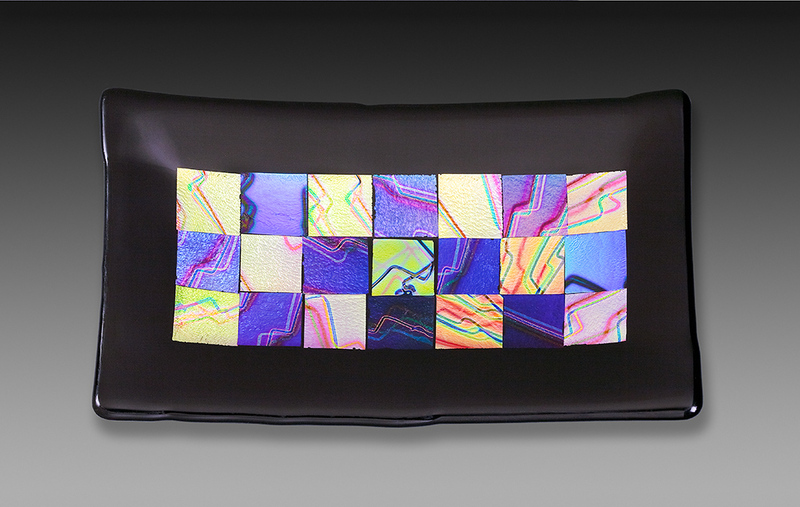 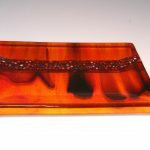 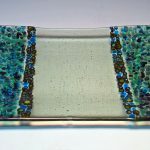 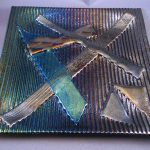 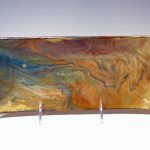 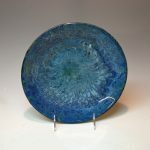 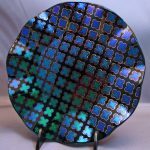 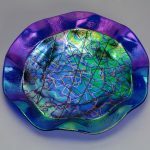 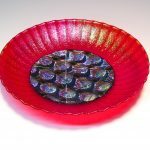 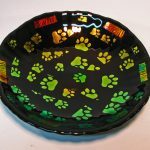 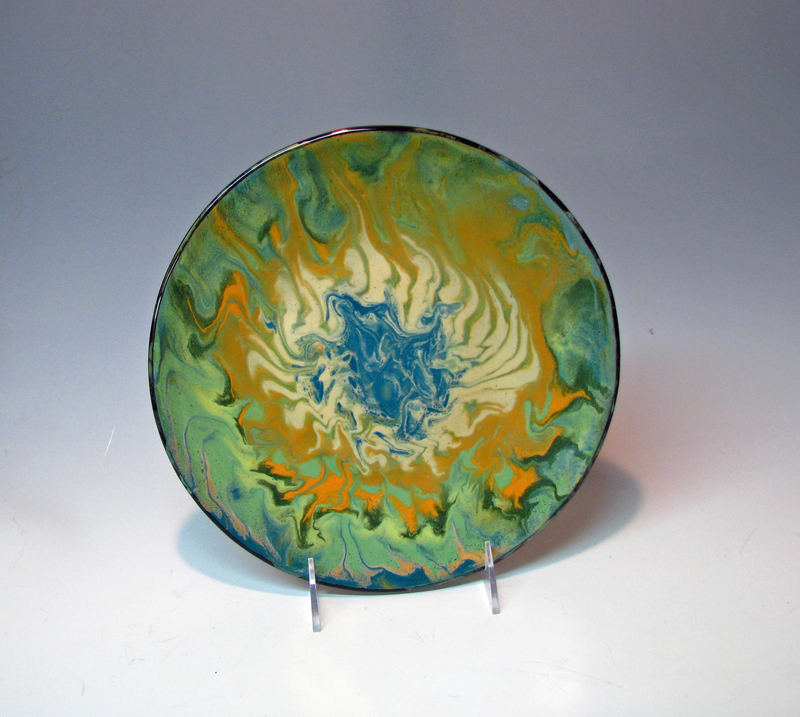 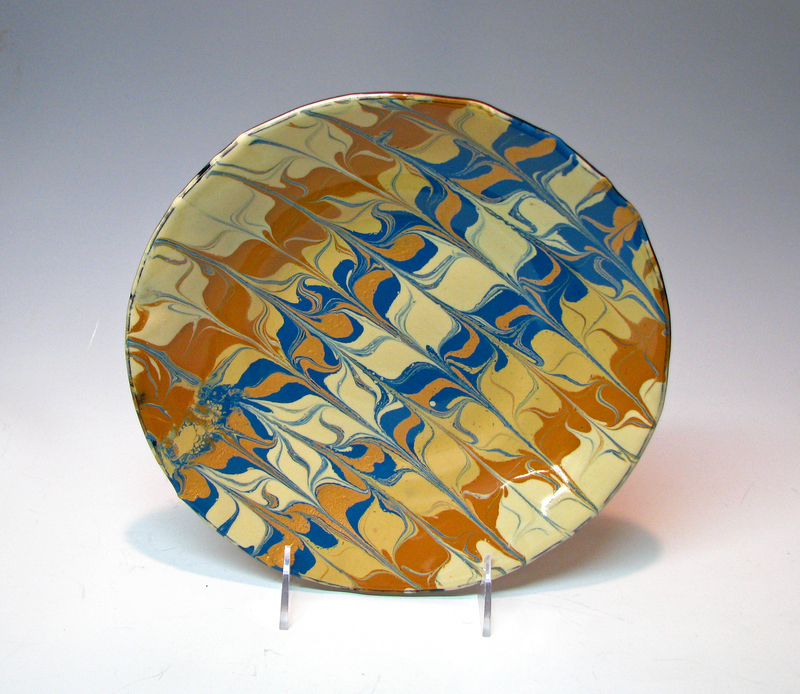 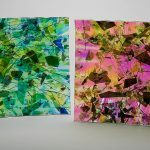 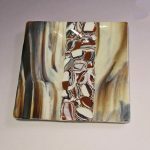 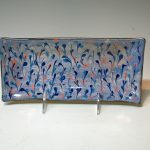 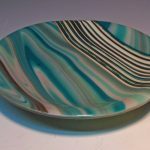 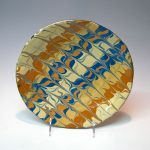 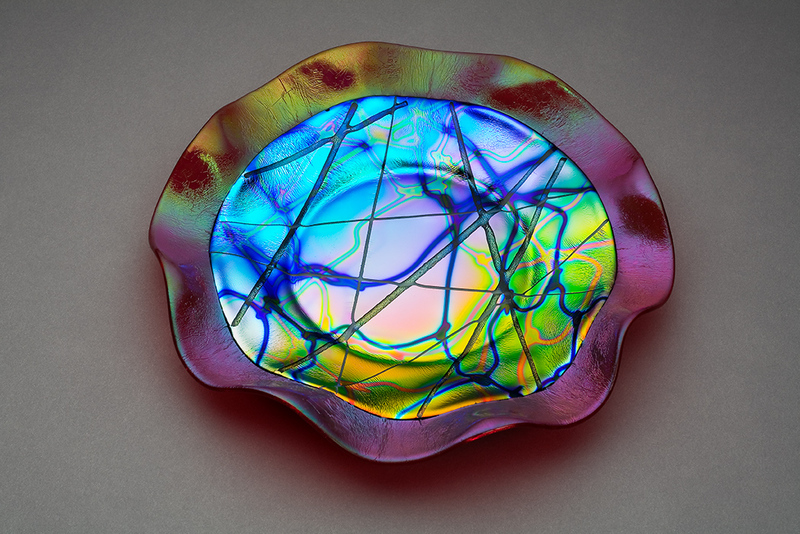 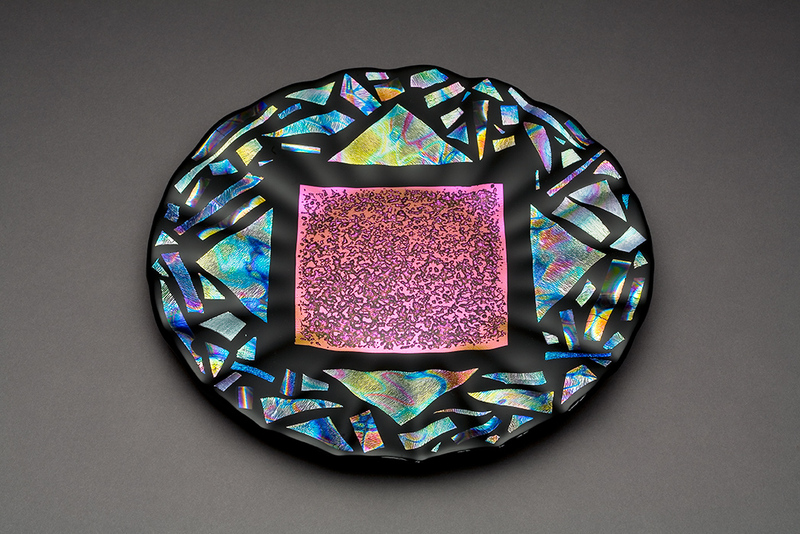 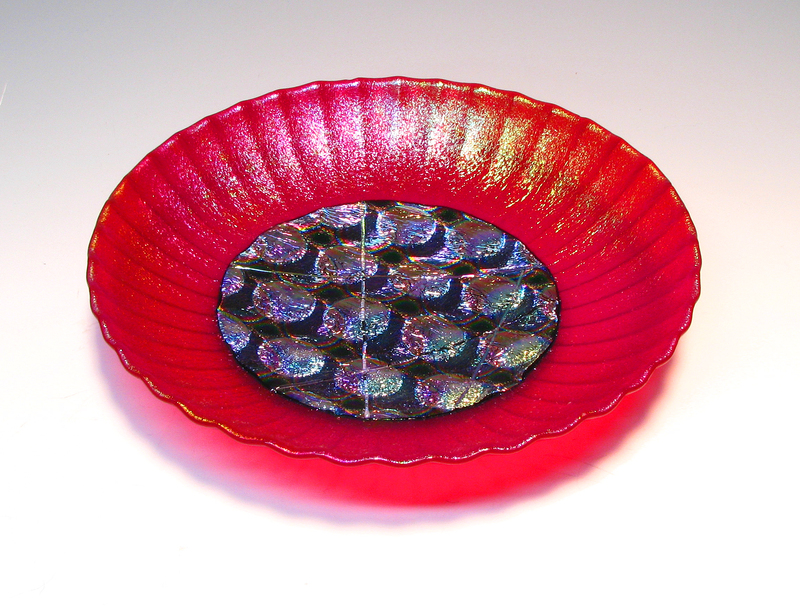 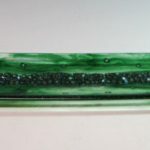 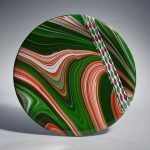 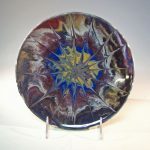 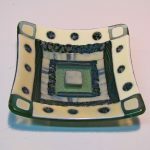 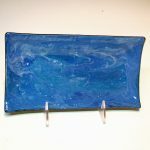 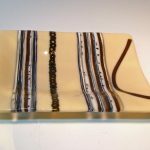 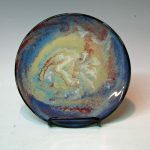 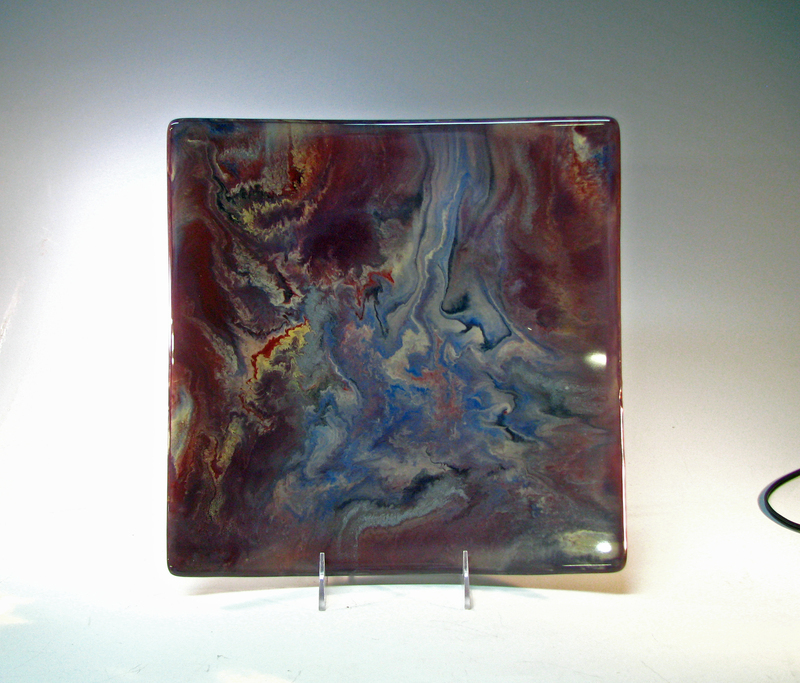 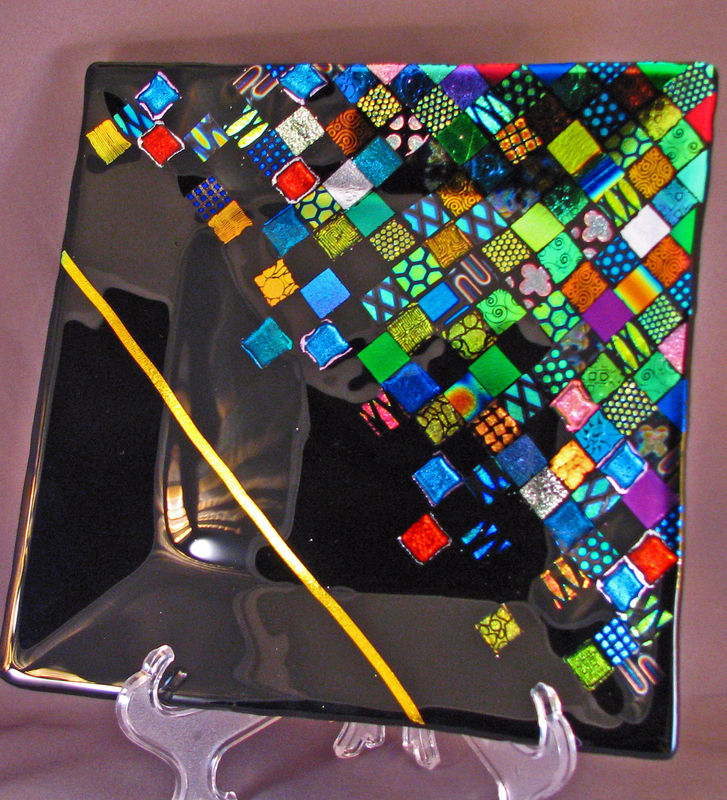 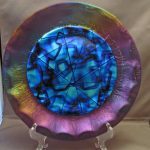 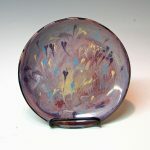 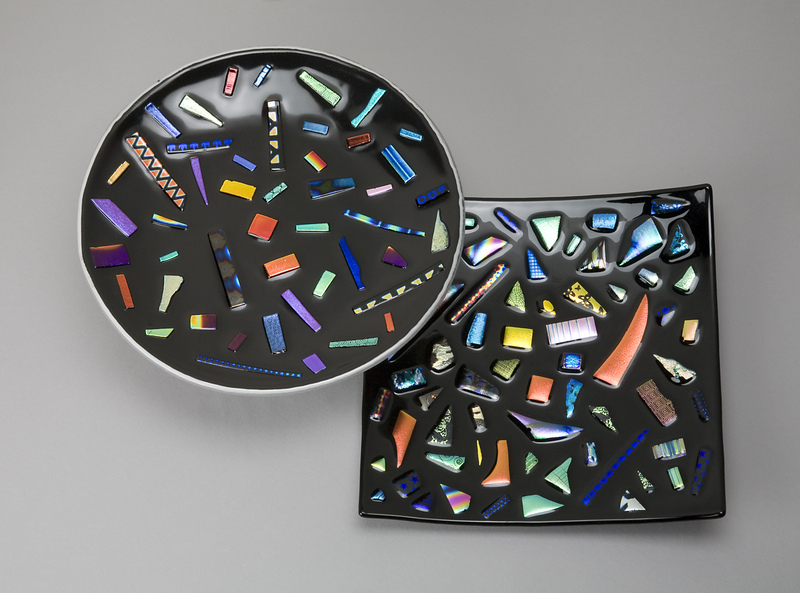 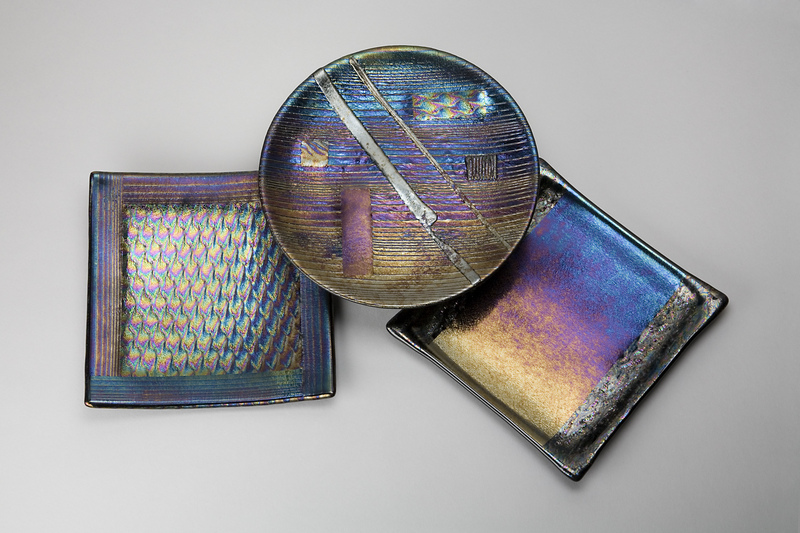 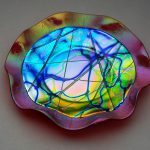 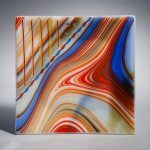 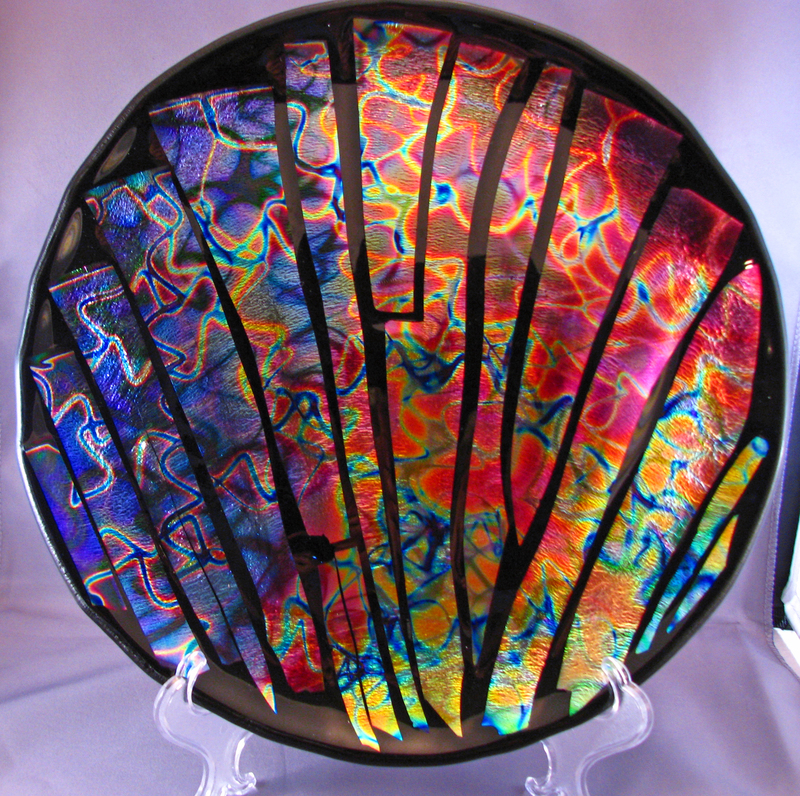 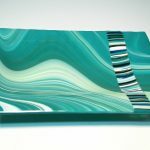 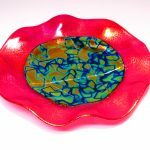 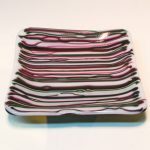 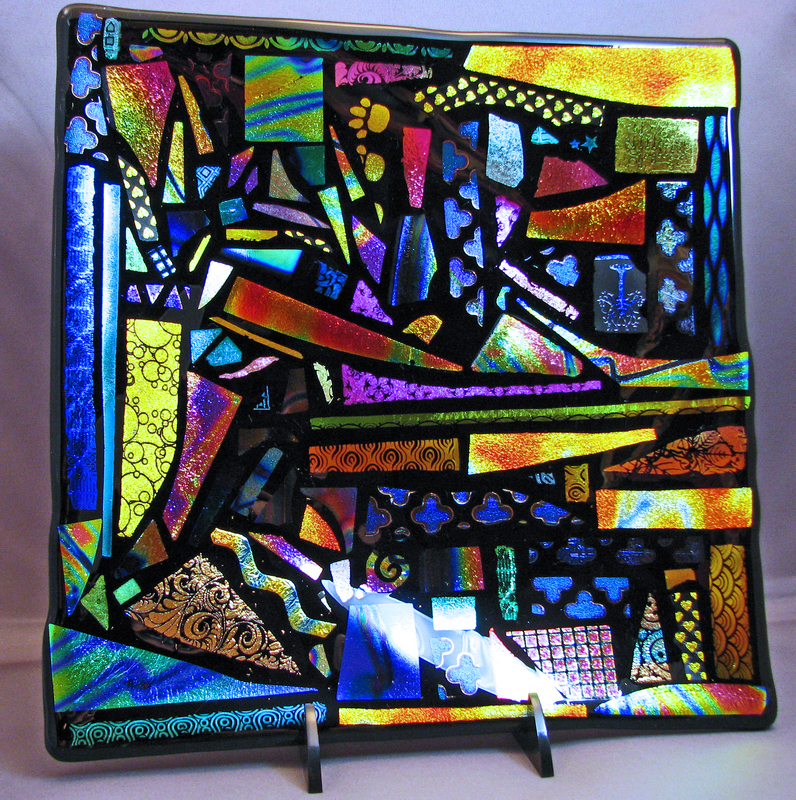 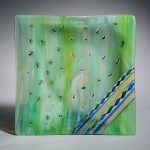 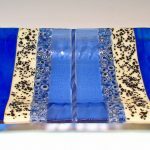 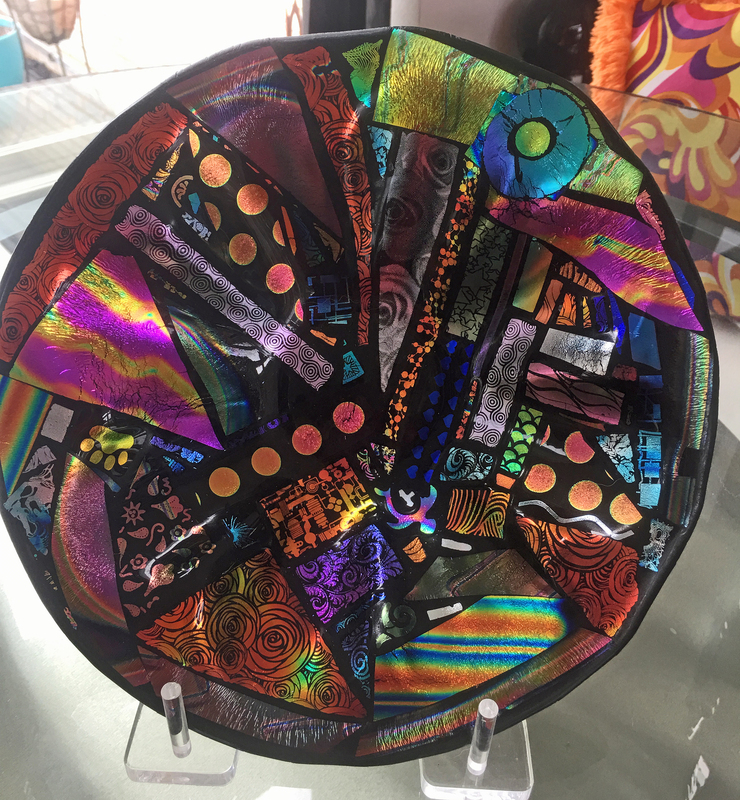 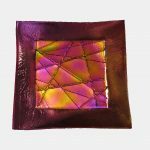 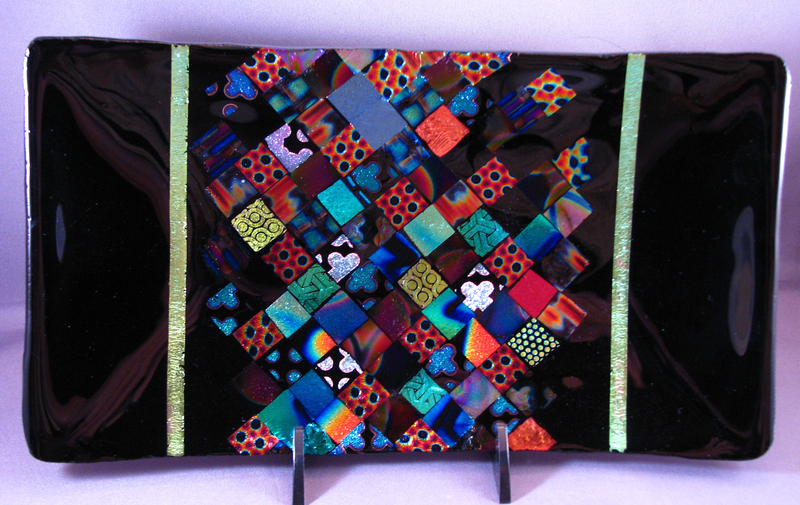 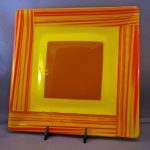 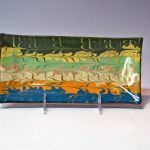 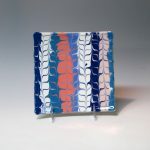 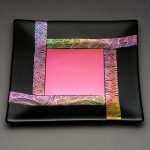 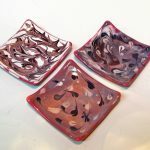 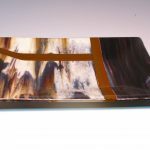 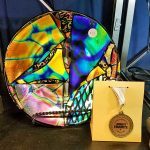 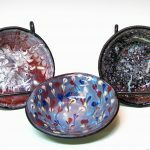 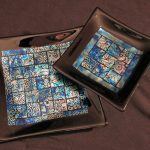 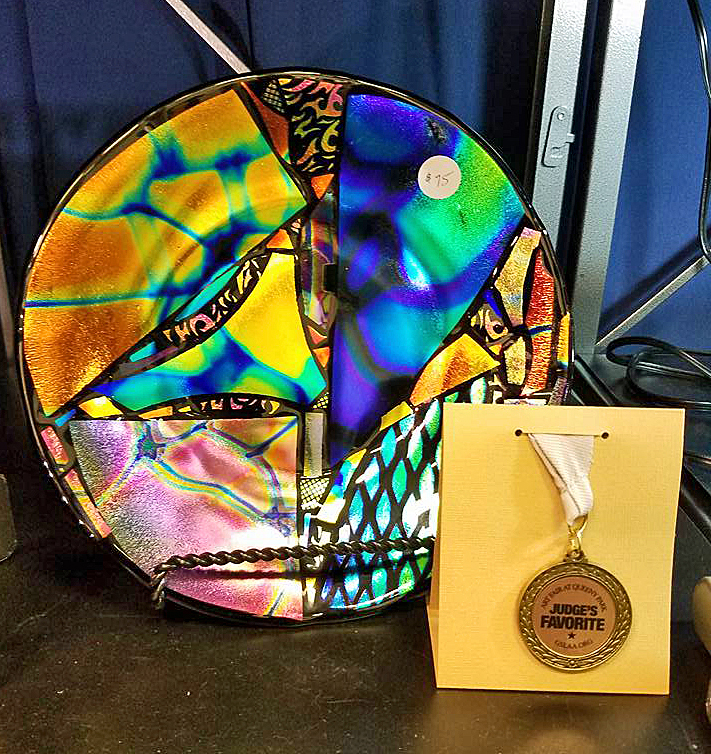 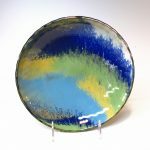 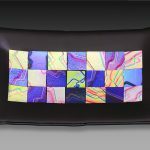 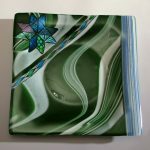 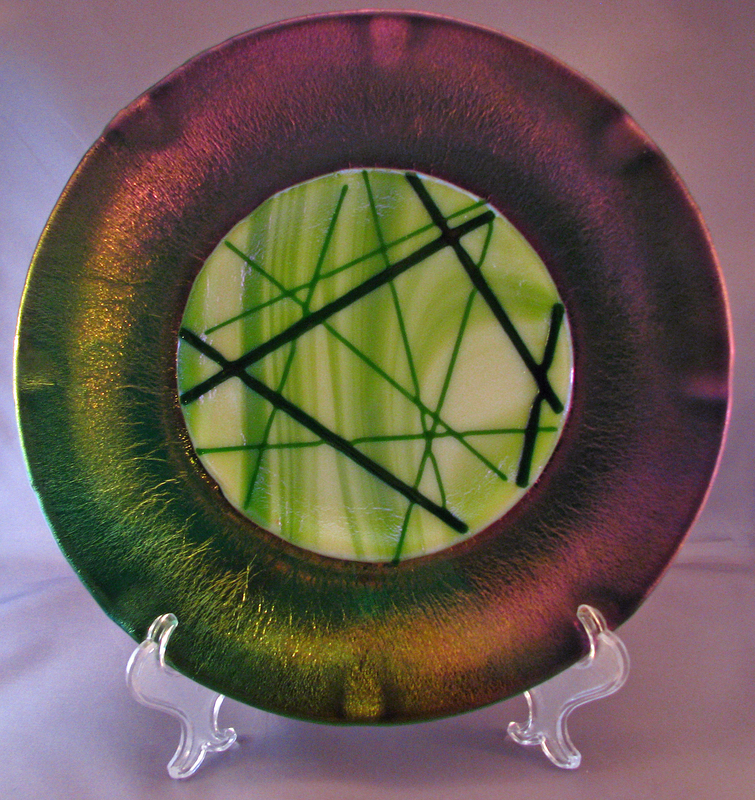 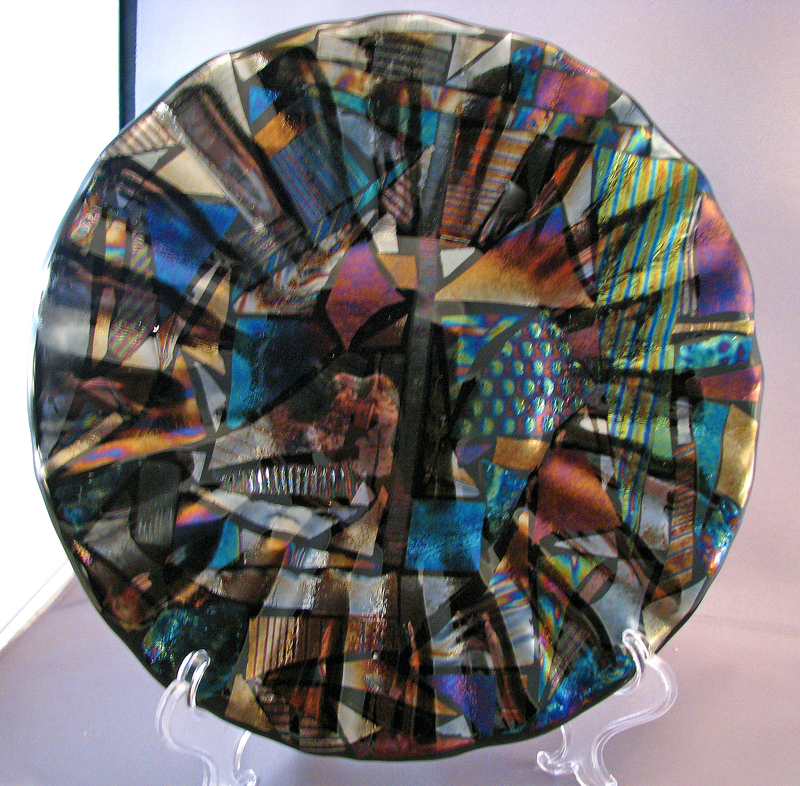 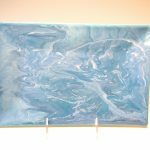 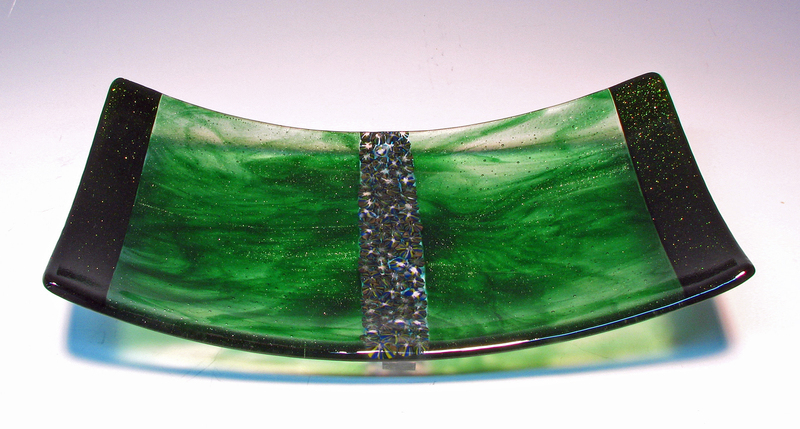 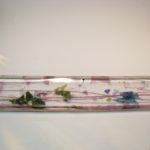 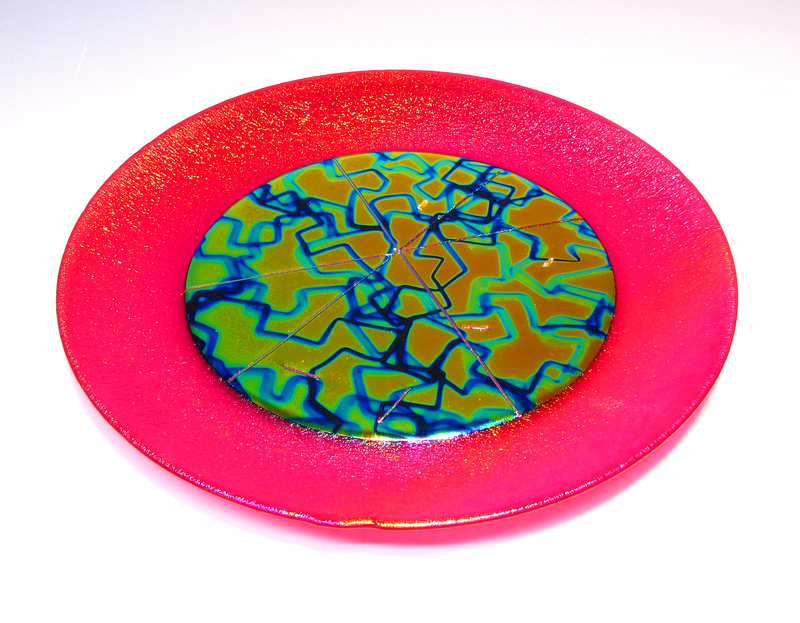 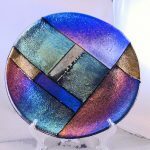 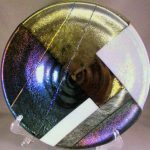 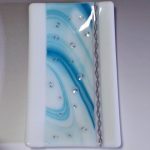 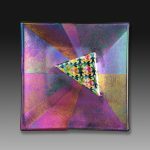 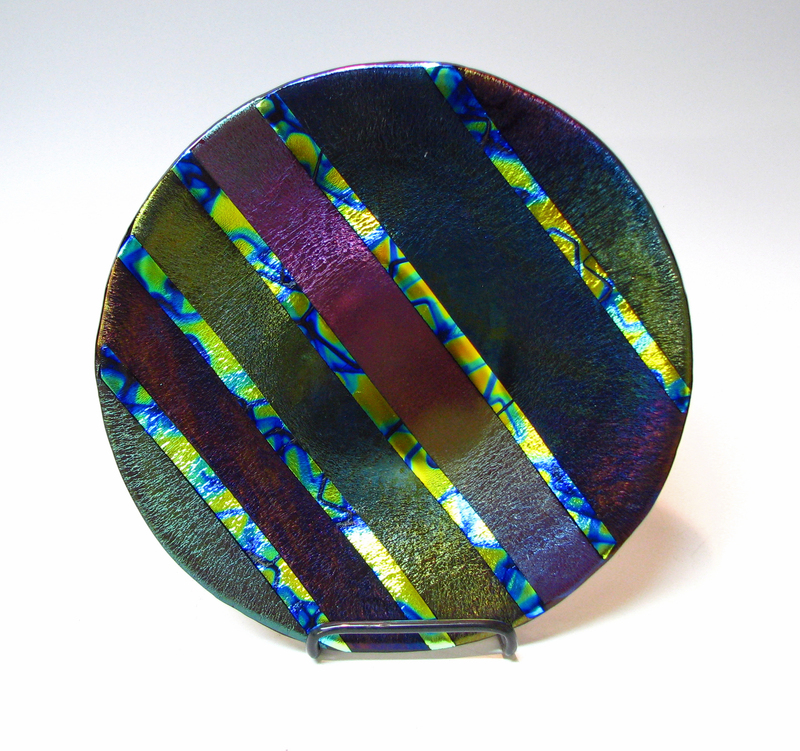 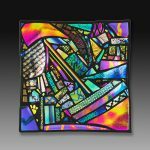 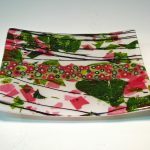 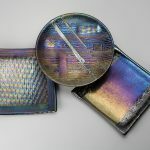 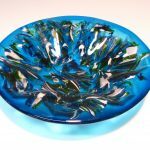 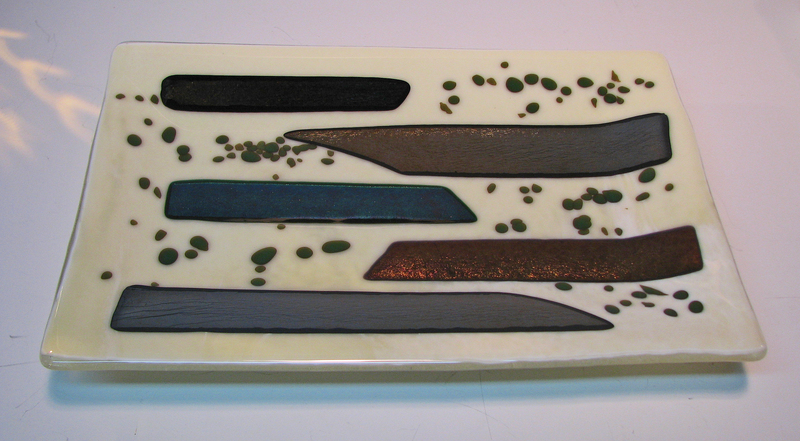 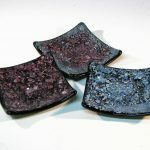 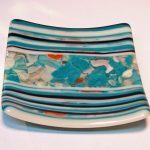 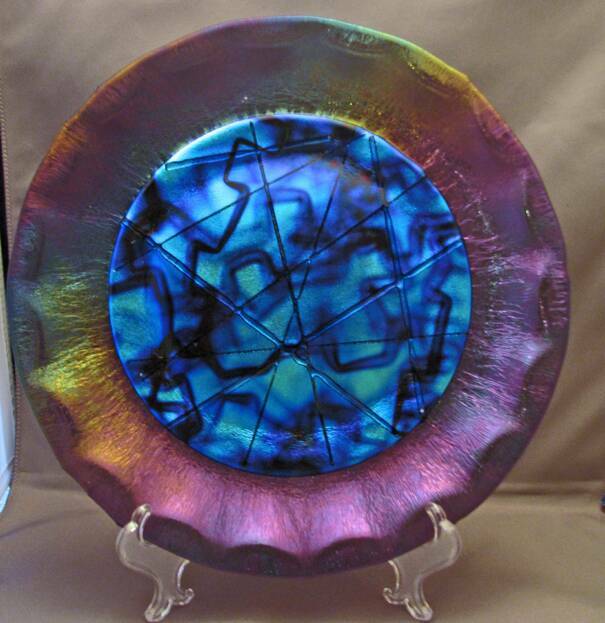 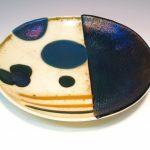 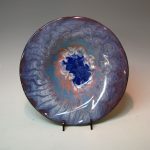 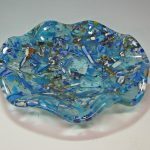 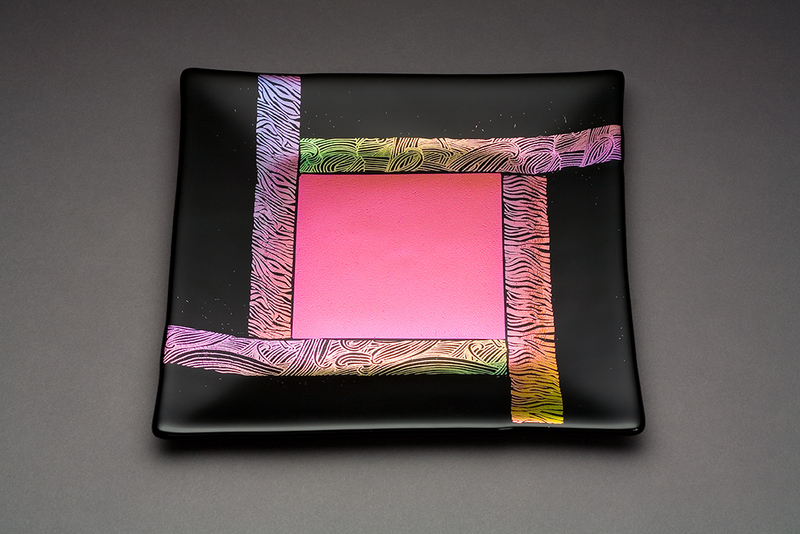 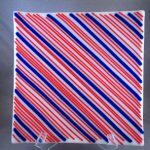 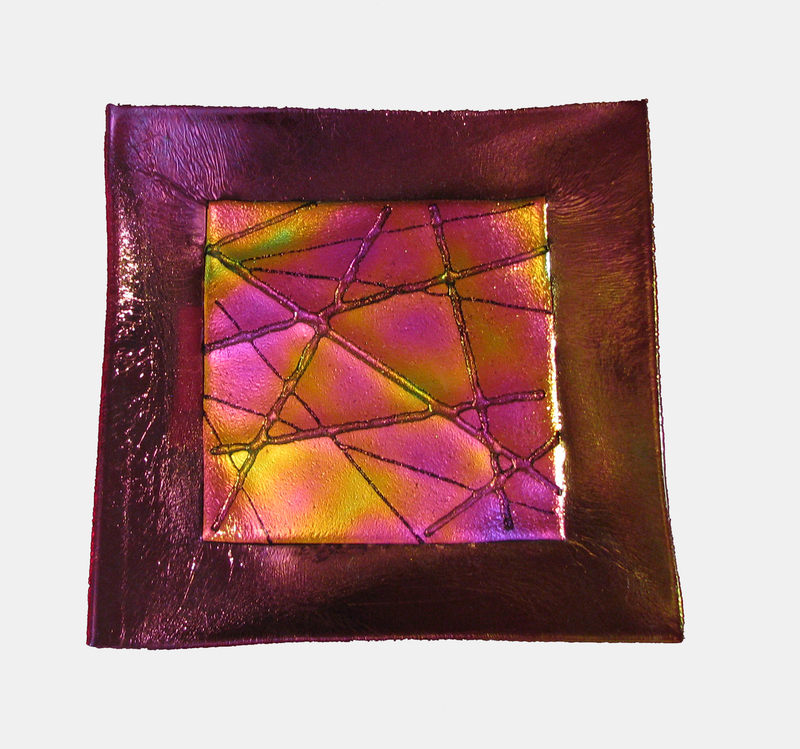 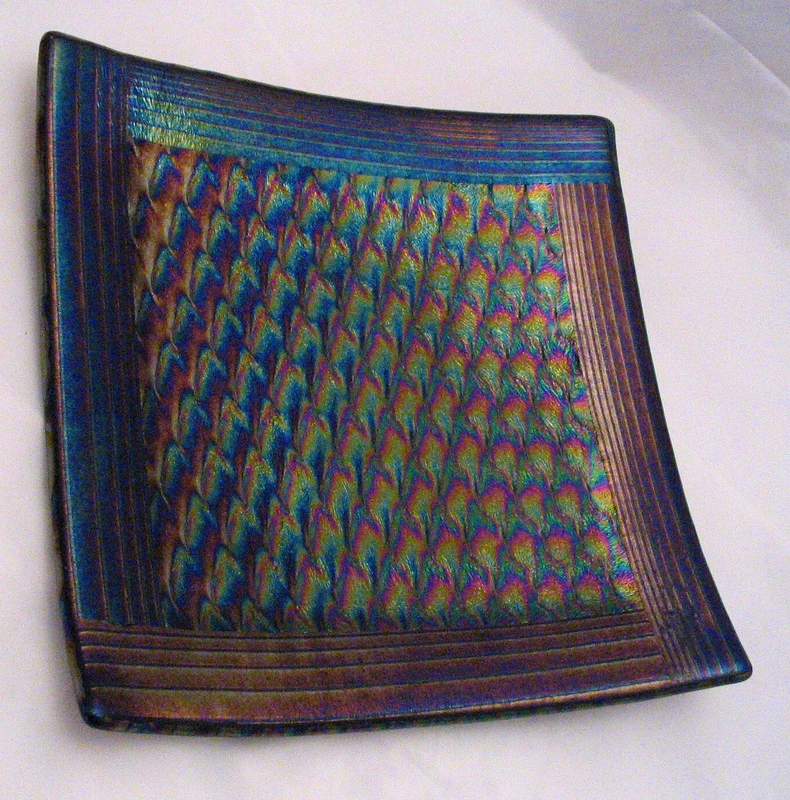 My fused glass plates use dichroic glass, iridized glass, enamels and accessory glasses for decoration and range from about 3.5″ to up to 14″. 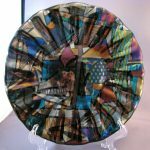 New work in 2018 includes glass plates with enamels.